Collector's notes: Not only RCA produced radio show records, there were other, independent companies who also made such albums. 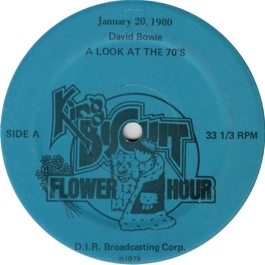 A famous serious of such shows was King Biscuit Flower Hour, in which albums by many popular artists were released. 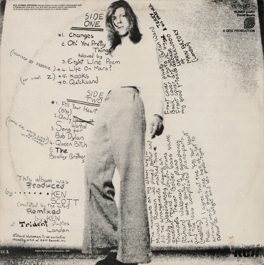 This album, which contains Bowie's personal retrospective of the 1970s, is a really fantastic item: not only does it bring you some of the best music from the late 1960s to the late 1970s, but Bowie's comments are also quite interesting. 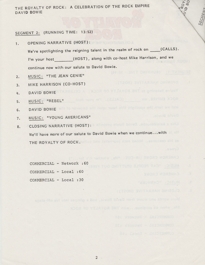 In 1983 the interview was re-released with all music edited out. 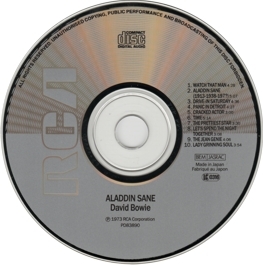 Originally, these discs came with several cue sheets, but since I've only got self-printed copies of them, I don't show them here. 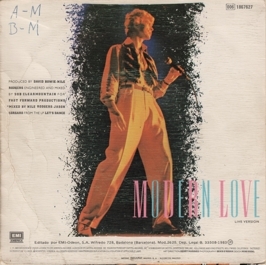 Collector's notes: Jarman gives the release date 12/1979 for this single, but what strikes me as odd is that the label has the "printed"-dates "72/75/80". 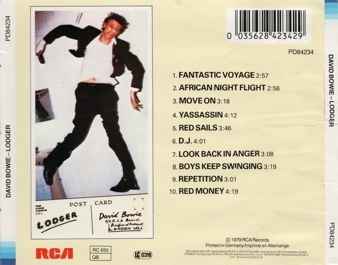 The first two years are logical - that's when the songs were recorded. 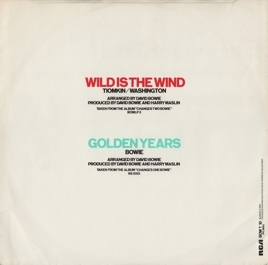 But "80" can only be the year of release. 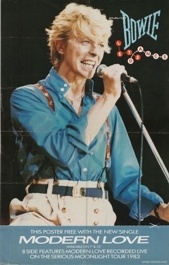 So I'll go for January 1980. Collector's notes: A nice collection of the three Arnold Corns tracks. Since the label is a rather faithful reproduction of the original B&C label design, this record is often falsely assumed to be an official product from the early 1970s. 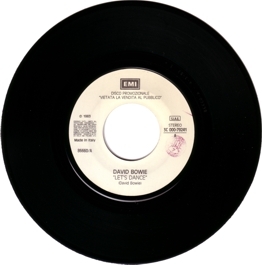 Collector's notes: There may be re-pressings with black labels. 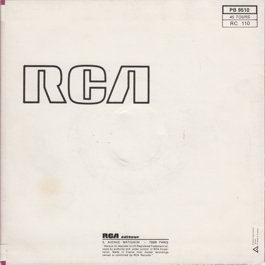 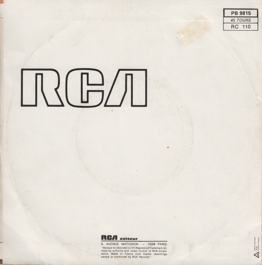 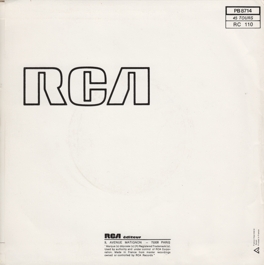 Collector's notes: By now, a bit of copyright text had been placed left of the RCA logo on the label. 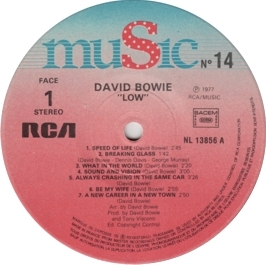 This revised plastic-moulded bronze label was used for quite a while. 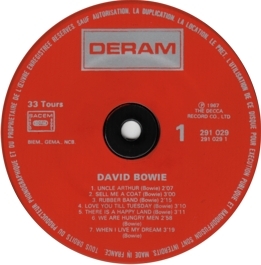 Collector's notes: According to Jarman, there are two different label colours (brown and tan) and two variations of the label design. 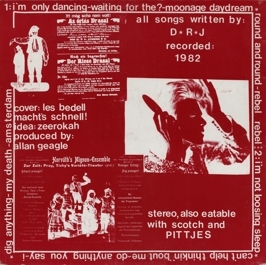 Originally, I listed this record under 12/1978 (following Jarman), but as Colin McIntyre has pointed out to me (thanks! ), the "A280B" on the cover back is a release date code that points to February 1980. 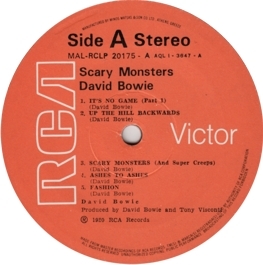 Collector's notes: The Bowie side was a re-released later that year with a different B-side. 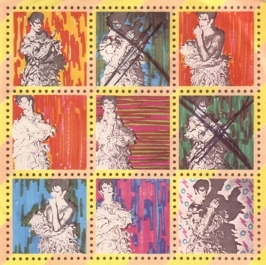 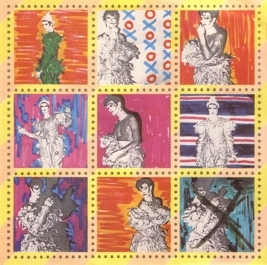 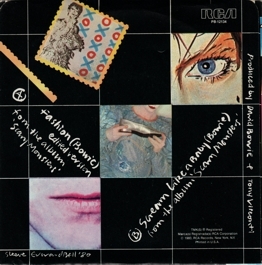 Collector's notes: The UK issue of this single came in three different covers with four different stamp inserts. 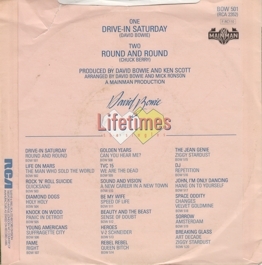 There doesn't seem to be any system as to which insert was distributed with which cover. 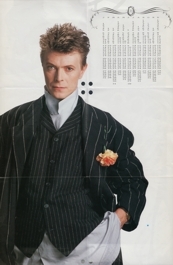 So theoretically, there are twelve different combinations. 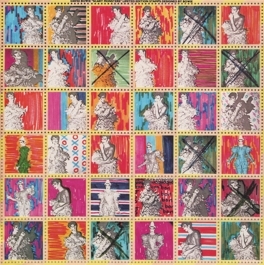 I have heard that there are collectors who actually try to collect all these possible combinations. 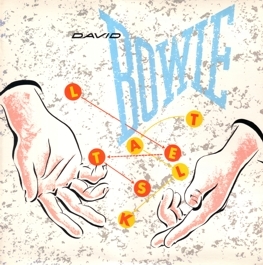 Well... good luck! 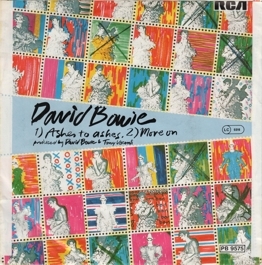 I'm content to have all three different covers and all four different inserts. 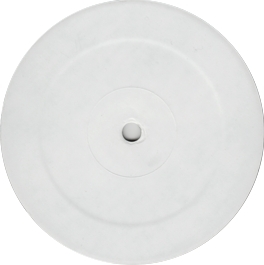 Furthermore, there are copies with a solid centre (like this one), and copies with a push-out centre (like the one in the next entry). 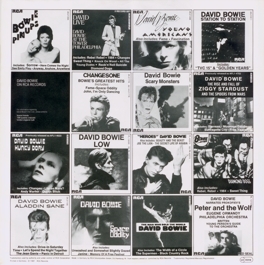 24 combinations, anyone? 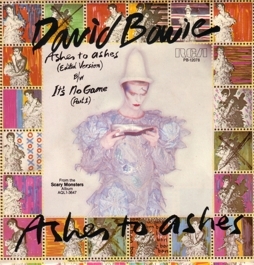 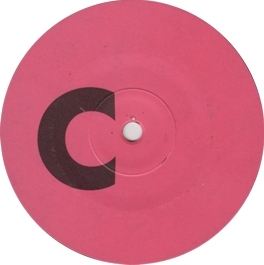 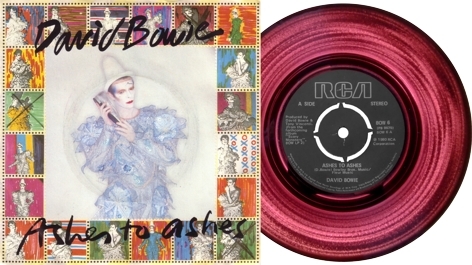 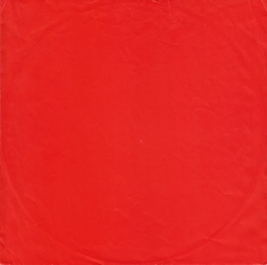 Collector's notes: Some copies of the Ashes to Ashes UK 7" were made of "contaminated vinyl" (as Jarman puts it), and are thus translucent dark red. You only realise this if you hold the record against the light; otherwise it looks plain black. 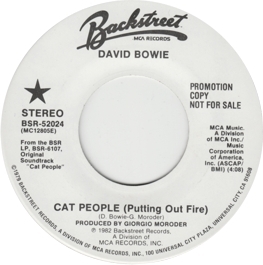 In fact, it took me years to discover that this copy is actually of this kind. 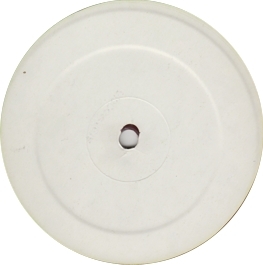 For the picture shown here the record was held against a strong light. 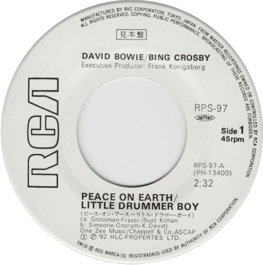 Same labels as in this entry. 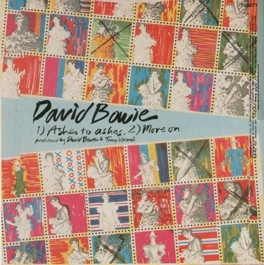 Collector's notes: A funny (though not particularly exciting) mis-pressing - it hasn't got any labels at all. 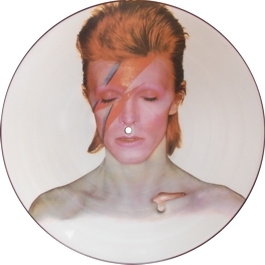 It would of course be more interesting if it was made of translucent vinyl, but it isn't. 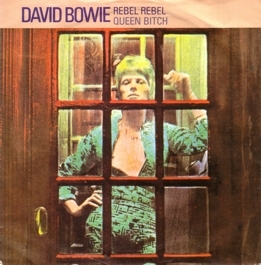 Same cover as in this entry. 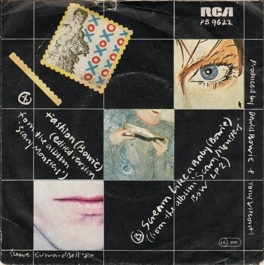 Collector's notes: Same cover and record (and hence labels) as in this entry. 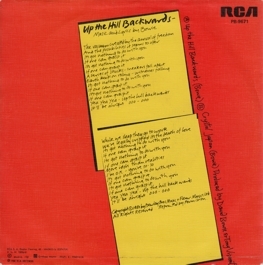 Collector's notes: A minor cover variation: the lettering has a red "shadow". 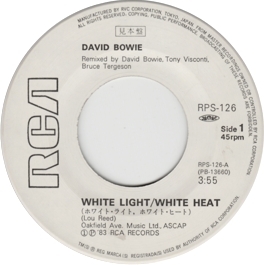 Collector's notes: An interesting cover variation - the Italians preferred white to black text. 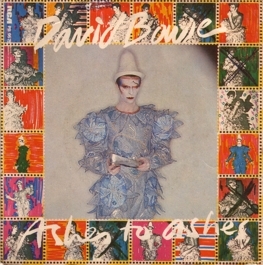 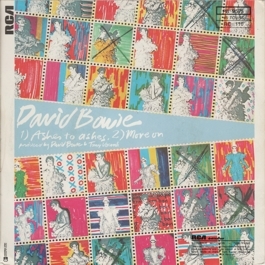 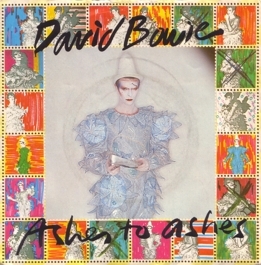 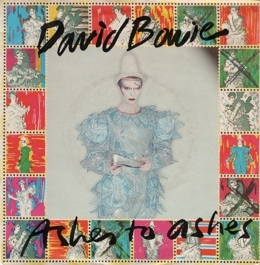 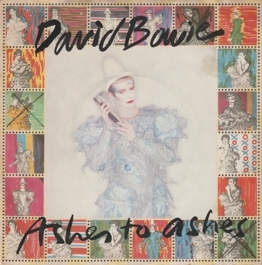 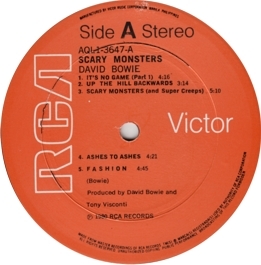 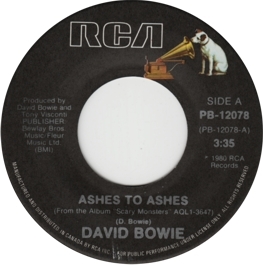 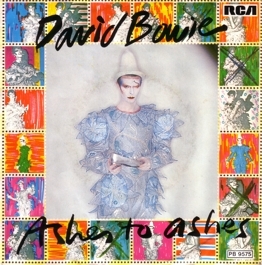 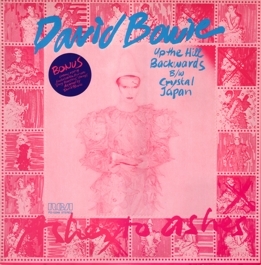 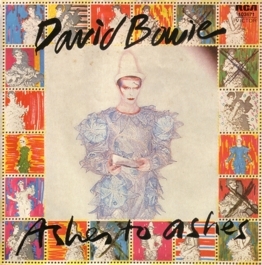 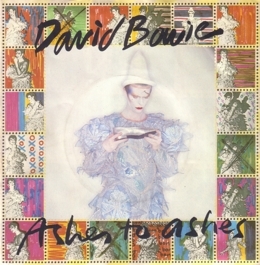 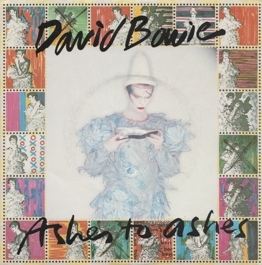 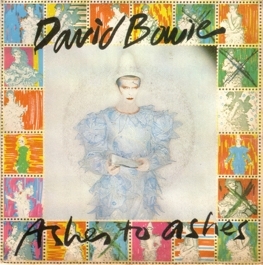 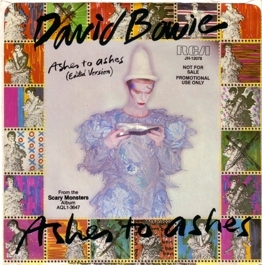 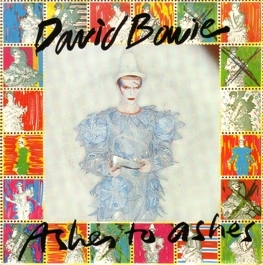 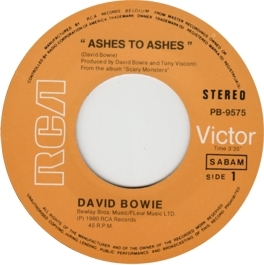 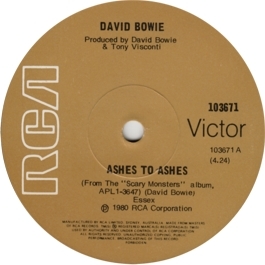 Note that they also confused the "printed" dates for the A-side and the B-side on the labels: it's "79" for Ashes to Ashes and "80" for Move On. 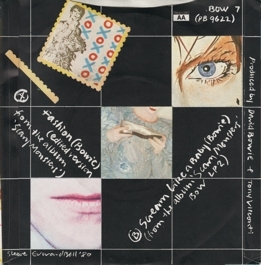 Collector's notes: Same cover as in the previous entry. 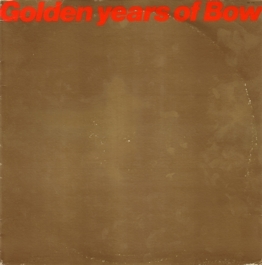 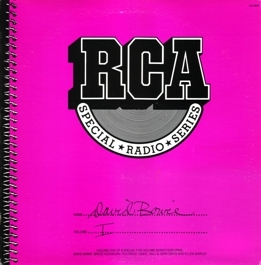 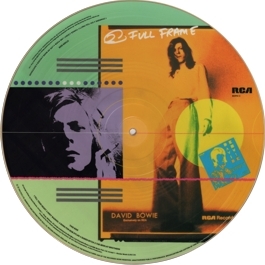 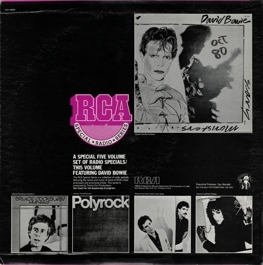 Collector's notes: The first in a rather long line of Germany RCA 12" singles by Bowie. 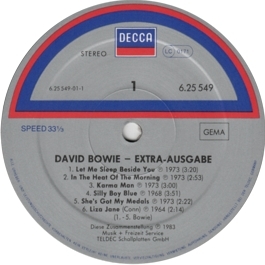 Note that the Germans obviously used the standard LP labels and blackened out the preprinted playing speed. 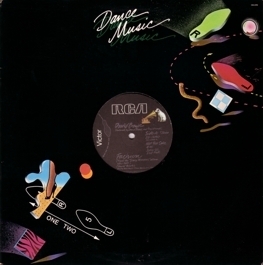 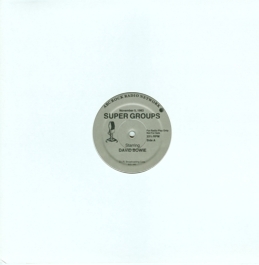 Although the cover says "disco remix", the record simply plays the album version. 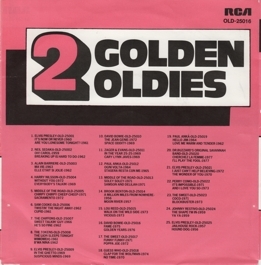 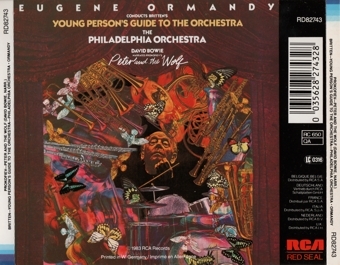 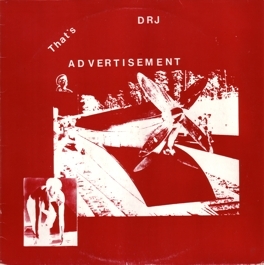 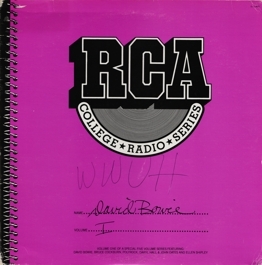 Collector's notes: This promo-only album, which was also distributed under the title RCA College Radio Series (with a different catalogue number on the cover, but not on the labels), is unusual in that it does not have a white label, but the common black variant also used for commercial US releases. 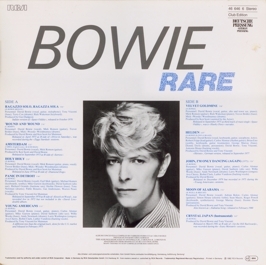 Collector's notes: This is the rarer alternative issue, mentioned in the previous entry. 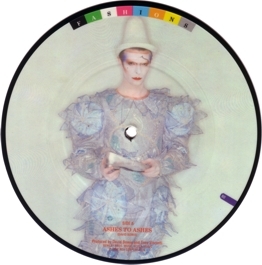 My copy lacks the cue sheet that the album typically came with, but comes with a promo-photo showing Bowie in his clown outfit. 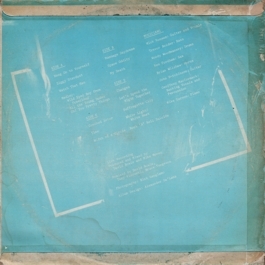 The photo looks quite professional (it's made on paper made by Kodak), but I don't know if this item originally belonged to the album. The disc and hence the labels are the same as those of the other issue. 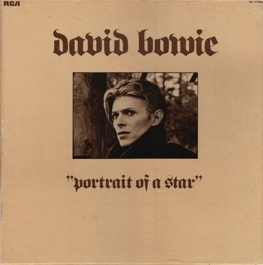 Collector's notes: This is an album made for a German book club. 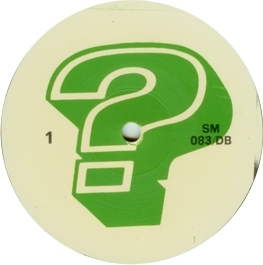 Although there is no actual hint on the record or cover, I strongly suppose that it was the Bertelsmann Buchclub, Germany's biggest club of that type. 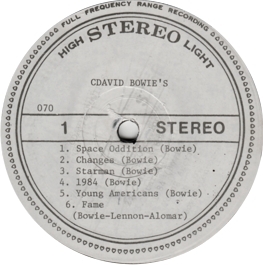 Such clubs offer books, but also records and films (on the preferred medium of the age), to their members at cheaper prices. As regards books, there must be a delay of several months before they may be issued as club editions. 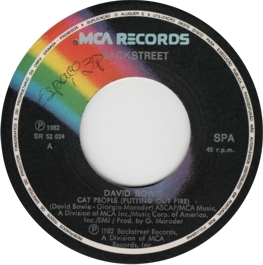 Although there is no such restriction on records, record companies do not normally license club editions at the time of the regular release, since this would create a cheaper product that competes with the regular issue. 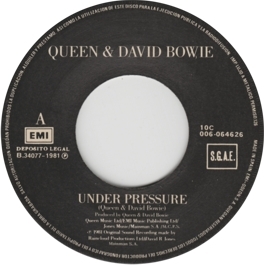 This is why it's sometimes difficult to determine the exact release date of such issues. 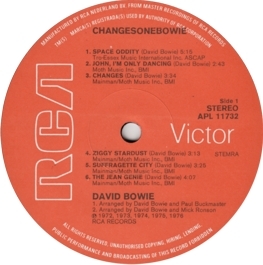 So I have simply listed the album with the standard version. Club editions of records are rarer than their regular counterparts, but in most cases they only differ from them in the catalogue number. 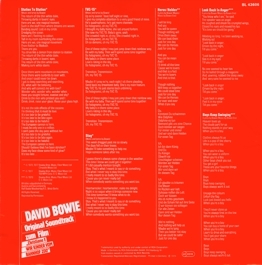 Often, they are "stripped-down" versions of the standard release, whithout gatefold sleeves, etc. 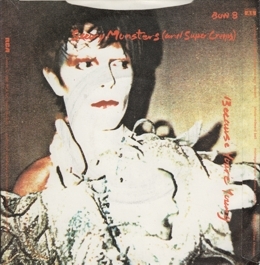 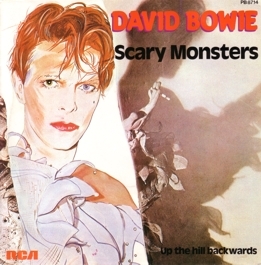 In fact, this issue of Scary Monsters doesn't even have a printed inner sleeve. 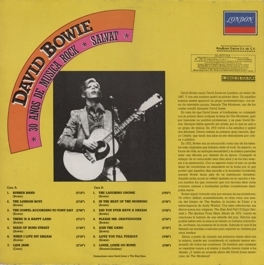 Collector's notes: A cover variation: the Colombian issue has a heavily red-tinted cover and a back cover completely in red and white. 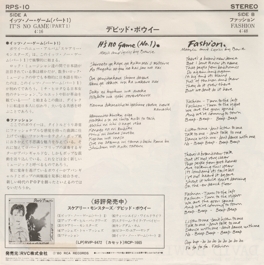 Also note that this release calls the two version of It's No Game "Part 1" and "Part 2" (like the US release). 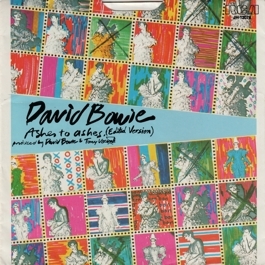 Collector's notes: The Greek cover is one of the major variations that I know of: it has a fold-out cover, with the inside having basically the same design as the inner sleeve that came with some other issues (such as the German one). 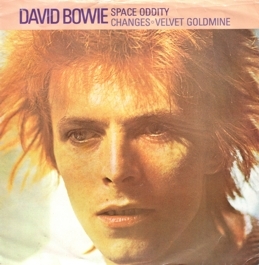 Collector's notes: Another major cover variation. 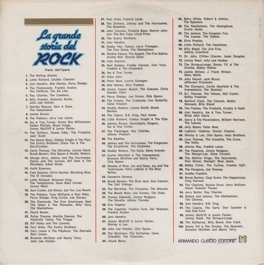 The Philippine cover has promotion for the "punk rock" (sic!) 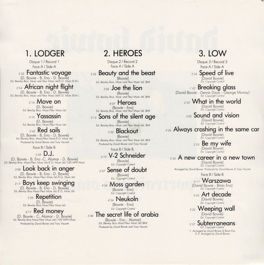 hit singles from the album. 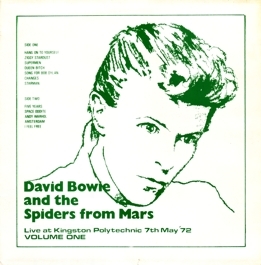 So beware: Major Tom was an anarchist! 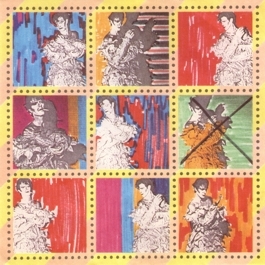 There are several minor variations of this Philippine issue. 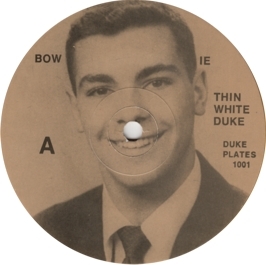 Collector's notes: And another interesting variation. The Portuguese cover is fully laminated and has a slightly smaller reproduction of the cover design on the front. 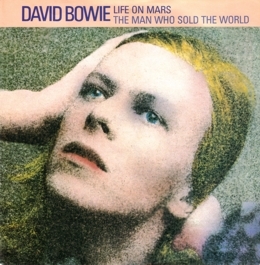 Note that the picture doesn't touch the left-hand margin of the cover. 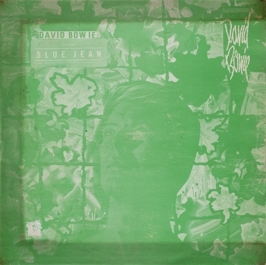 Moreover, the cover is heavily green-tinted, giving the picture a more lively, realistic look. 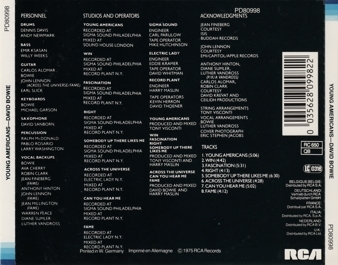 The back of the cover is completely in black, green and white. The sound quality is far below what one would expect from a European pressing of the time. 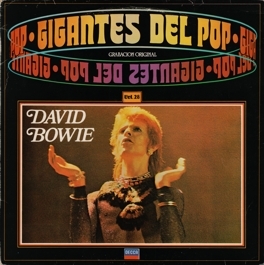 Collector's notes: The Spanish cover is similar to the Portuguese one, in that the cover picture is a slightly smaller reproduction of the usual design. 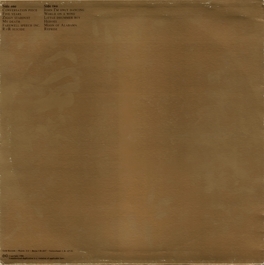 Both cover front and back have a minimally greenish tint. 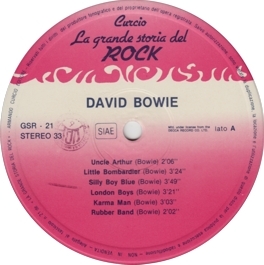 Note that there are two Spanish covers for stock copies of this record. First, there is this lighter one, which came with records that had the "S.G.A.E" print without a box on the label. 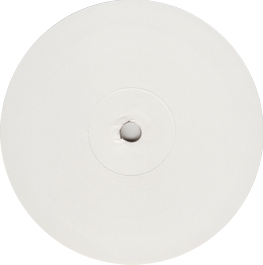 Since there was no box on the cover of white label promos, either, I assume that this is the first issue. 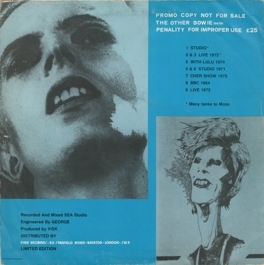 Usually, this first issue came with a printed inner sleeve, which is missing from my copy. 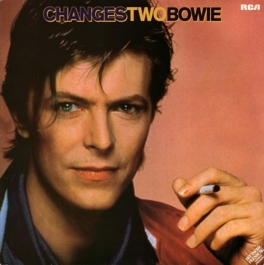 Second, there is an issue with a darker cover and a stronger reddish tint. 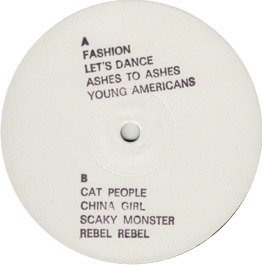 Furthermore, the label design of the second issue is different. 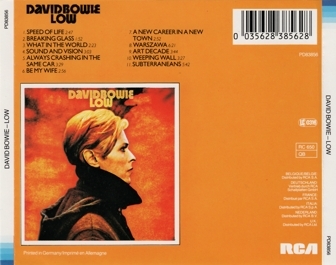 There may be a third cover variation, which is even lighter than this one and was used only for promos. 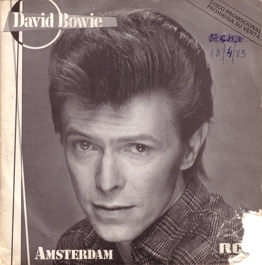 Collector's notes: This is the other, presumably later Spanish issue mentioned in the previous entry. 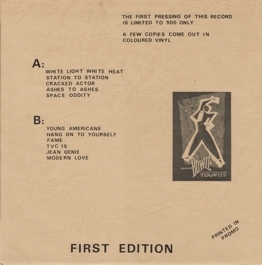 It has a darker cover and a different label design: the most obvious differences are the numbering of sides ("A" and "B" instead of "1" and "2") and the the box around the "S.G.A.E." print. 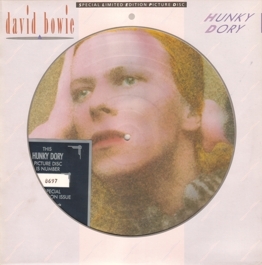 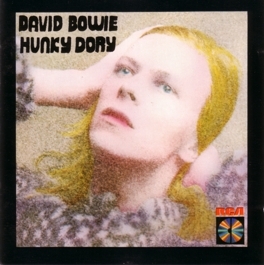 Collector's notes: Another cover variation for the Hunky Dory album - the title and artist's name are in red. This is assumed to be the first Portuguese issue, since no 1970s copies are known. 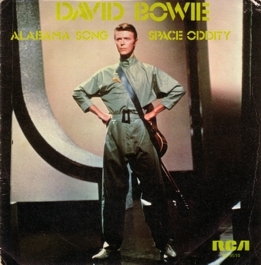 Note that the spine of this copy is plain white. 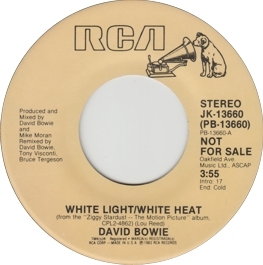 There is an alternative issue without the price code on the labels, and with the title/artist's name in white. 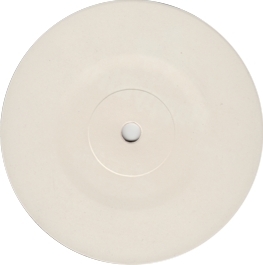 There are also re-issues with black labels. Collector's notes: The large "A" on the label makes the record resemble a promo issue, but it isn't one. 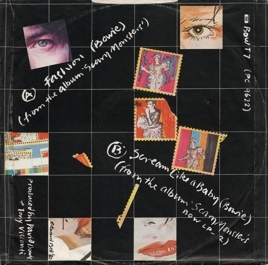 According to Jarman, there were even three variations of label design: the A-label type (with both a push-out centre and a solid centre), copies with a large centre hole (which were imported from Germany) and export copies made for Switzerland. Which makes you think a bit: what sense does it make to import records from Germany while exporting the same records to Switzerland...? Collector's notes: Note that (as in the case of the 7") the large "A" on the A-side does not indicate a promo. 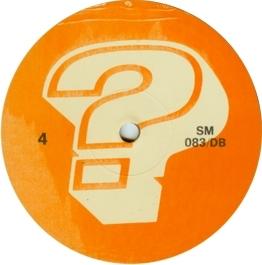 The only way to identify this record as a promo issue is the small "Demonstration Sample..." text on the labels. 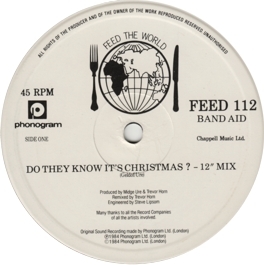 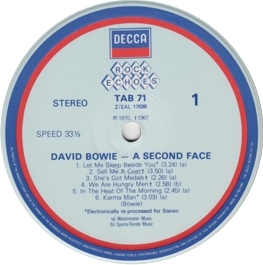 Collector's notes: The label design of the 12" single follows that of the 7" by bearing a large "A" on the A-side. For differences to the promo issue see the previous entry. 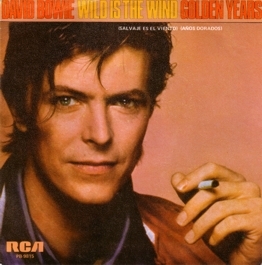 Same cover as the promo. 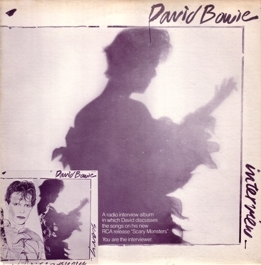 Collector's notes: Again, the album version has miraculously turned into a "disco remix". 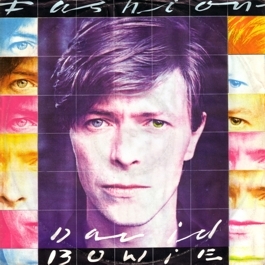 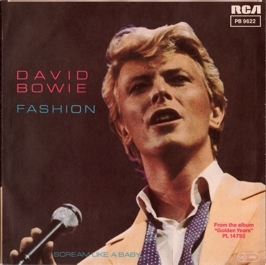 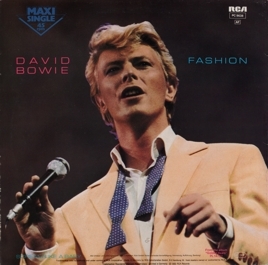 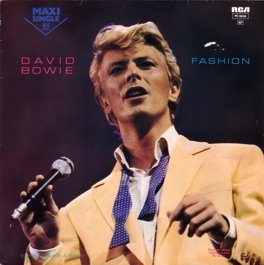 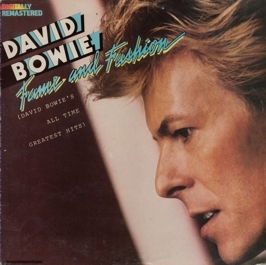 Collector's notes: Unlike the other 7" singles, the French version actually plays the full-length album version of Fashion. 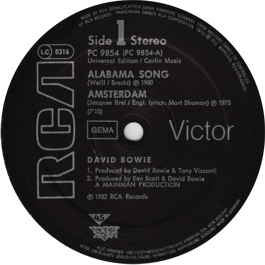 Collector's notes: And finally, RCA Netherlands, too, had arrived at black labels. Collector's notes: It's No Game No. 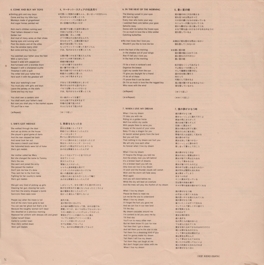 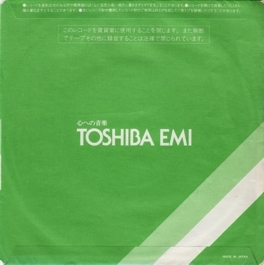 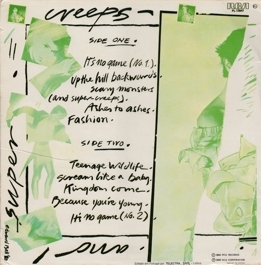 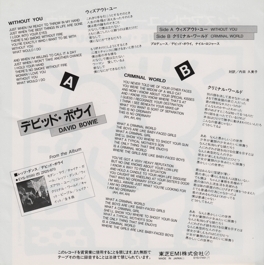 1, with its Japanese voice, was a natural candidate for a single release in Japan. 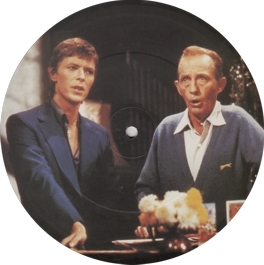 Collector's notes: A picture disc pirate LP of the "dress cover" version of TMWSTW would have been fine, but why for heaven's sake does the record play the superfluous Interview album? 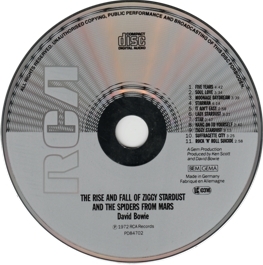 Collector's notes: The Bowie side of the record had previously been released the same year on a disc with Bob Dylan on the B-side. Collector's notes: Golden Years is the album version. 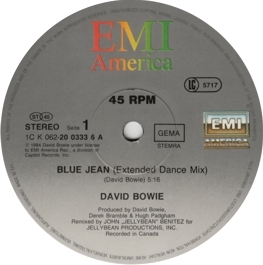 So, while this release has the same songs as the 1976 US single or the Canadian version, it has a different combination of edits. 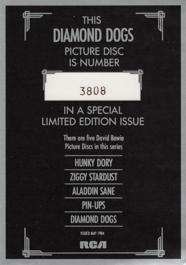 Collector's notes: The exact release date of this last issue isn't clear (Jarman doesn't give one). But it was certainly released after PRT was finally established as the successor of the original Pye label in 1980 and before this EP was made superfluous by the Don't Be Fooled by the Name album in 1981. 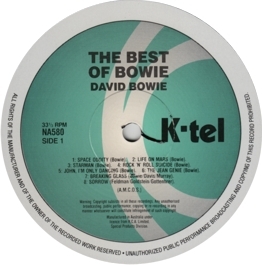 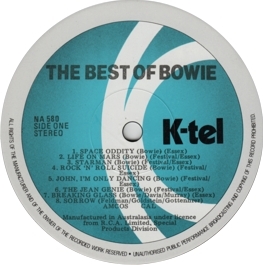 Collector's notes: An extremely successful Bowie compilation on the hit label K-Tel - just in time for the Christmas business of 1980. 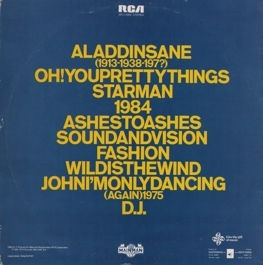 But a few things went wrong here. 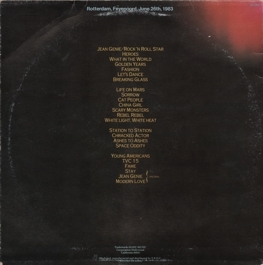 The songs are arranged in chronological order, so one wonders what the Stage version of Breaking Glass is doing between The Jean Genie and Sorrow. 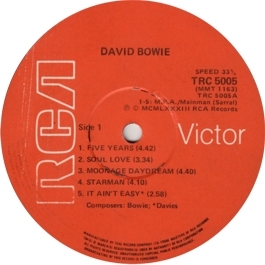 The puzzle is solved if you remove the "correction sticker" from early British covers (like the one that came with this Austrian pressing): the original tracklist had Drive-In Saturday between the other two songs. 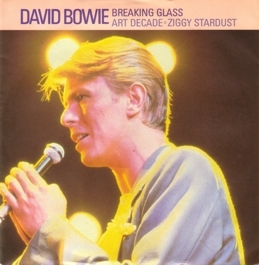 They must have decided to include Breaking Glass instead after the first covers had been printed. In fact, there are early French copies that play Drive-In Saturday, like this one. 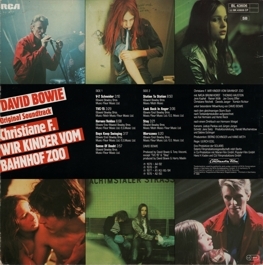 This rather elusive Austrian copy was distributed in a UK cover, but with a country-specific (but not Bowie-related) inner sleeve. 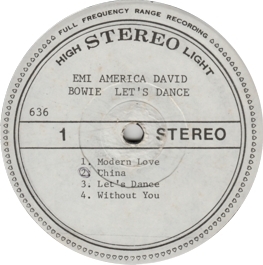 It was quite normal for smaller countries to press their own copies of the album and distribute them in imported covers (sometimes even with a different catalogue number). 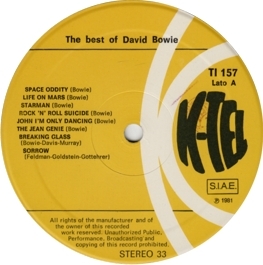 Collector's notes: Apart from the problem related to the last-minute inclusion of Breaking Glass, there are some differences between the international releases of The Best of Bowie that are really weird. 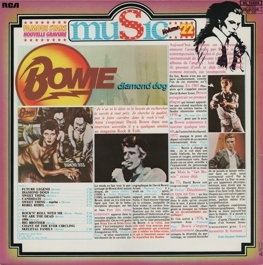 The New Zealand issue of the album came with a disc made in Australia and - like the Australian version - differs from the "standard version" above in several respects. 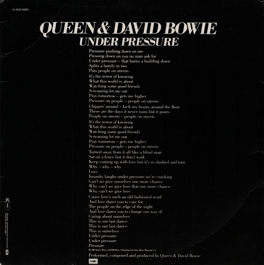 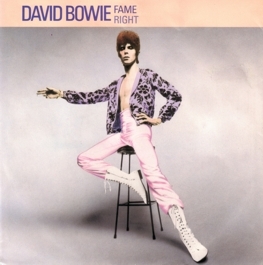 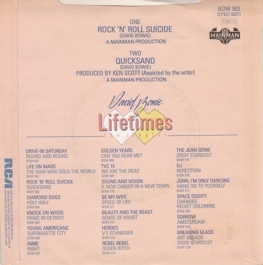 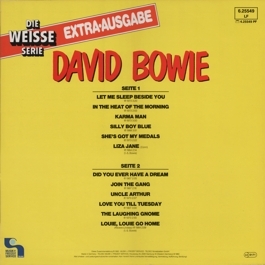 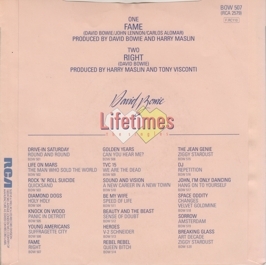 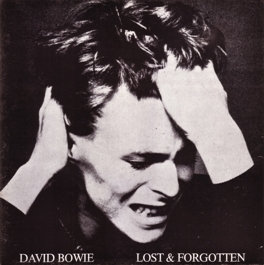 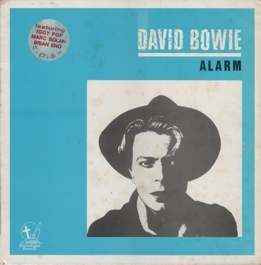 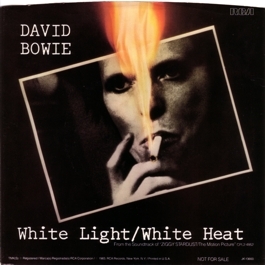 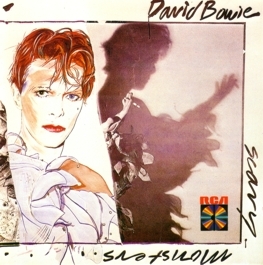 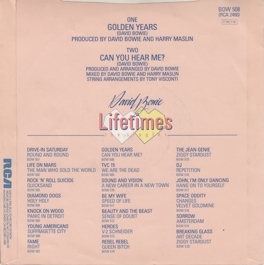 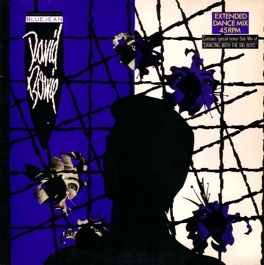 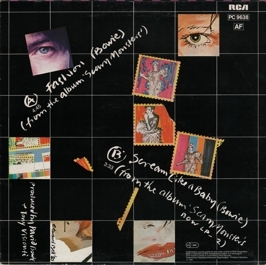 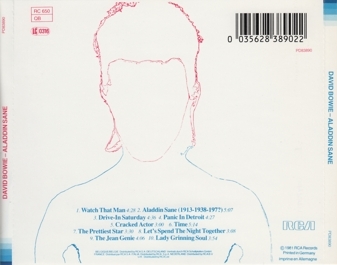 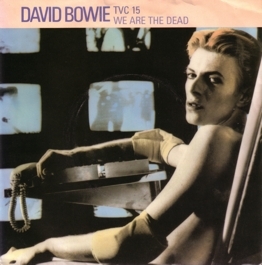 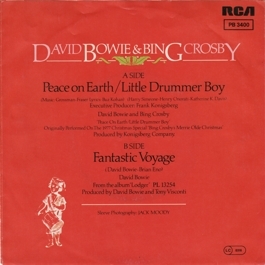 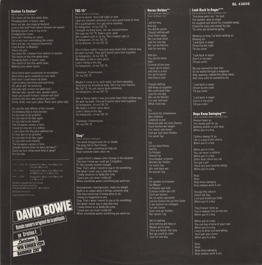 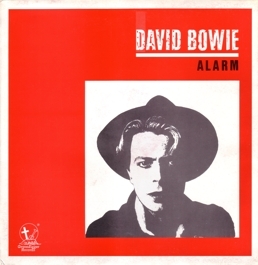 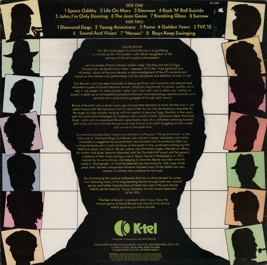 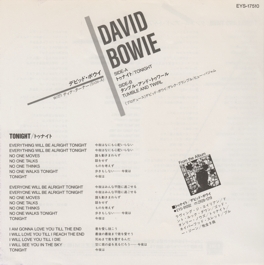 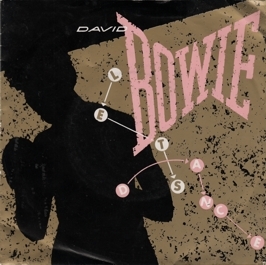 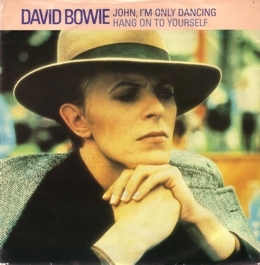 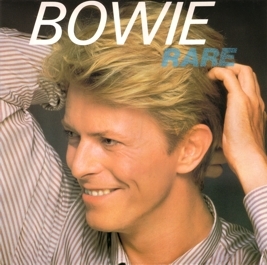 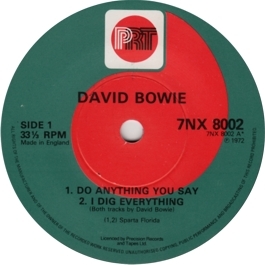 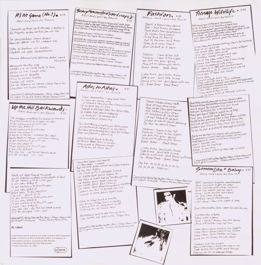 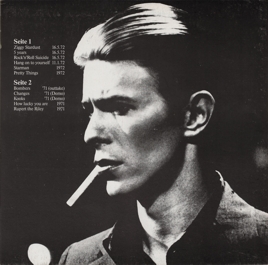 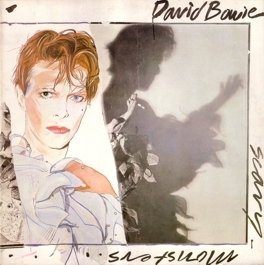 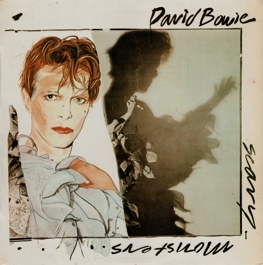 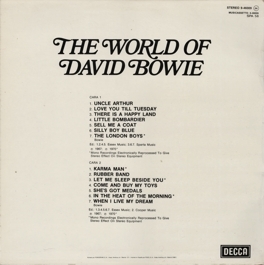 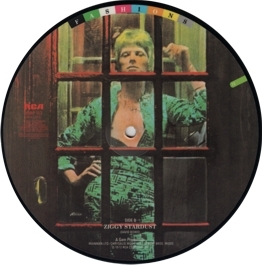 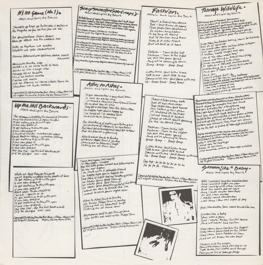 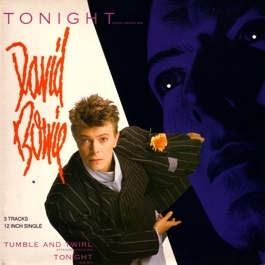 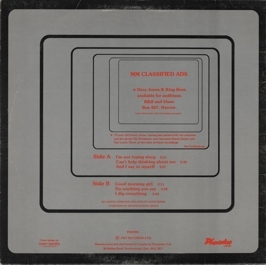 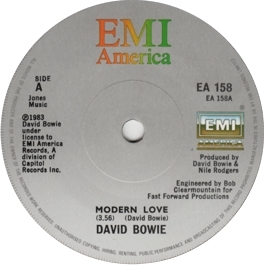 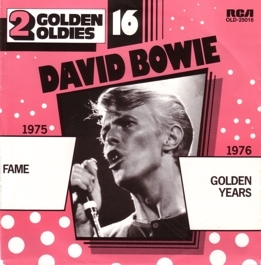 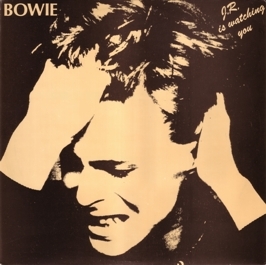 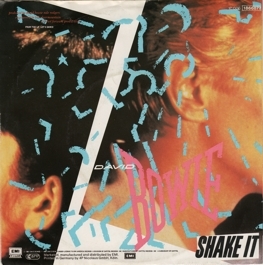 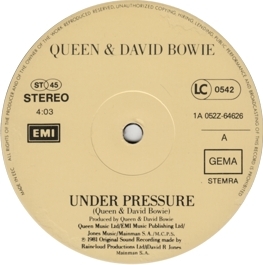 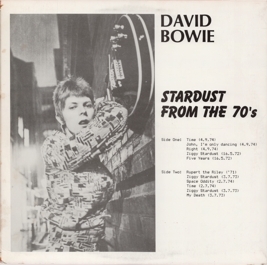 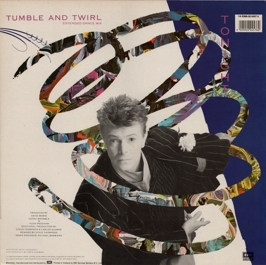 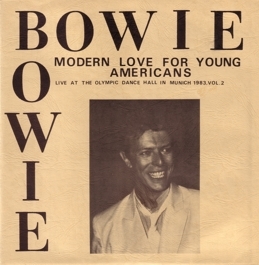 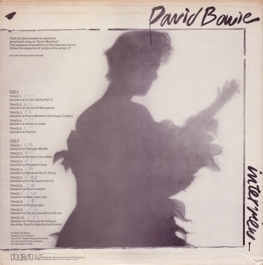 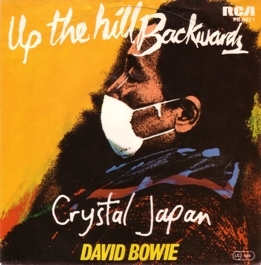 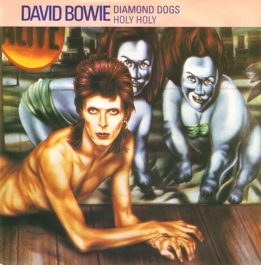 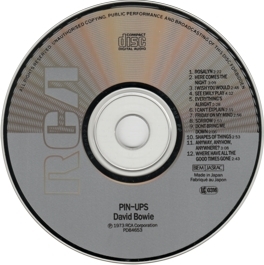 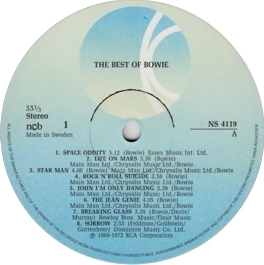 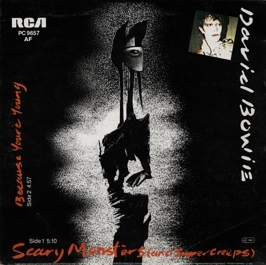 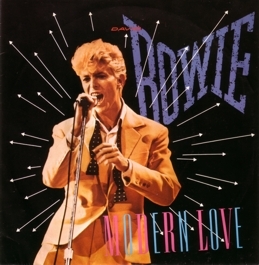 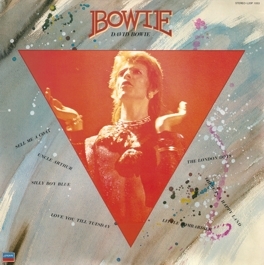 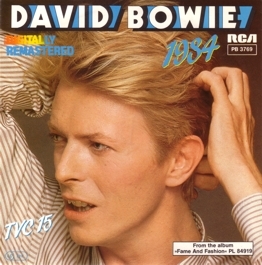 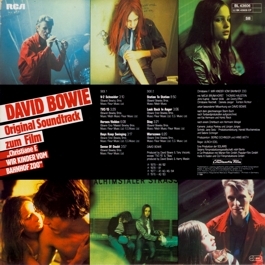 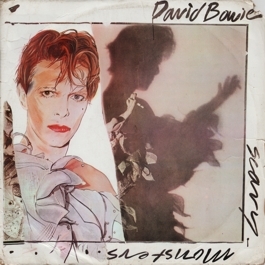 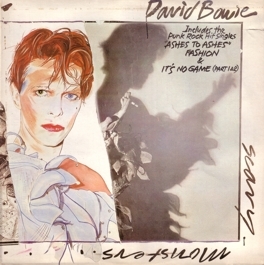 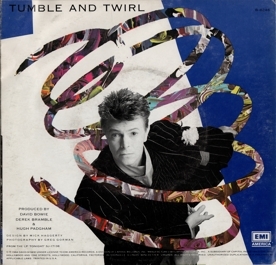 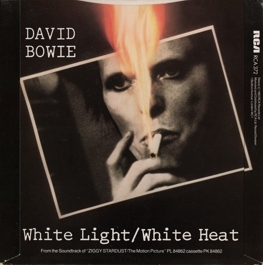 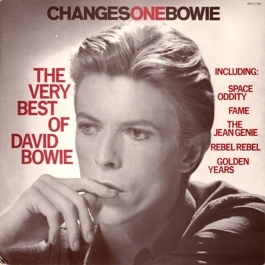 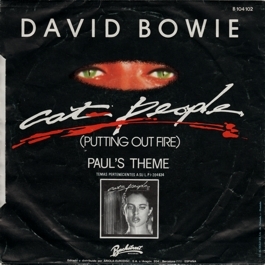 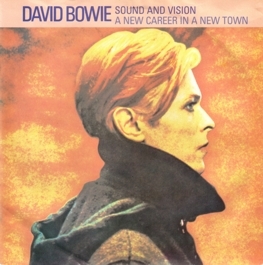 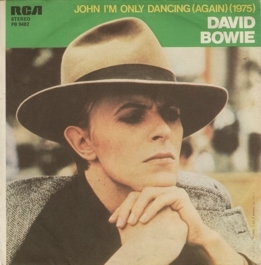 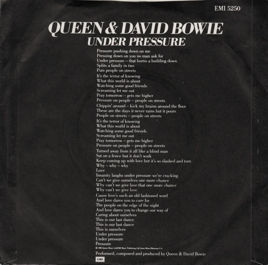 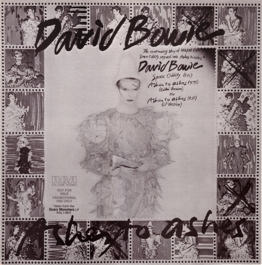 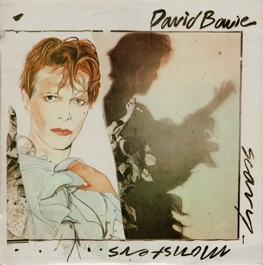 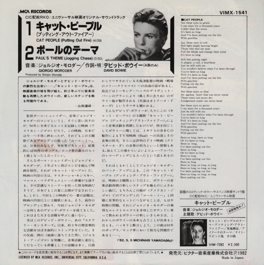 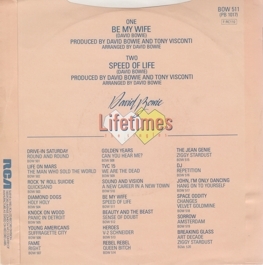 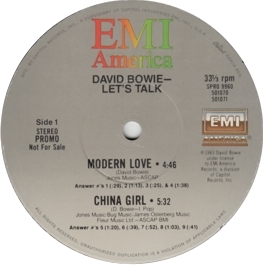 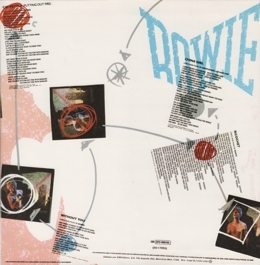 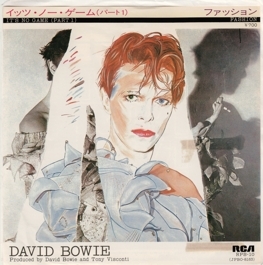 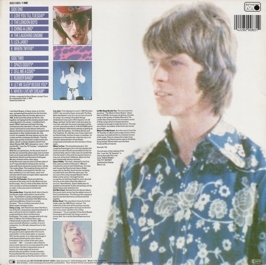 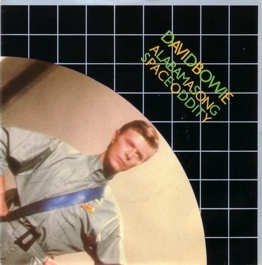 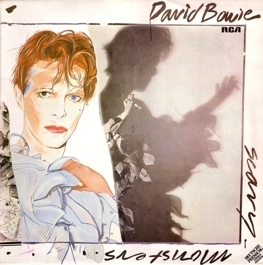 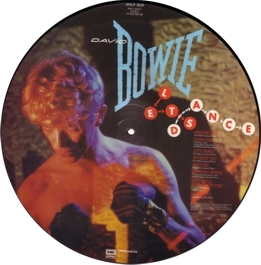 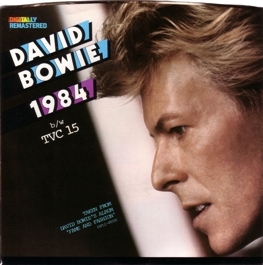 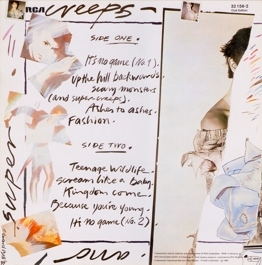 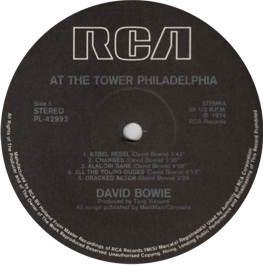 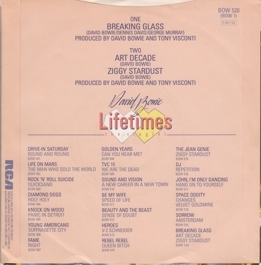 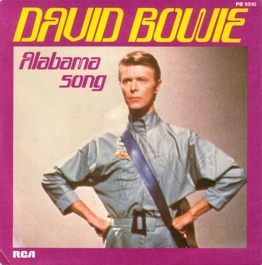 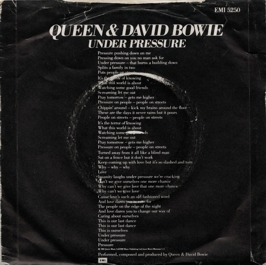 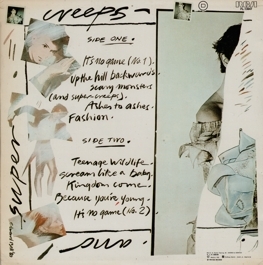 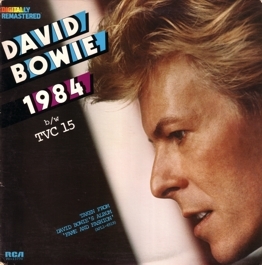 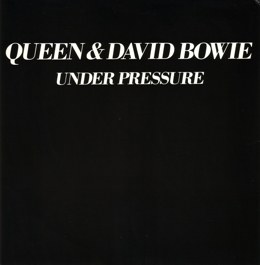 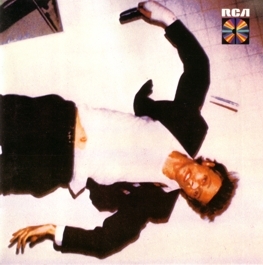 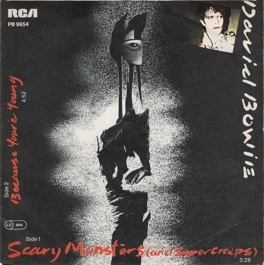 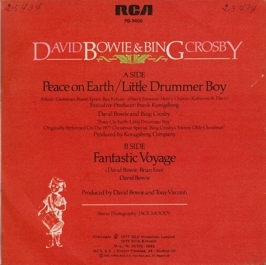 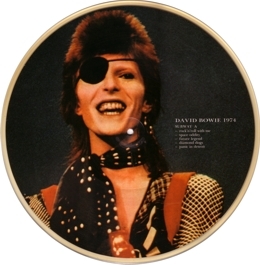 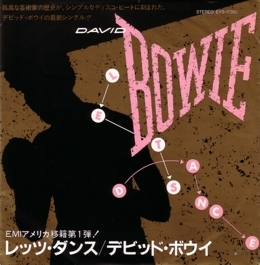 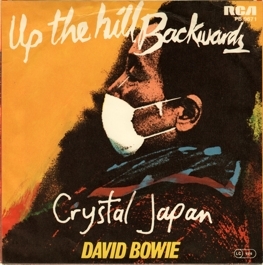 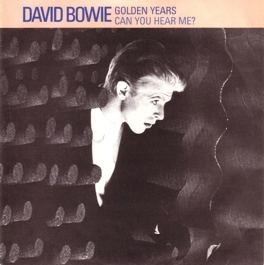 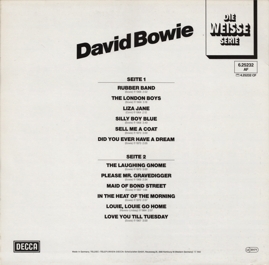 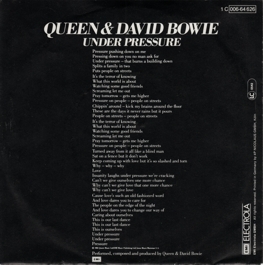 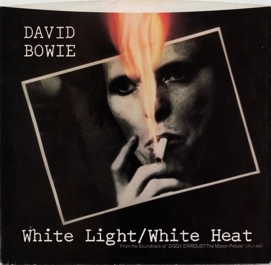 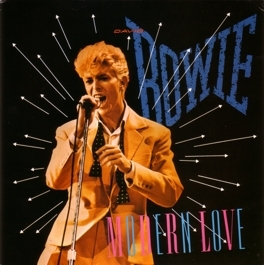 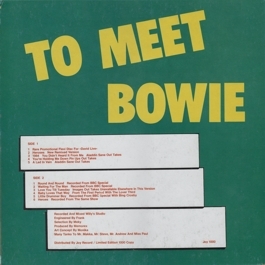 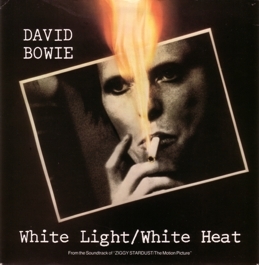 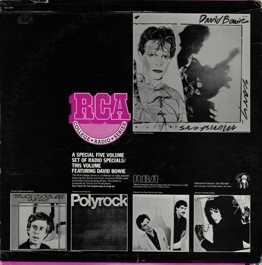 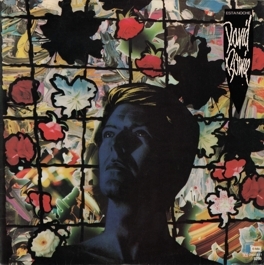 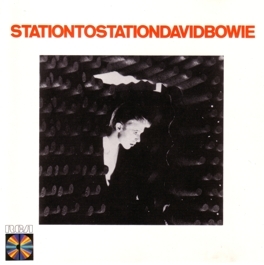 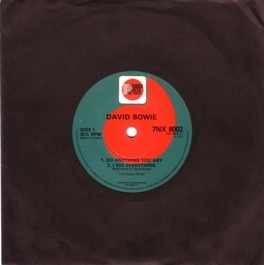 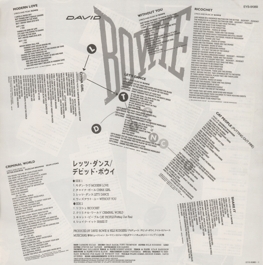 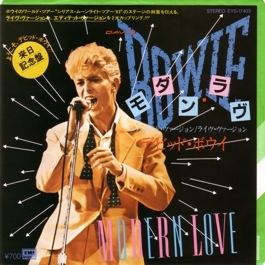 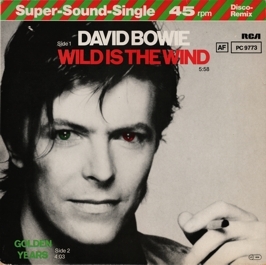 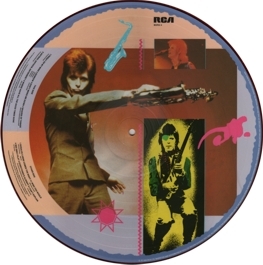 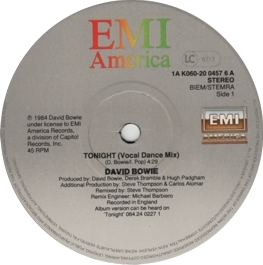 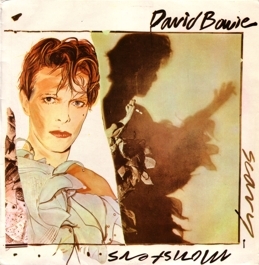 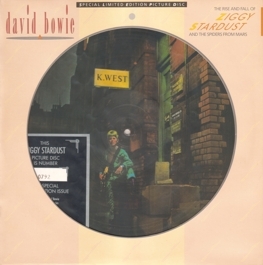 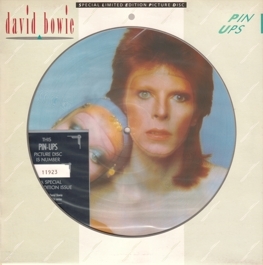 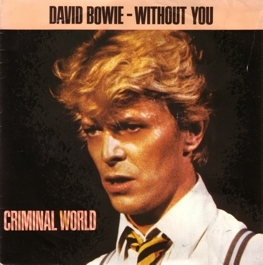 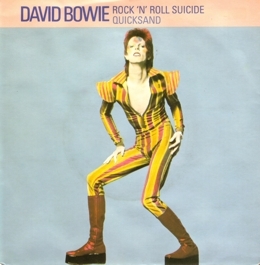 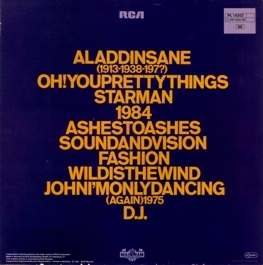 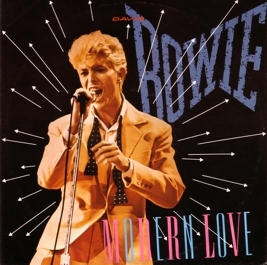 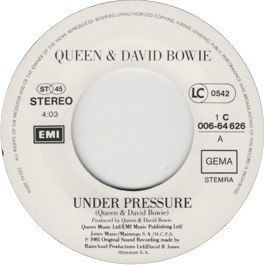 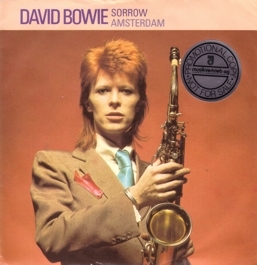 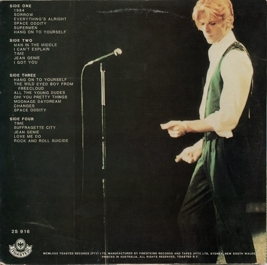 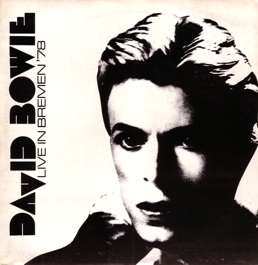 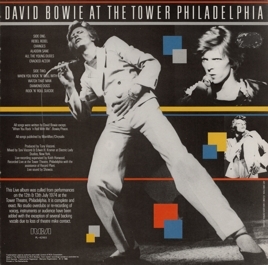 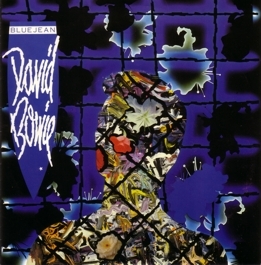 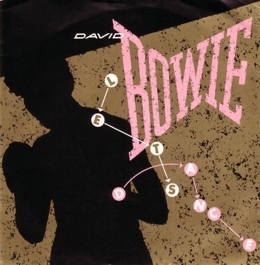 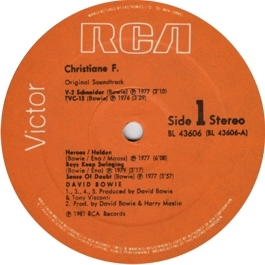 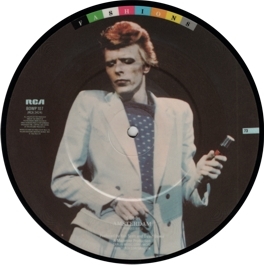 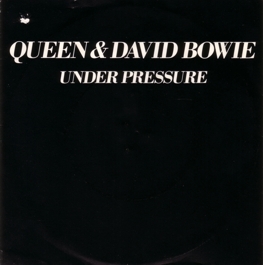 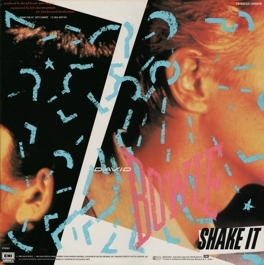 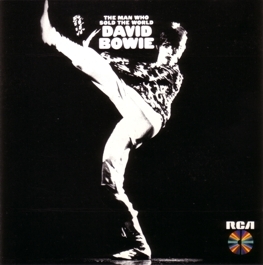 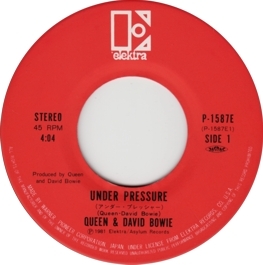 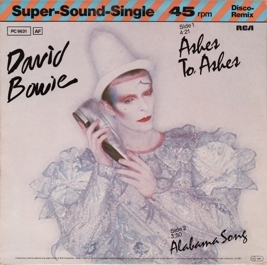 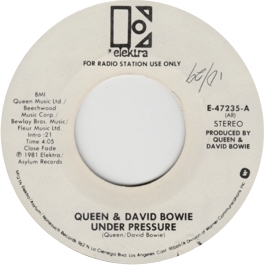 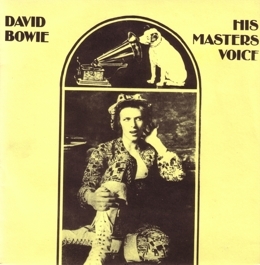 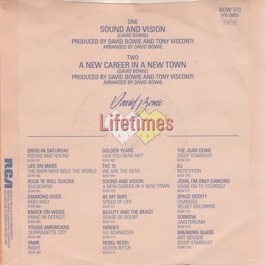 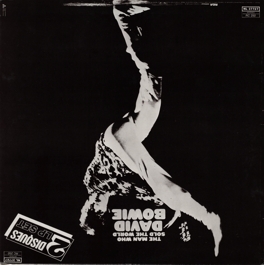 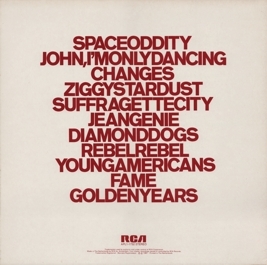 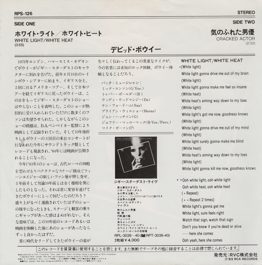 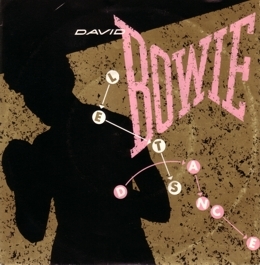 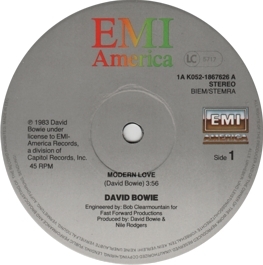 Sometimes they included album versions where the "standard version" had single edits, in the case of Breaking Glass they replaced the live version by the studio version, John, ... is the original version instead of the "sax version", and in the case of five songs they even provided unique edits: Diamond Dogs is about 4:30 long, Young Americans roughly four minutes, Golden Years is an edited album version, TVC 15 is slightly under four minutes and "Heroes" runs about five minutes. 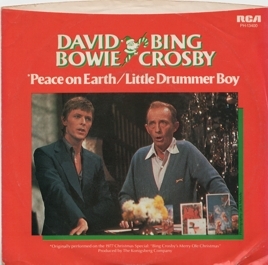 To add to the confusion, the second New Zealand issue of this album was even weirder. 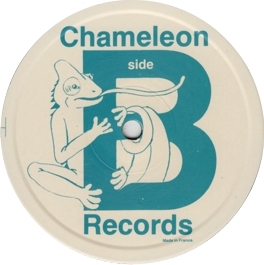 Release notes: record Australia (this combination original), counterfeit? 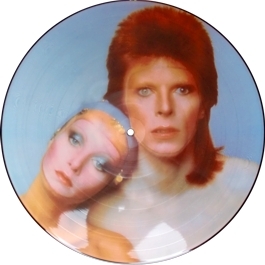 Collector's notes: This is a true headache issue. 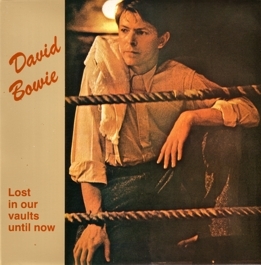 The first reason for this is the poor quality: the pressing is rather bad (even the stereo channels are reversed! 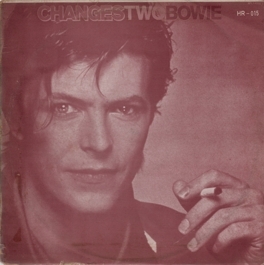 ), and the cover looks like a poor copy of that of the original issue, with extremely faded colours. 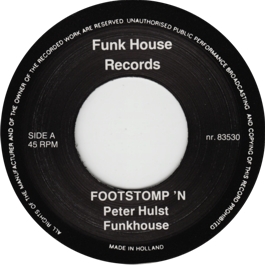 What is more problematic, though, is the legal status of this release. 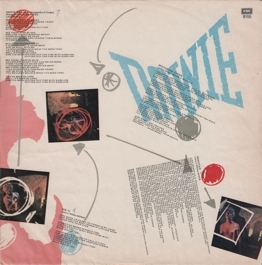 The article on The Best of Bowie on Bassman's David Bowie Page says that these New Zealand pressings with the "faded" covers are, in fact, counterfeits from the late 1980s. 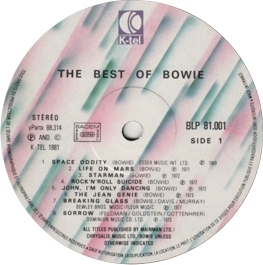 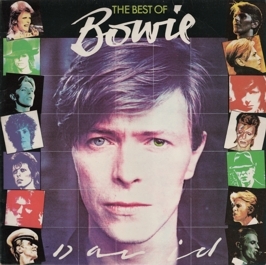 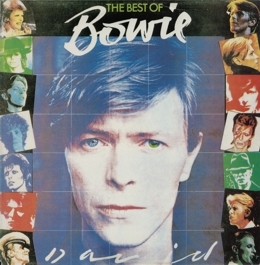 For a long time I was reluctant to believe this, since who would issue a fake Best of Bowie in the late 1980s? However, some time ago I was contacted by a guy from Australia, who confirmed that in the 1980s a small pressing facility in Melbourne (called "The Record Plant") pressed about 5.000 counterfeits of the album and later got busted for distributing counterfeit albums. 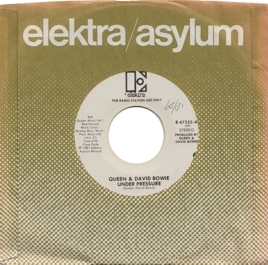 They used presses formerly owned by Astor Records. 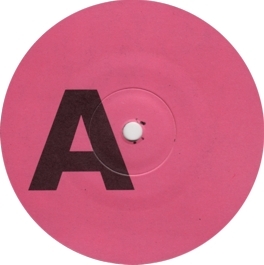 As my informant told me, "[p]ressings from their manual presses had a double 1" ring under the label (around the centre hole) and pressings from their automatic presses had a typical a single ring [...] They always used their matrix number which looked like this: ML12xxx." 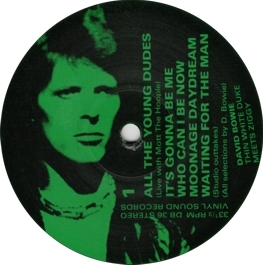 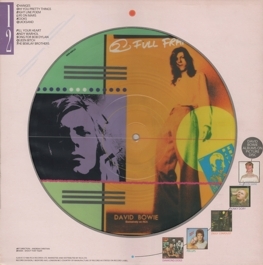 Now, exactly the two variations of label moldings that my Australian informant described do exist for the "faded" version of the New Zealand pressing: my copy has a single ring, and a copy shown in the vinyl albums discography in the forum of the Illustrated db Discography has a double ring on the A-side label. 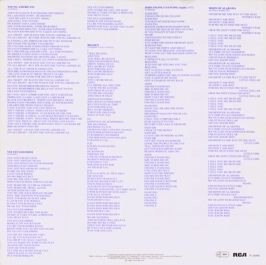 The only thing that does not fit is the information about the matrix numbers: my copy has only "NA 58-A" (sic) and "NA 580-B" hand-scratched into the run-out groove. 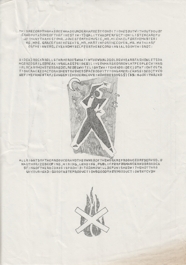 Maybe the bootleggers were not as consequent in their use of matrix numbers as my informant thought? Be that as it may, given the poor quality or the second issue and the strong evidence for the existence of New Zealand counterfeits, I now tend towards believing that all the "faded" copies are, in fact, counterfeits. 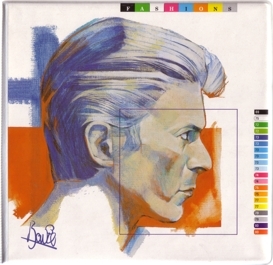 Collector's notes: The cover is made for several Scandinavian countries. 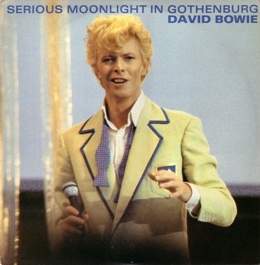 However, so far, I haven't seen any other Scandinavian issues. 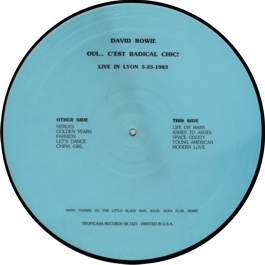 Collector's notes: Low re-issued in a French budget series. 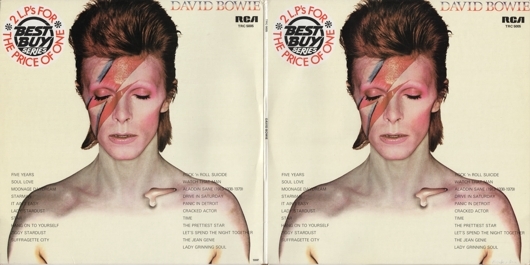 But if you think that this is the worst that can be done to an original cover design... then look at the next entry. 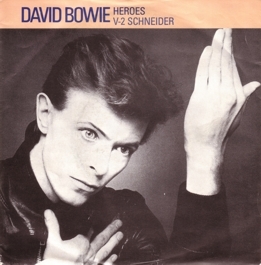 Collector's notes: I think this one gets my prize for the worst manipulation of an original cover layout. 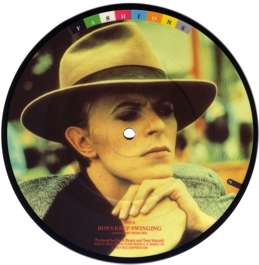 And I don't think that prize will ever be given to another record! 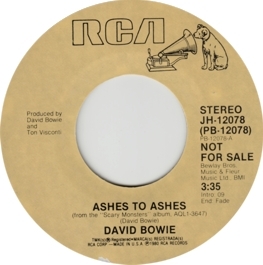 Collector's notes: The sound quality is so-so. Originally I wrote that it is "poor", but after listening again, I would say that it is not bad for an audience recording from the time. 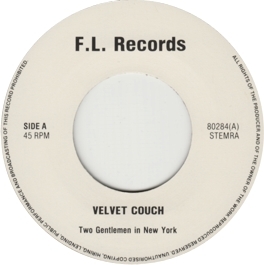 What is funny about the record is that it has a long silent groove where you would expect I Feel Free, which is listed on the cover. The track is, in fact, on Volume Two. 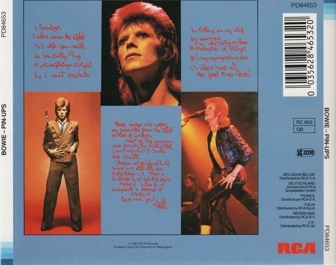 The cover back is plain white, hence no picture. Collector's notes: A variation with white labels. 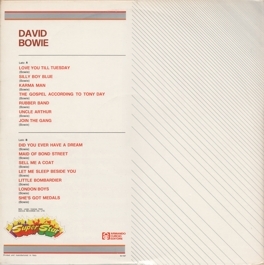 Again, the cover back is plain white. 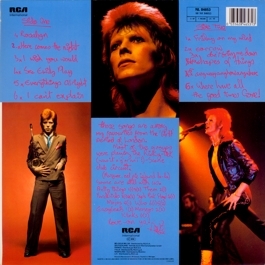 Collector's notes: This one has I Feel Free, whose presence had been promised on the cover of Volume One. The sound quality is the same as on the first part of the set. 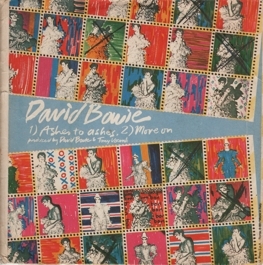 Volume Two seems to be the rarer one, although (or maybe because?) 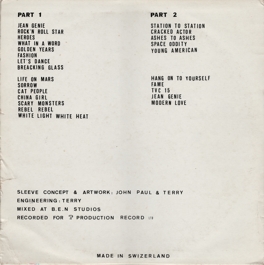 it is the more interesting one, since it has two tracks (I Feel Free and Gotta Get a Job) which were otherwise unavailable (at least as recordings from that era in the case of I Feel Free). 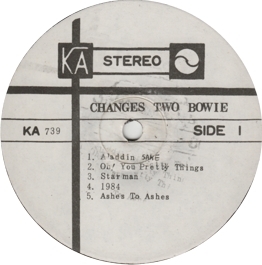 The sound of these two tracks is better than on later compilations like The Other Bowie. 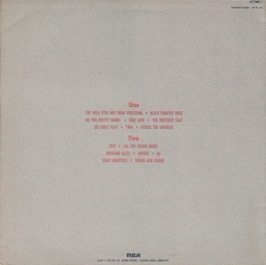 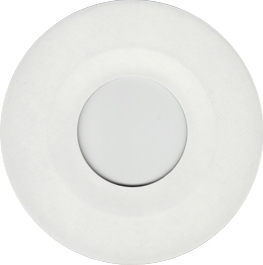 Plain white cover back. 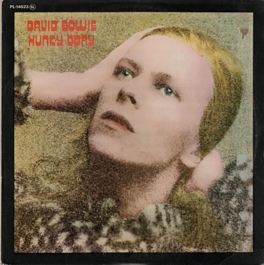 Collector's notes: The sound quality of this re-issue is even worse than that of the original. 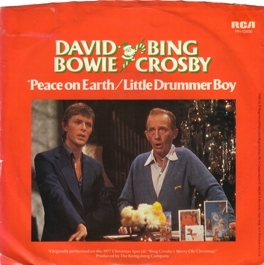 It has crackle in the background that is not due to the condition of the record. Obviously, it was copied from an older vinyl record. 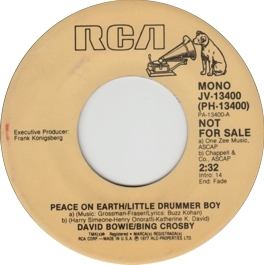 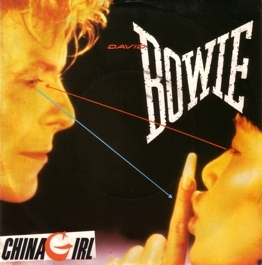 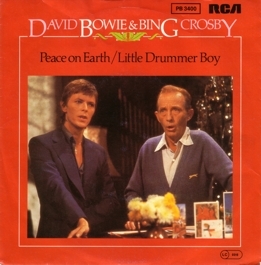 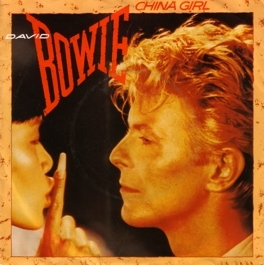 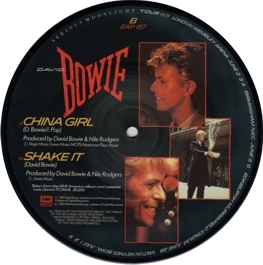 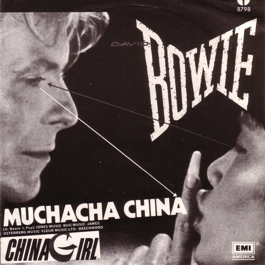 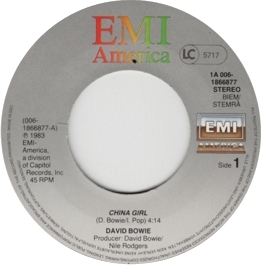 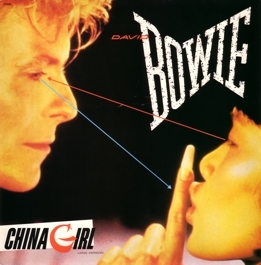 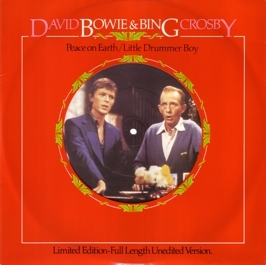 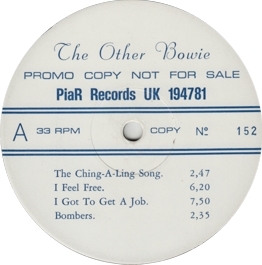 Collector's notes: To this day the full-length version of Ching-a-Ling - including the first verse, which is sung by Bowie - has not been officially released on vinyl. 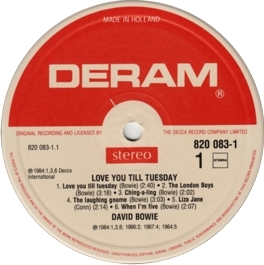 It is available on the strange CD issue of the Love You till Tuesday soundtrack and the 2010 2CD deluxe re-issue of the Deram album. 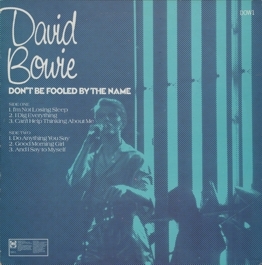 Anyway, the sound quality of this bootleg is very good, so who cares? 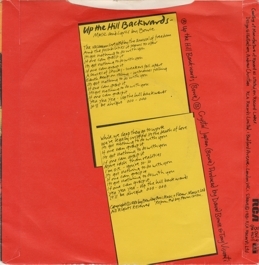 The "spine" of the wraparound cover is at the bottom, so that the design of the cover back is actually upside down, if you hold the record in the normal way. 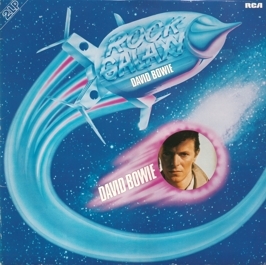 However, I have here shown it in the logical way. 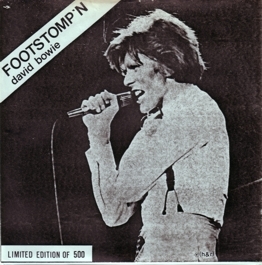 Release notes: bootleg, white labels with number code "8/70"
Collector's notes: One of the best Bowie bootlegs ever! It seems to have been recorded from TV, and the sound quality is very good, given the standards of 1978. 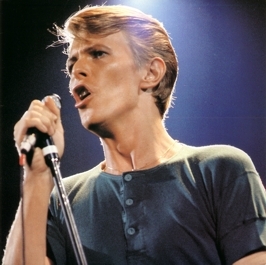 Bowie's performance is also great, which is quite a miracle. 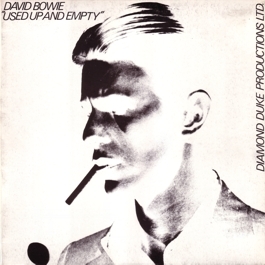 If you have seen the show, you know that a less enthusiastic audience is hardly conceivable. 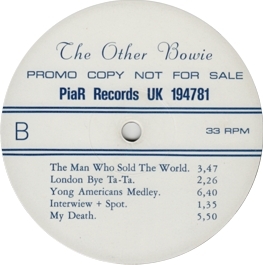 Collector's notes: This is the first Bowie bootleg I ever bought, and at the time it wasn't a disappointment. 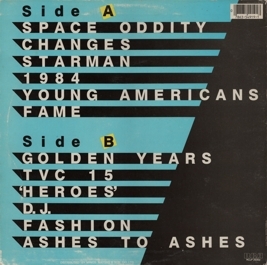 It's a nice compilation album of stuff that was rare in the early 1980s, and the sound quality is good to very good. Reprise is a short spoken piece taken from some version of The Rocky Horror Picture Show. 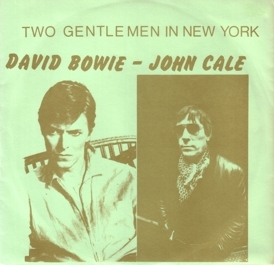 Collector's notes: A not absolutely necessary, but pleasant "2-on-1" set (so to speak) in very good sound quality. 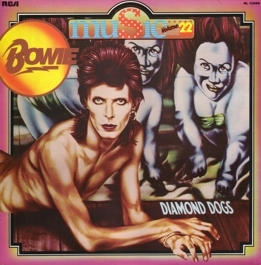 Nice but inappropriate cover. 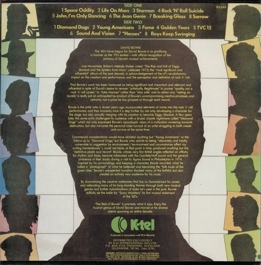 Frifelt claims that this album was released in 1979, but if this is correct, why do the labels give the year 1980? 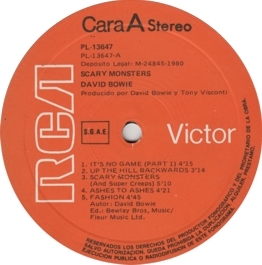 I don't really trust the information on the labels of bootlegs, but even bootleggers don't normally pre-date their records. 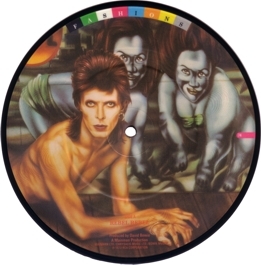 Collector's notes: Among all the issues of this album, this is certainly the weirdest one I have come across. The labels have the standard track list, but the content of the record is quite different from that. 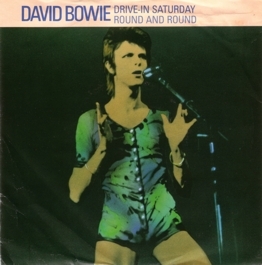 The Illustrated db Discography mentions that there are French pressings that actually play Drive-In Saturday instead of Breaking Glass, which is not too surprising. 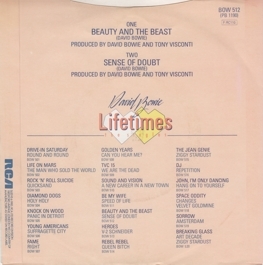 What is really surprising, though, is that this copy omits Young Americans and plays Beauty and the Beast and... Breaking Glass instead! However, the existence of such copies has actually been known for a long time, since a French issue with this combination of songs is listed by Thompson. 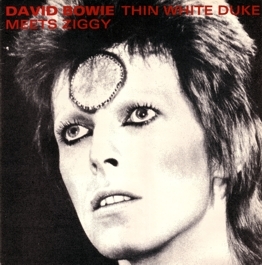 Hadn't I come across this copy, I would have considered this information to be apocryphal. 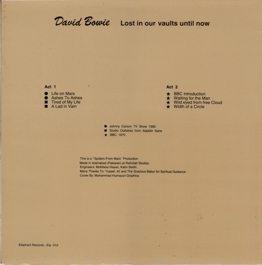 I can only guess that these copies are early pressings that were distributed accidentally. My copy originally came in a Scandinavian cover, but all other copies that I've heard of have early (stickered) UK covers, which is why I show such a cover here. 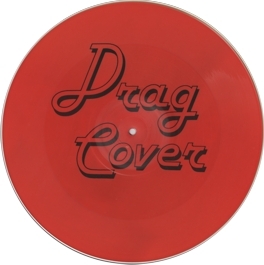 There is no such thing as an "appropriate cover" for this issue - there are not even appropriate labels for it! 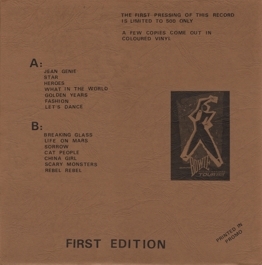 The matrix numbers of my copy are "BLP 81 001 A" (hand-scratched), "M6 335050 2", "YPARTX 88314 1" (both machine-stamped) on side 1, and "BLP 81 001 B" (hand-scratched), "M6 335051 2", "YPARTX 88315 1" (both machine-stamped) on side 2. 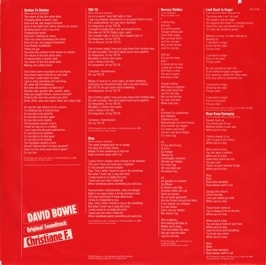 Early French copies of The Best of Bowie with the corrected standard track list also came with the striped label. 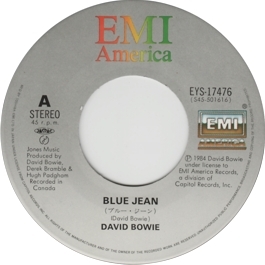 Blue label copies are probably later pressings. Like the Italian issue, all French copies have the year 1981 on the label. Collector's notes: This is the first "regular" French pressing. 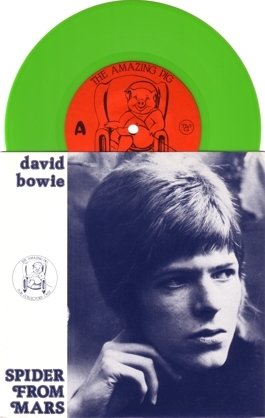 The labels are the same as in the previous entry, but in the case of this copy they actually match the contents of the record. 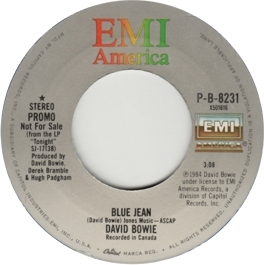 Collector's notes: This is a later French pressing with blue labels. 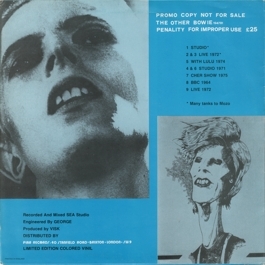 In principle, the cover is the same as in the previous entry, but there is a minor difference: whereas the cover of this copy has the catalogue number above the price code ("KT 227") in the top right corner of the cover back, the back cover of the copy in the preceding entry has only the price code in that place. 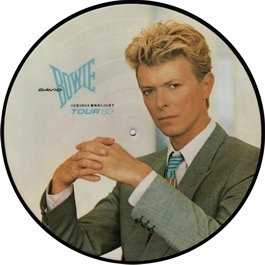 I think this is the result of some variation in the production process. 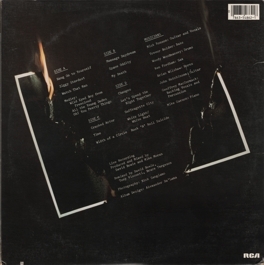 In the case of this copy the back cover design is moved a bit to the bottom, so that it shows the catalogue number - which has simply been cut off from the back of the other copy. 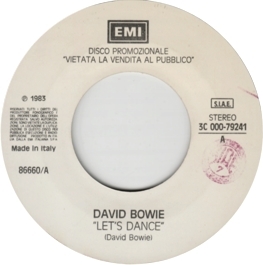 Collector's notes: Like the French release, the Italian version has the date 1981 on the label, that's why I assume that it was a belated release. I have also seen pressings with red labels. Like the New Zealand issue, the Italian version of the album differs drastically from the "standard version" above. 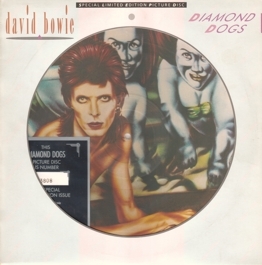 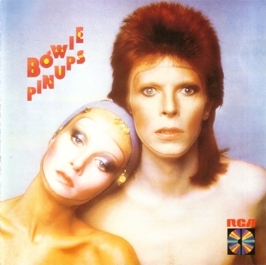 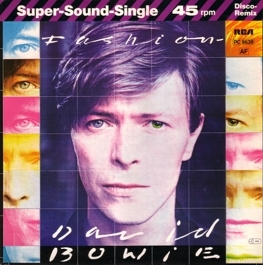 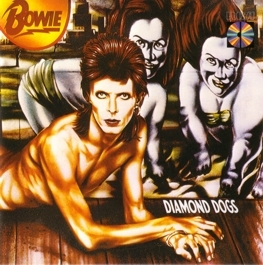 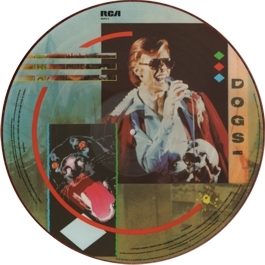 In some cases, the deviations are the same as on the New Zealand issue, but there are unique edits of Diamond Dogs and TVC 15. 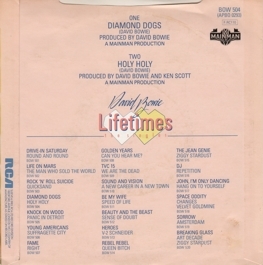 Collector's notes: Another 1981 issue with a number of unique edits: Diamond Dogs runs 4:30 minutes, Fame 3:18, and Golden Years 3:15. The Spanish release is the only one with a major cover variation: Spanish title and Spanish text on cover back. 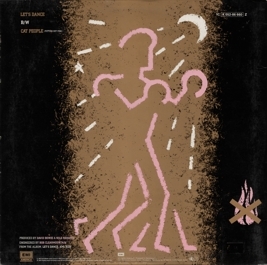 Collector's notes: The German single reversed the front and back cover designs. 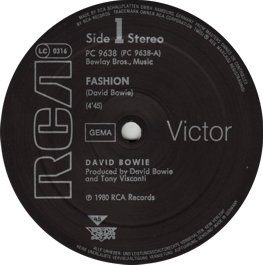 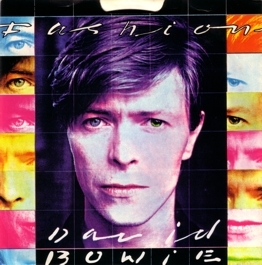 Collector's notes: As in the case of Fashion, the French issue plays the full-length album version. 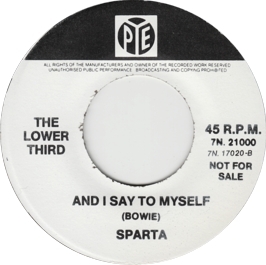 Collector's notes: I hope I haven't confused anyone: originally, I wrote that this is a promo-only release (which it is, according to my definition). 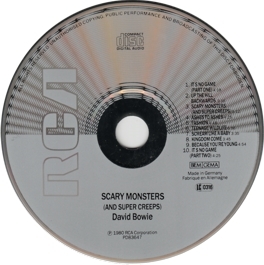 In fact, I didn't know that there were also stock copies (with Scream like a Baby on the B-side) - thanks to Ruud Altenburg for pointing this out to me. 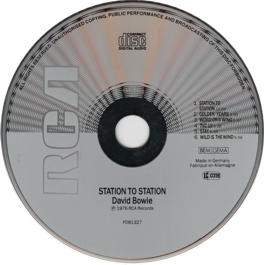 However, I got it wrong and thought that the stock copies had the same coupling of tracks as this promo.  So I hope that's sorted out now. 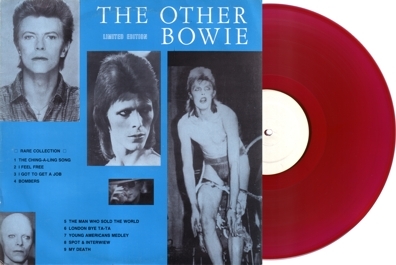 Collector's notes: This record is also available with a red cover (see next entry). 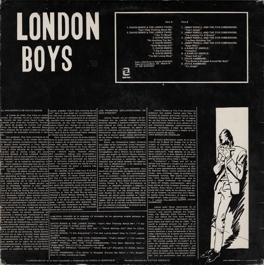 Alas, just like the guys who had made the nice Davy Jones EP in 1978, these bootleggers, who gave us the two Pye tracks that hadn't been available since their original release, came a bit too late: very soon these tracks were re-issued officially. 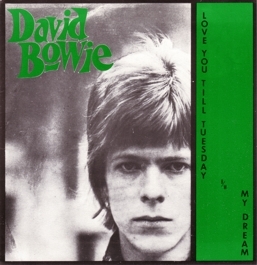 Collector's notes: At first sight this is another almost failed bootlegger's project, since the single version of Love You till Tuesday, which hadn't been available since 1967, was re-released in 1981. However, the B-side is interesting and much trickier. 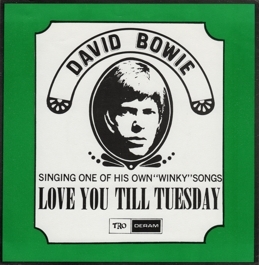 It is not the album version, it is not exactly the version from the Love You till Tuesday soundtrack, and it is not the "organ version" from the Looking Glass Murders movie. 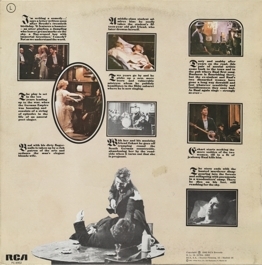 So I can only guess that it's the movie (i.e. 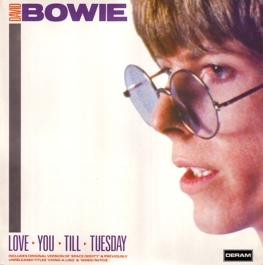 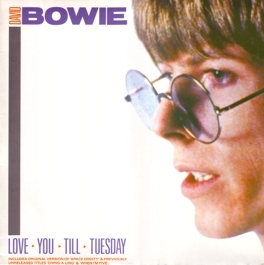 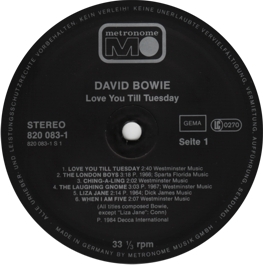 Love You till Tuesday) version with alternative vocals that is mentioned by Pegg. 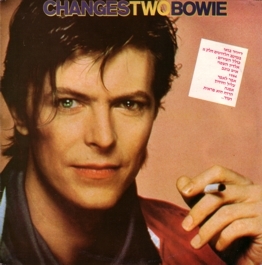 Anyway, it's well worth listening to and maybe better than the other versions. 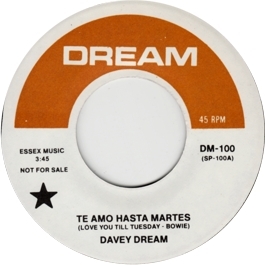 The labels of the record are a nice mockery of 1960s Deram promo singles like this. 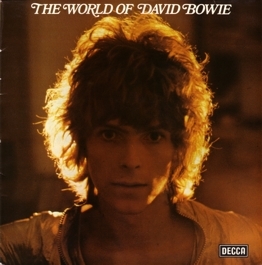 Collector's notes: No other re-release of The World of... had such a nice cover design as this Spanish issue. 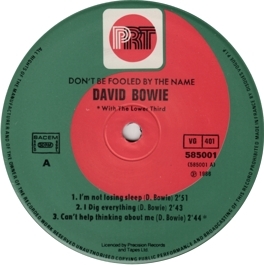 Collector's notes: Concerning label designs, there was a lot of confusion in many countries at this time. After having experimented with various versions of black labels, RCA UK returned to the familiar orange labels of the 1970s for this release. Collector's notes: The US issue of Up the Hill Backwards came with a larger set of stamps that comprised all of those used in the original UK sets. 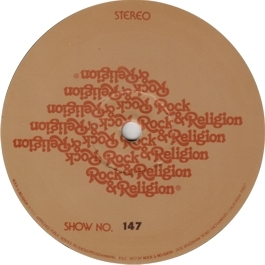 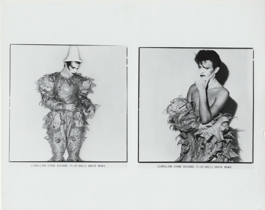 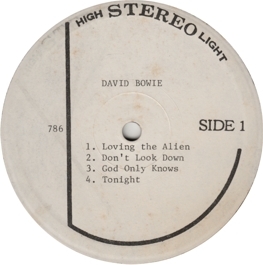 Collector's notes: A radio show that discusses Bowie's music in the context of religion. 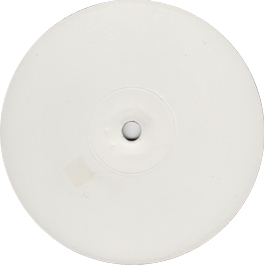 None of the tracks is complete. 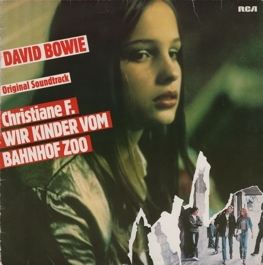 Original Soundtrack zum Film - "Christiane F. - Wir Kinder vom Bahnhof Zoo"
Collector's notes: There are two German issues. 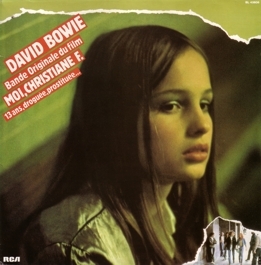 This one (with the film title in relatively small print) was also used for export. 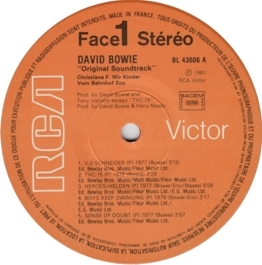 There are copies with French stickers, and also copies with a Spanish OBI. 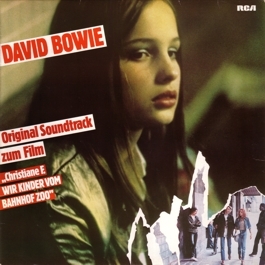 The other issue has the film title in rather large print and was probably sold only in Germany. Original Soundtrack - "Christiane F. - Wir Kinder vom Bahnhof Zoo"
Collector's notes: This is the cover variation mentioned in the previous entry. 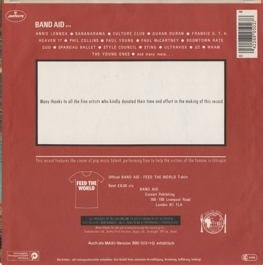 Note that the inner sleeve and the labels are also slightly different. This version might be the commonest in Germany. 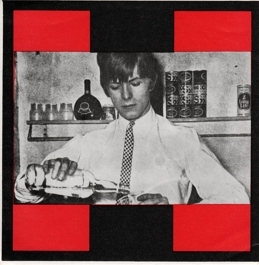 Collector's notes: A club edition (see here for some remarks on club issues), with a cover based on that in the previous entry. 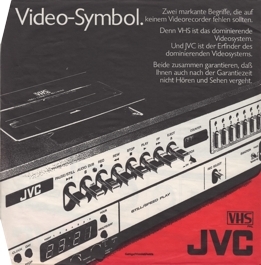 It was probably from the Bertelmann Buchclub. 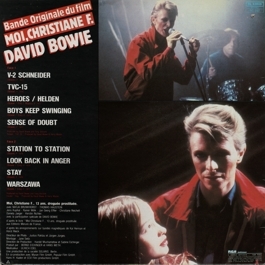 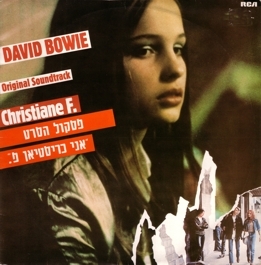 Collector's notes: Since the Christiane F. movie had different titles in different countries, the soundtrack albums appeared under these titles, too. 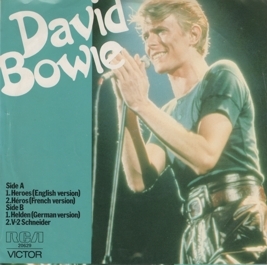 The French version has a French title on the cover, but uses the German title on the label. 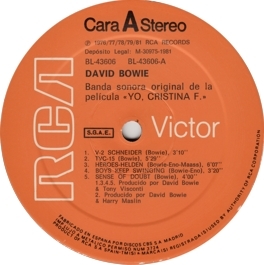 Banda Sonora Original de la Película yo Cristina F.
Collector's notes: This is the first Spanish issue, identifiable by its catalogue number. 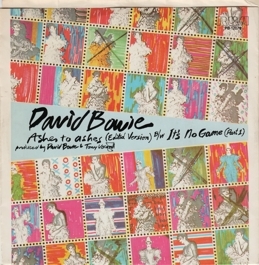 Collector's notes: Presumably a budget re-issue. 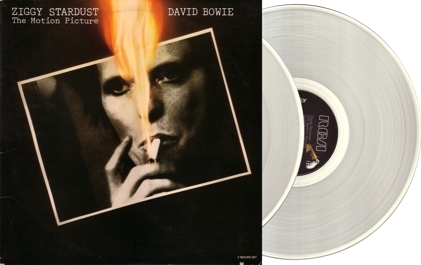 It uses the original insert and the original cover (albeit in a matt version). However, the cover bears an additional sticker on the front that covers the original catalogue number. 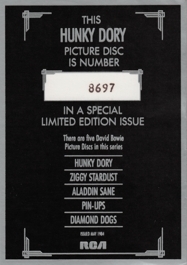 This number (BL-43606) can still be found on the cover spine and on the insert, though. There are also copies, like the one previously listed here, that come in the laminated, unstickered original cover. I can't say if these combinations are original. 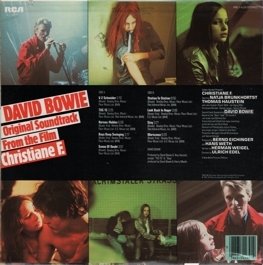 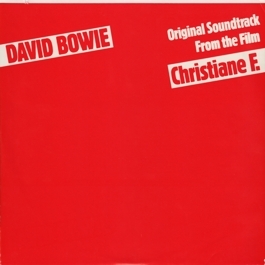 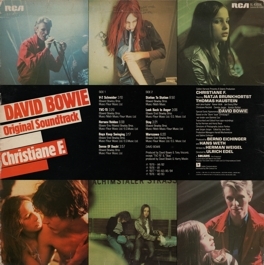 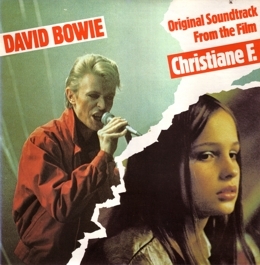 Original Soundtrack - Christiane F.
Original Soundtrack - "Christiane F."
Collector's notes: Same record (and hence labels) as the second regular German issue. 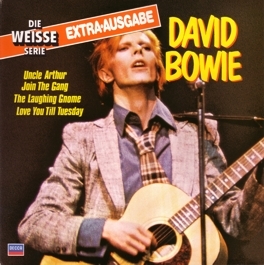 This is a German issue in a UK cover. Interestingly, the record used was the one with more German text on the labels. 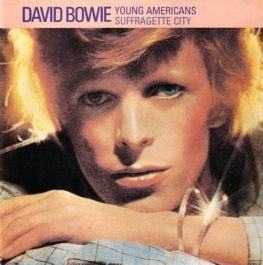 I classify this as a UK issue because of the unique cover made there. Collector's notes: At the time, this was one of the few sources of the single versions of Rubber Band and Love You till Tuesday. 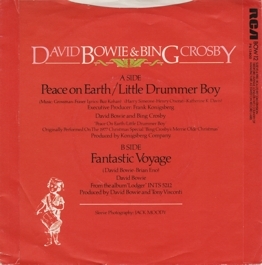 The record was soon (1982) re-pressed with silver labels, but still with the price code "AP" on the cover. 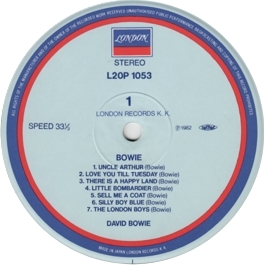 Pressings from 1983 onwards have the price code "BL". Collector's notes: Thompson lists this album under 04/1982, but this release date doesn't appear plausible. 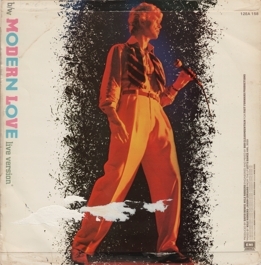 The fact that the cover has the copyright date 1981 needn't mean anything, since the musically identical British and German Another Face albums were released that year. 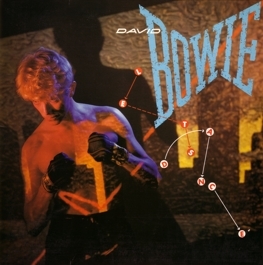 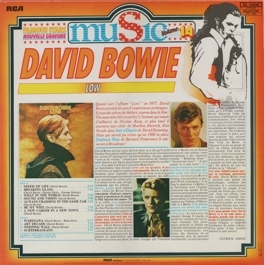 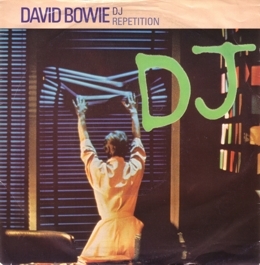 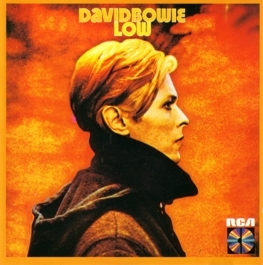 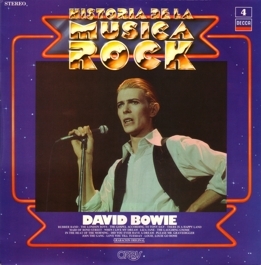 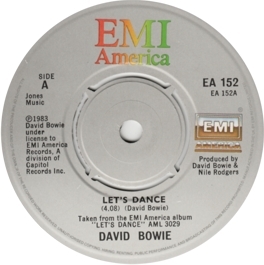 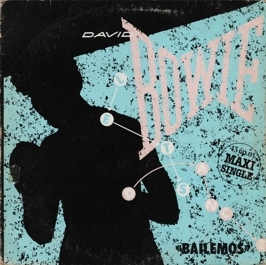 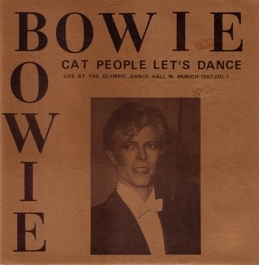 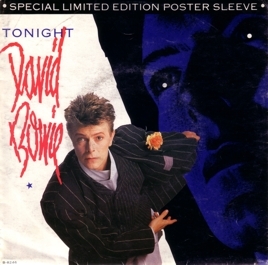 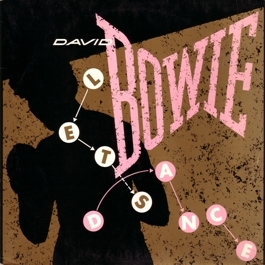 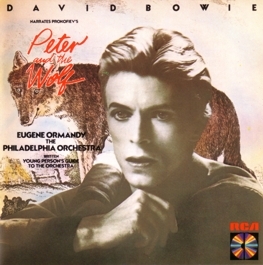 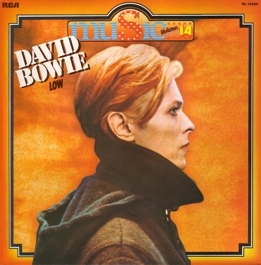 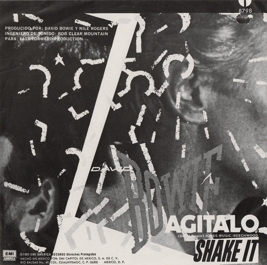 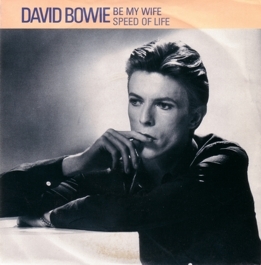 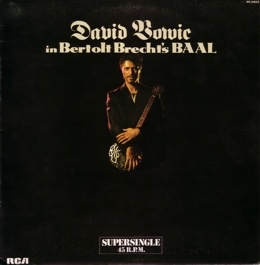 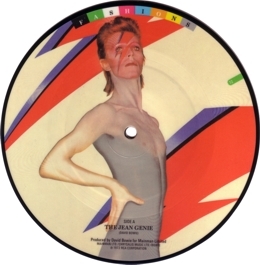 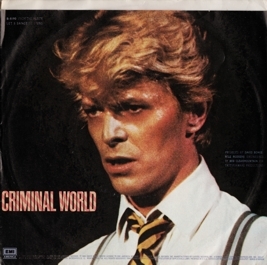 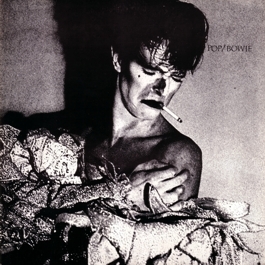 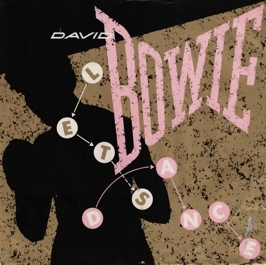 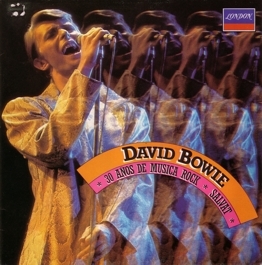 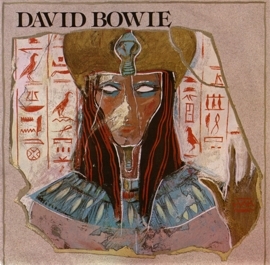 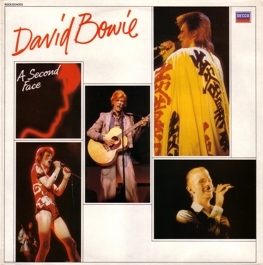 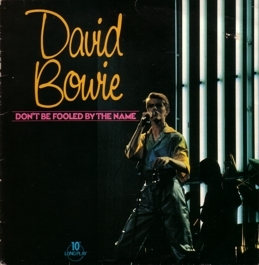 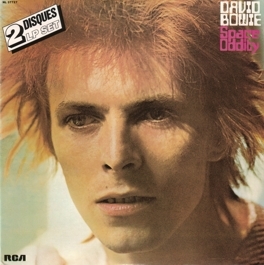 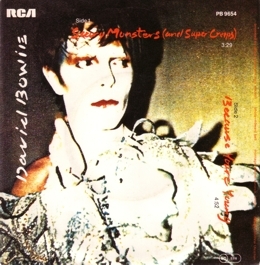 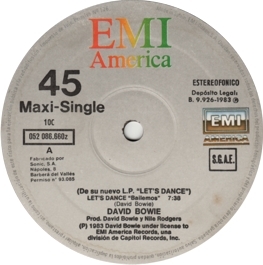 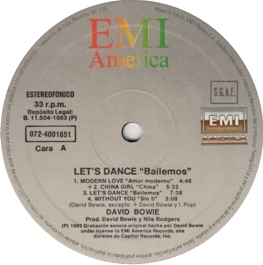 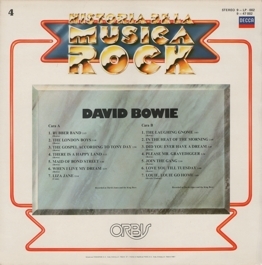 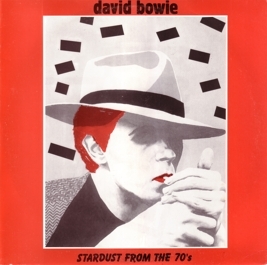 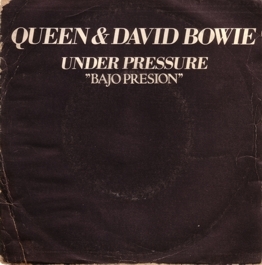 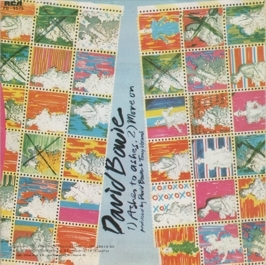 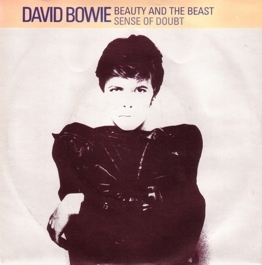 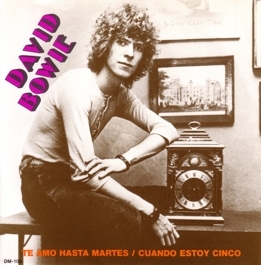 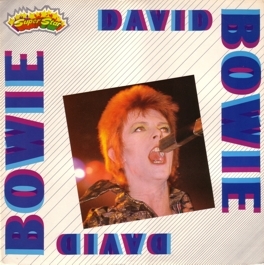 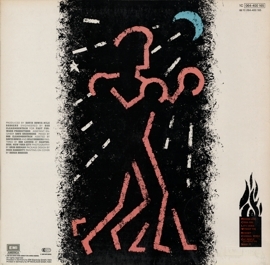 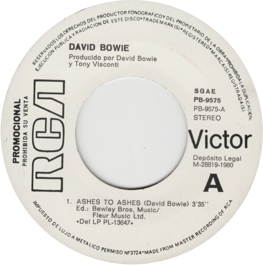 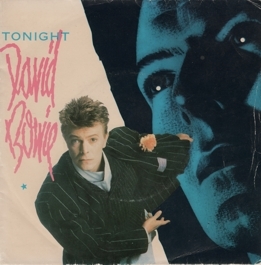 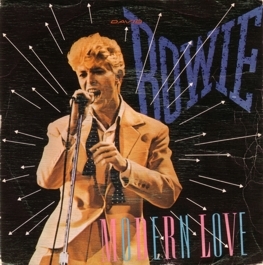 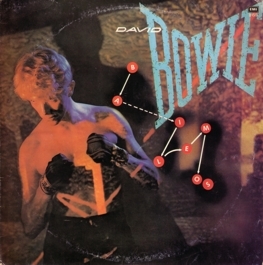 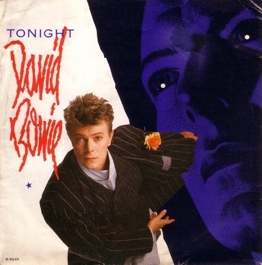 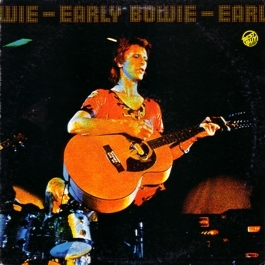 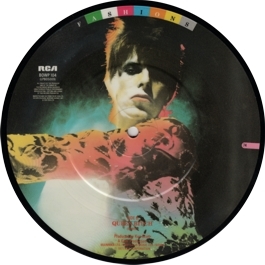 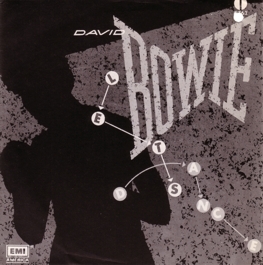 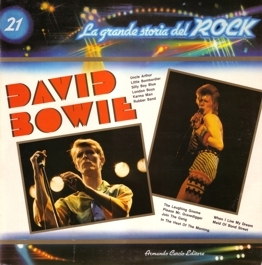 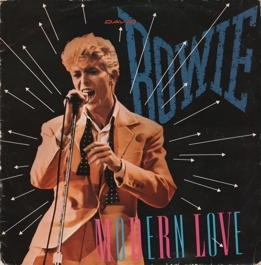 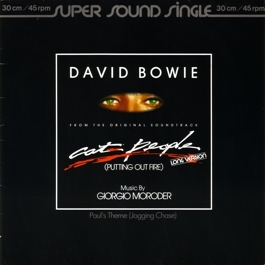 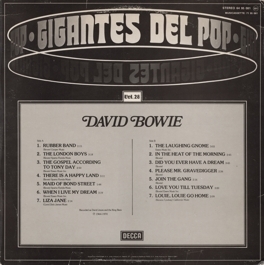 However, the "Depósito Legal" date on the label is also 1981, so the album was probably released the same year as its British and German counterparts, especially because there also seems to be general consensus on the web that the Gigantes series was released in 1981 (except on some websites referring to this Bowie release). 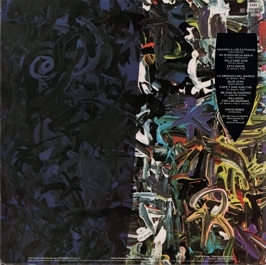 The album was re-issued in 1988. 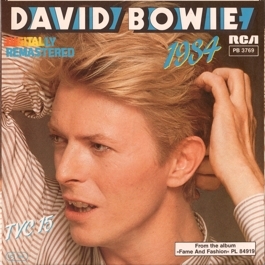 The original has "1981" in the fineprint on the cover back, whereas the re-issue has "1988" in this place. Moreover, the original edition has "Vol. 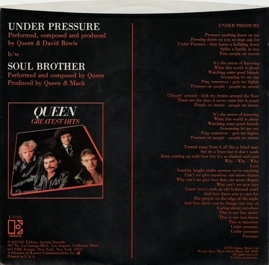 28" in the box in the middle of the cover front and back, whereas the box is blank on the cover of the re-release. 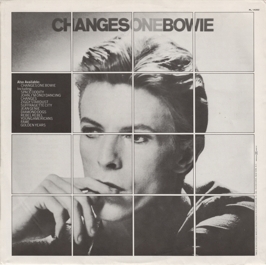 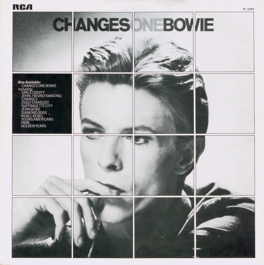 Collector's notes: Two classic Bowie albums re-packaged in a boring fold-out cover. Sadly, selling albums this way became a common practice in the early 1980s. There are also re-pressings with a black label and the same catalogue number. 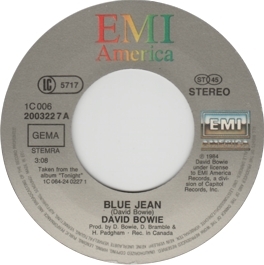 The turquoise label was as unusual as the use of the "RCA International" label, which didn't become common before 1983. 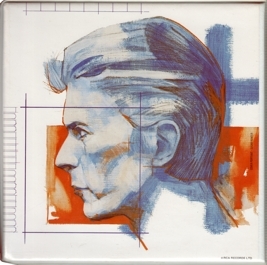 Collector's notes: This is the black label variant mentioned in the previous entry. 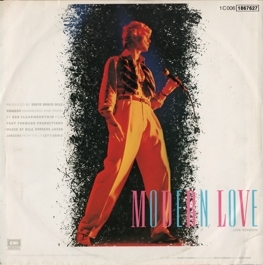 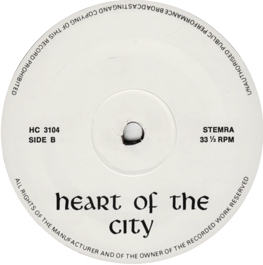 The label design suggests that this re-pressing is from 1983, since this was the year RCA introduced the "silver rim" labels. 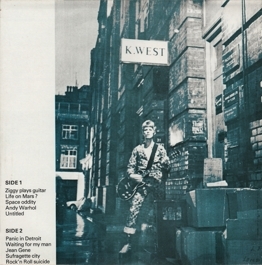 Same cover as the original issue. Note that there are also "silver rim" re-pressings with a different catalogue number (NL 89077 (2)), which have a barcode and some additional information for international distribution on the back of the cover. Furthermore, these other pressings have the copyright organization BIEM on top on the labels, whereas this copy has the German GEMA on top. All this implies that this issue was made for domestic distribution, whereas the other one aimed at an international market. 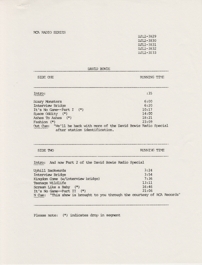 Collector's notes: At the time, this was an overdue release. 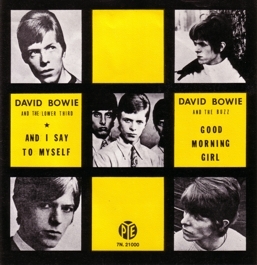 Even the re-pressings of the For the Collector EP were already getting rare, and Good Morning Girl and And I Say to Myself hadn't been officially available since 1966. 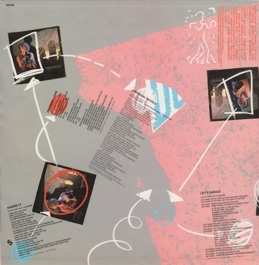 Collector's notes: If it is correct that this album was released in 1981, then France was the only other country that released the compilation in the UK cover in the early 1980s (albeit in the 12" format). 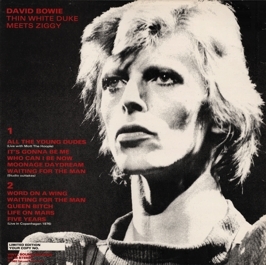 Collector's notes: The cover of the UK issue might have been inappropriate with its 1978 live shot, but compared to the Canadian artwork it was certainly beautiful! 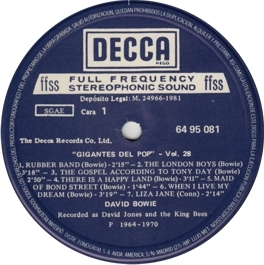 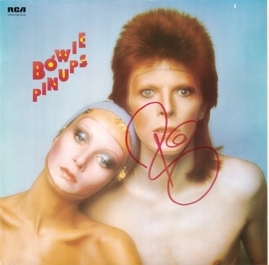 Collector's notes: A rare and rather weird Spanish release, coupling Bowie's three Pye singles with a number of other rare Pye/Piccadilly singles by British Mod/R&B artists. 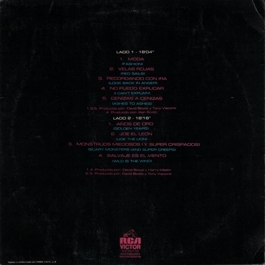 Thompson writes that this album was released 06/1982, but all information on the labels and the cover (including the "Depósito Legal" date) points at 1981. 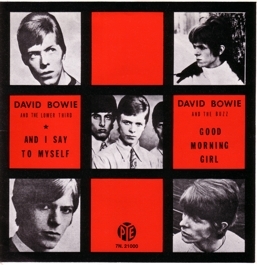 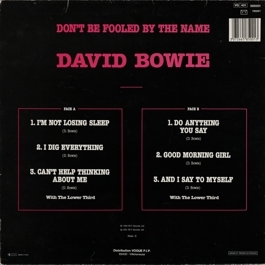 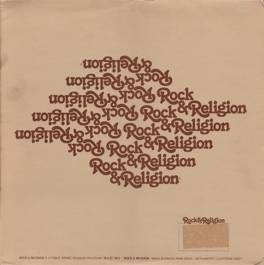 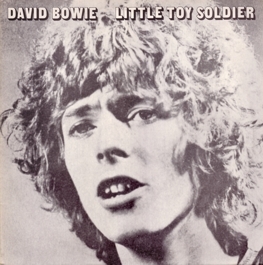 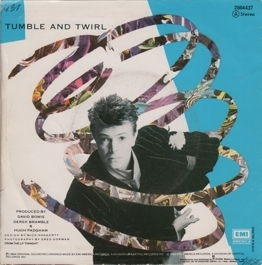 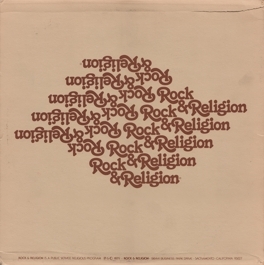 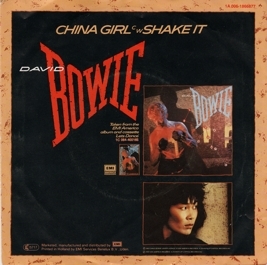 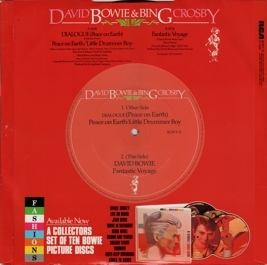 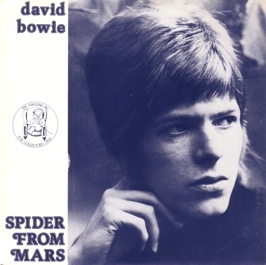 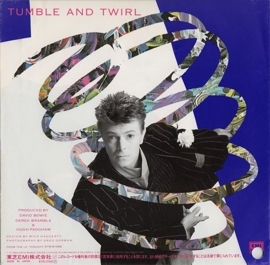 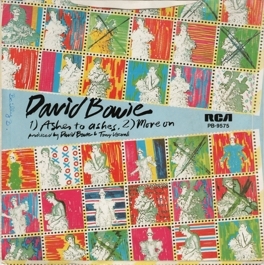 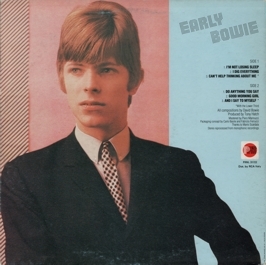 Collector's notes: A minor cover variation, with the title in a different position, similar to the US release, but with the title completely in capital letters. Same record (and thus labels) as in the previous entry. 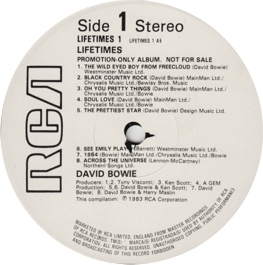 Collector's notes: This promo record was also distributed in the stock sleeve. 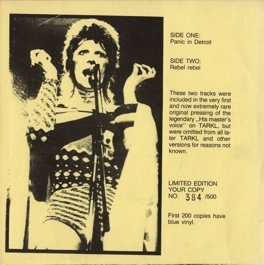 Collector's notes: There were at least two label variations. 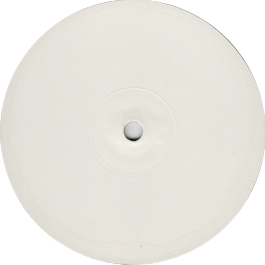 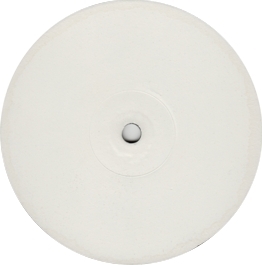 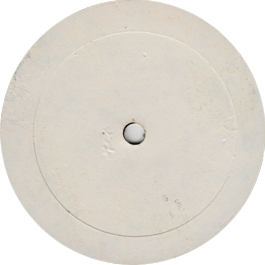 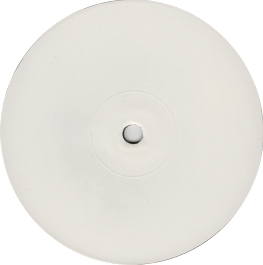 The white label shown here (which does not indicate a promo), and the cream label shown in the next entry. 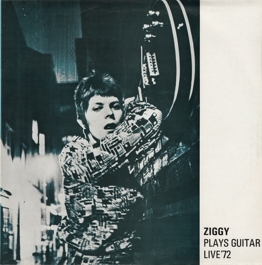 Collector's notes: Another minor cover variation. 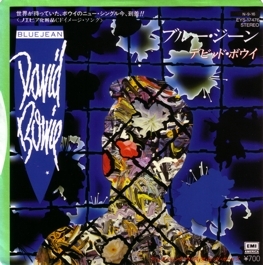 Collector's notes: The Japanese cover artwork is the only major variation that I know of. 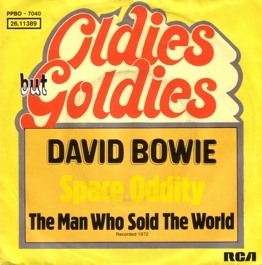 Sadly, they completely ignored Bowie. 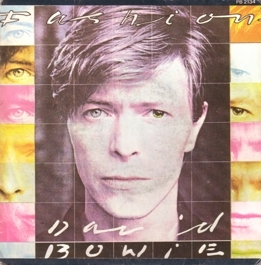 Collector's notes: A re-issue with a slightly altered cover design - there is more promotion on the front - that came just in time to supplement the Changes Two album. 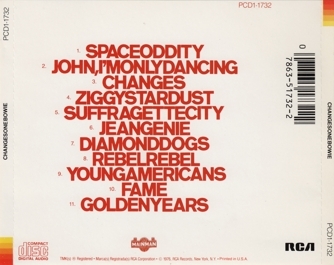 Of course, the re-issue had the standard tracklist with the original version of John, I'm Only Dancing. 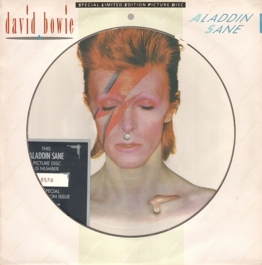 Tracks: Aladdin Sane (1913-1938-197?) 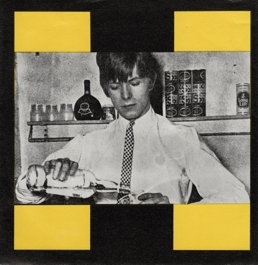 / Oh! 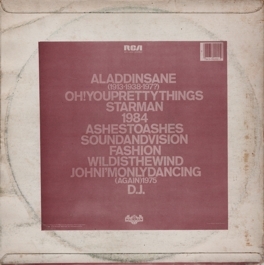 You Pretty Things / Starman / 1984 / Ashes to Ashes* // Sound and Vision / Fashion* / Wild Is the Wind / John, I'm Only Dancing (Again) (1975)** / D.J. 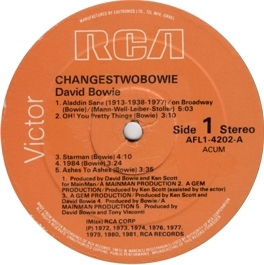 Collector's notes: RCA's follow-up to the Changes One album was a bit strange in its choice of songs. 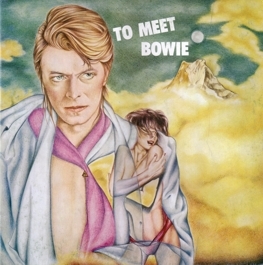 Finally, we got Starman, which had mysteriously been left off the first volume. 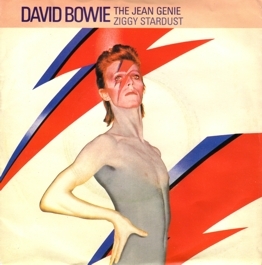 But what were Aladdin Sane and Oh! 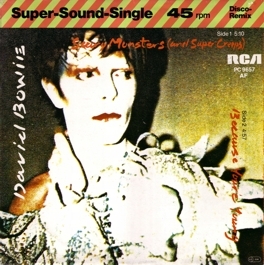 You Pretty Things doing here, instead of the more logical "Heroes", Be My Wife, Boys Keep Swinging or Scary Monsters? 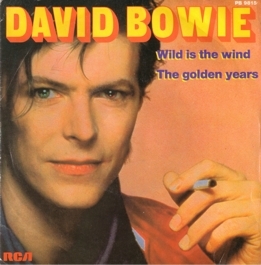 Wild Is the Wind seemed to have been included only to have a candidate for a new single release. 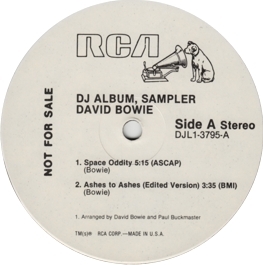 Anyway, RCA's release policy in those days was far from logical. 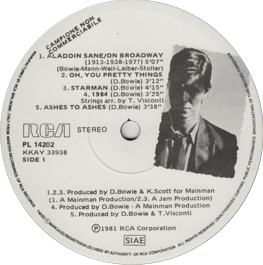 Note that the label lists the Mann/Weil/Leiber/Stoller song On Broadway as part of Aladdin Sane because Mike Garson's piano playing "quotes" from that song. 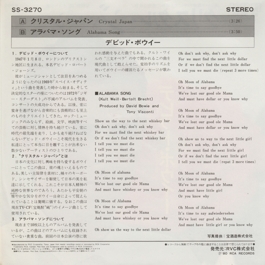 However, the version is the original studio recording. Collector's notes: The Israeli cover is the only cover variation that I know of (unless you count the certainly inofficial Korean issue). 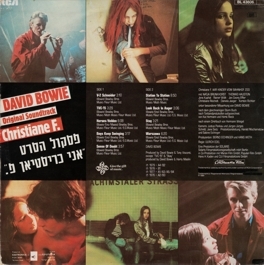 The white box on the cover, which is not a sticker, but printed, contains Hebrew text - probably the tracklist. Collector's notes: There is a minor difference between the covers of the Italian promo and stock copies. Whereas the catalogue number in the top right corner of the cover front is white in the case of stock copies, it is dark blue in the case of promos like this. 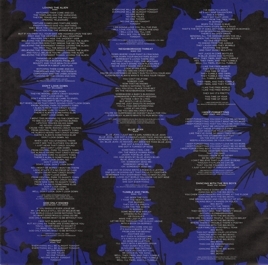 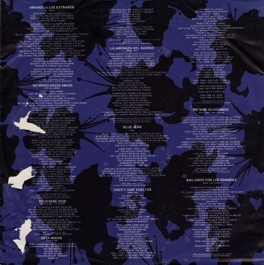 The back of the inner sleeve is also slightly different: the covers are arranged in a different order. The Italian release (including promos) is quite interesting in that it had picture labels long before these became common. 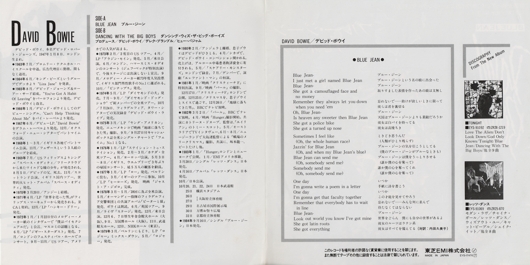 Collector's notes: Another pirate issue from South Korea. 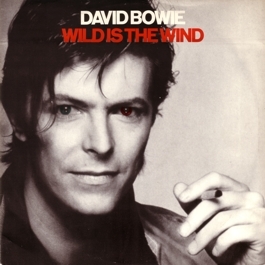 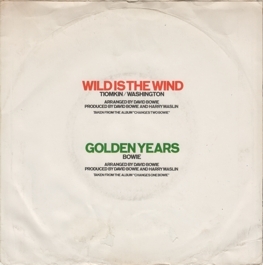 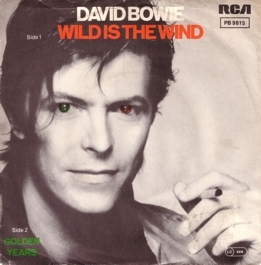 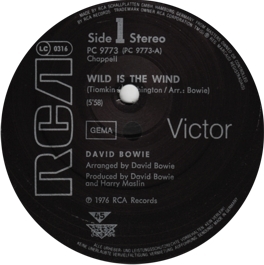 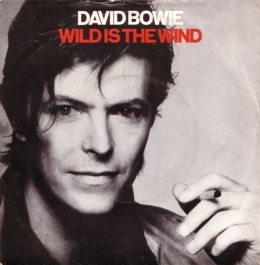 Note that both sides play the full-length album versions, even that of Wild Is the Wind with about six minutes. 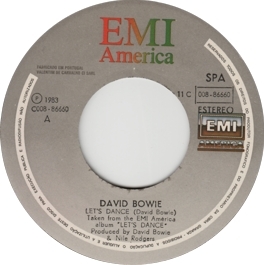 Collector's notes: The orange label version is probably the first one. However, around this time RCA Germany started experimenting with black labels, so it may be the case that there are also black label copies that can count as first issues. 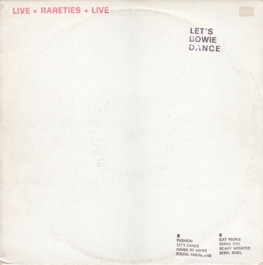 Collector's notes: This is one of the black label copies mentioned in the previous entry. 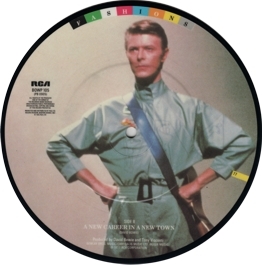 As you can see, the A-side label of my copy is placed terribly off-centre. Fortunately, it doesn't touch the playing surface. 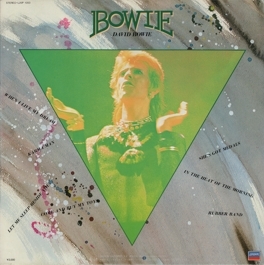 Same cover as in the previous entry. 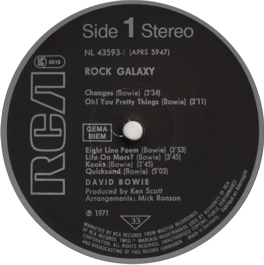 Collector's notes: This re-issue is presumably from 1982, since it has the same exceptional turquoise labels as the original issue of Rock Galaxy, and is also on the RCA International label. 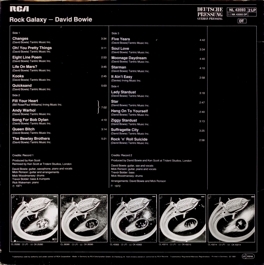 Furthermore, the back cover design resembles that of the Rock Galaxy album. 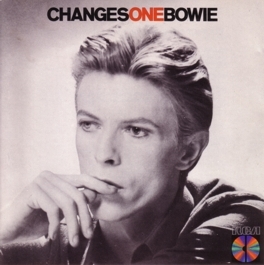 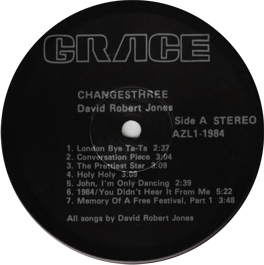 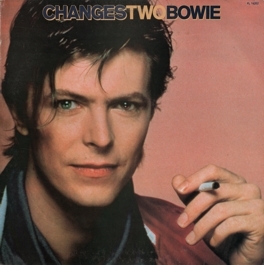 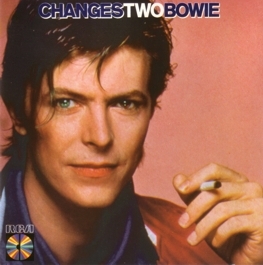 However, the promotion for the Changes Two album shows that the record can't have been released before November 1981, so that early 1982 is a good guess. 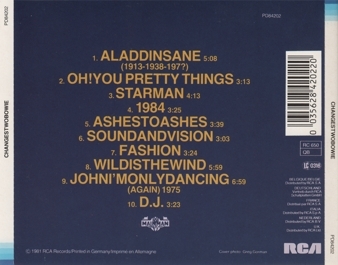 An interesting aspect about this album is that it is the first German issue of this LP with the UK tracklist (i.e. with the long English version of the title track). 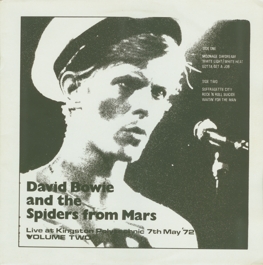 Collector's notes: So now we had a badly edited 1974 show with a 1978 live cover shot... 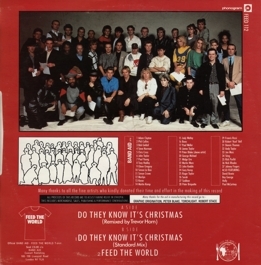 There is also a German issue from 1984. 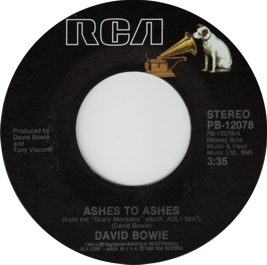 Collector's notes: From 1982 onwards, RCA Germany re-pressed several Bowie singles with these black labels. 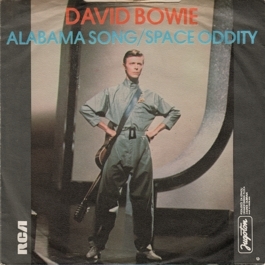 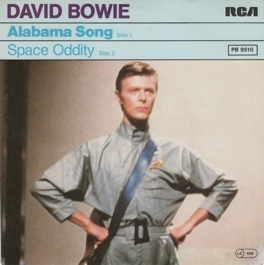 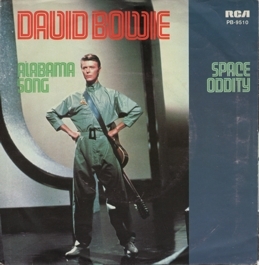 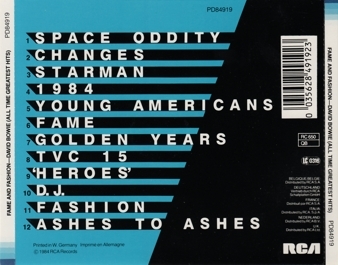 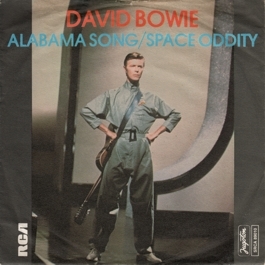 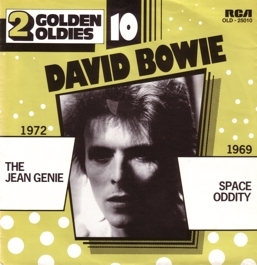 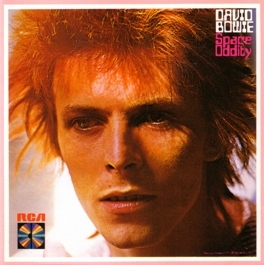 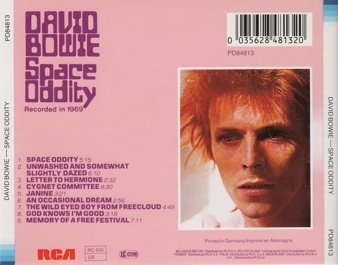 However, Space Oddity was the only one that also displayed a difference in the cover design: whereas original pressings had the same design on the front and the back, this issue had a list of the singles of the Oldies but Goldies series on a white cover back. 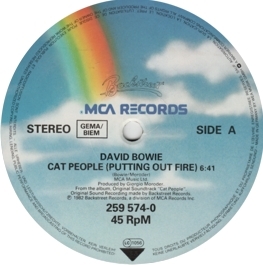 Collector's notes: This record is often assumed to be a 1977 release (because this is the only year on the cover and labels), but not only do I remember when it first turned up in record stores (namely in 1982! 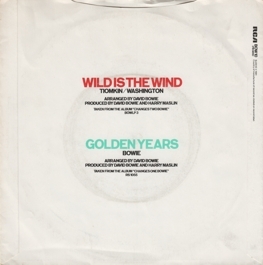 ), but the catalogue number fits perfectly between the Wild Is the Wind and Alabama Song/Amsterdam 12" singles. 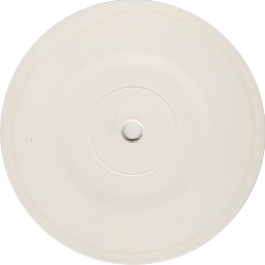 There are also pressings with black labels. 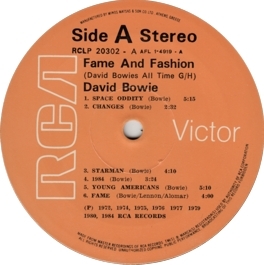 Collector's notes: Another 12" that was distributed with both orange and black labels. 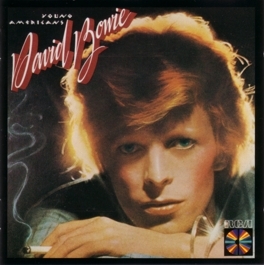 Collector's notes: The black label version; same cover as in the previous entry. 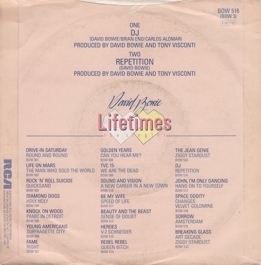 Collector's notes: I have filed this record under 1982 because that is the year on the cover and the inner sleeve. 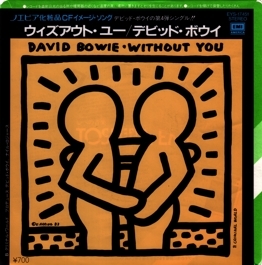 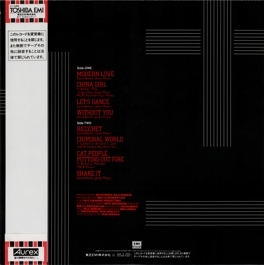 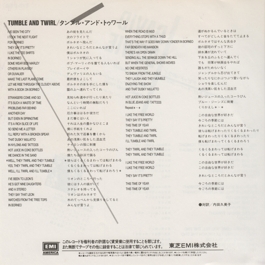 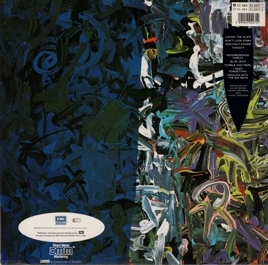 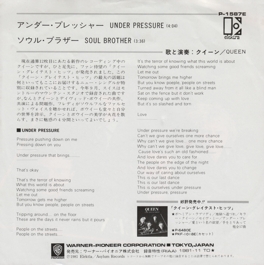 The same cover design was used for the Japanese and South African releases. 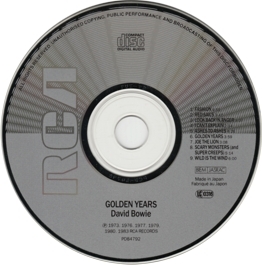 Collector's notes: The label of the Italian issue has the year 1982. There's a lot of German text on the back, which seems to have been copied from the German issue. 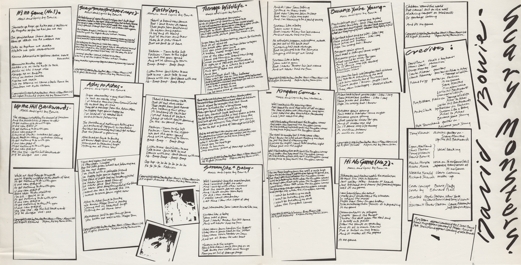 This particular copy came with an additional large lyric insert, which was probably not originally included. 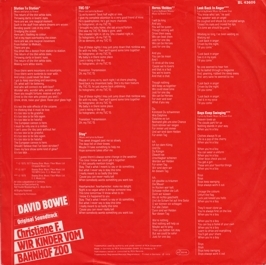 It looks like a proof print of some kind, is slightly larger than a gatefold cover, and has "Made in Germany" together with the Italian album title on it. 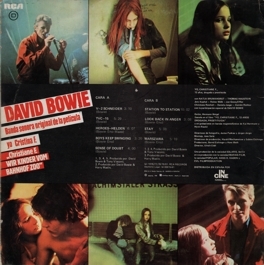 The back of the insert (not shown) has Italian lyrics for some non-Bowie album. 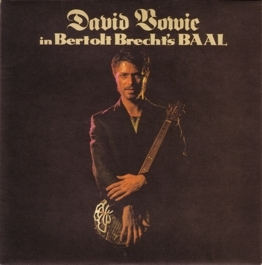 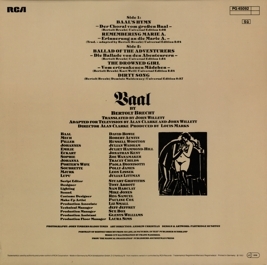 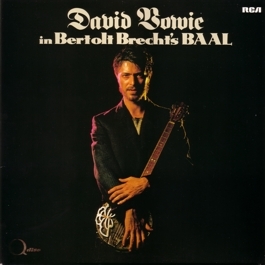 Collector's notes: The songs are not the same recordings as in the broadcast of the Baal TV play, but re-recordings made immediately after shooting it. 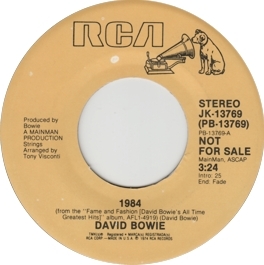 They were the last recordings Bowie made for RCA. 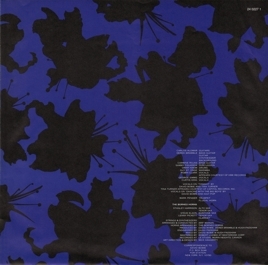 The UK EP came in a nice multi-fold-out cover. 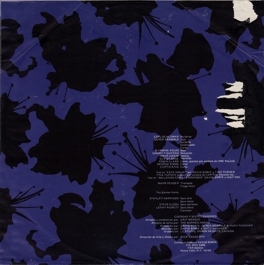 The label deviates minimally from the standard black label, and the record was housed in a plain black die-cut sleeve. 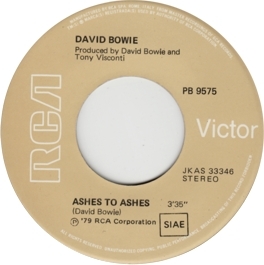 Note that for all I know RCA UK were the only ones who opted for the 7" format. 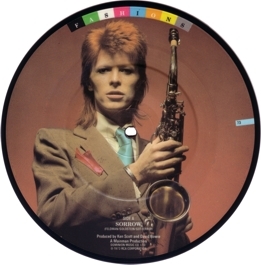 All other issues are 12" records. Collector's notes: RCA Germany didn't seem to know what to do with this record. 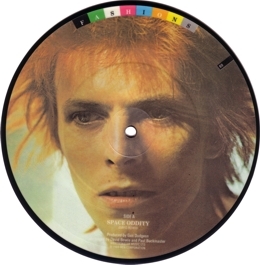 It runs at the speed of 33 1/3 rpm, which was reserved for LPs in Germany. 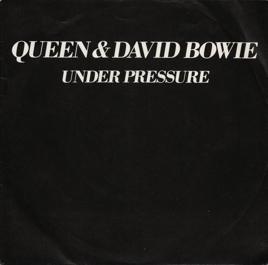 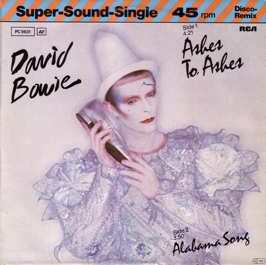 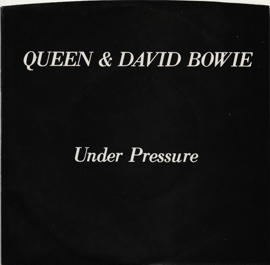 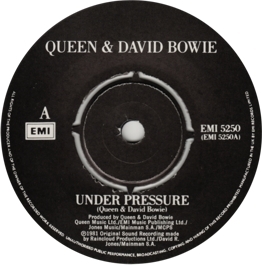 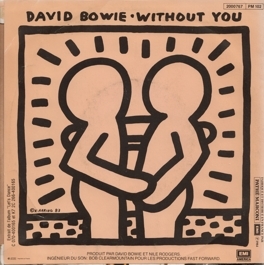 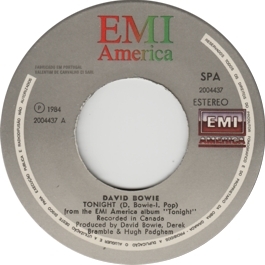 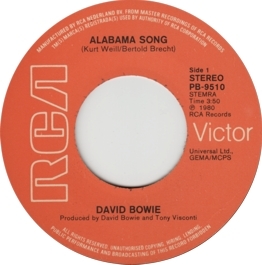 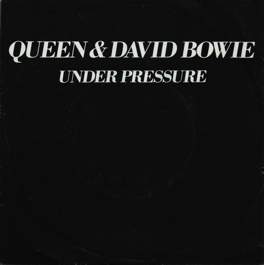 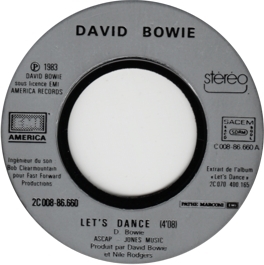 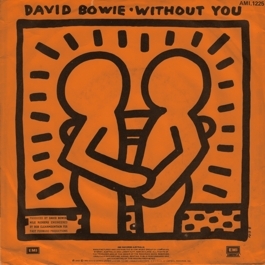 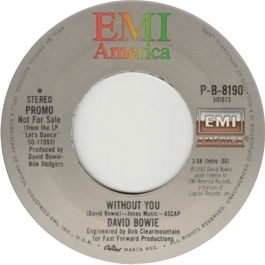 Collector's notes: Although Bowie is also listed as the artist of the B-side, he was not involved in the recording of this track. Collector's notes: In the 1980s, when picture sleeves became commoner in the USA, many promos were distributed with such sleeves, too. 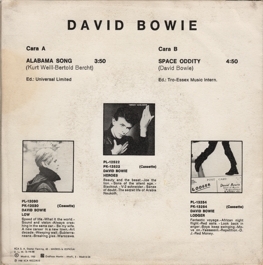 However, sometimes no separate promo sleeve was printed, but the companies simply used spare copies of the stock sleeves (even if the information concerning the B-side didn't match the actual record). 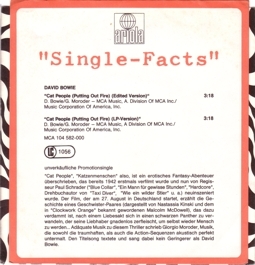 Collector's notes: An unusual German promo-only single of the kind more familiar from the USA. 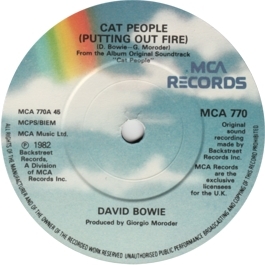 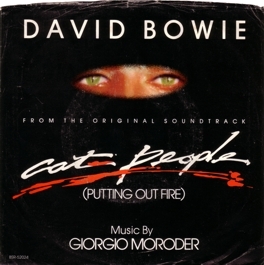 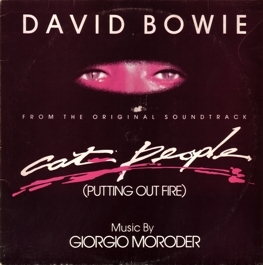 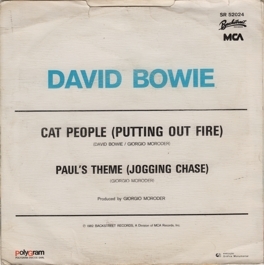 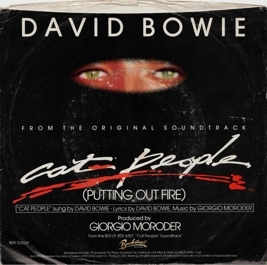 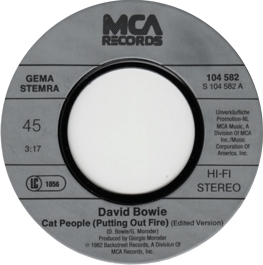 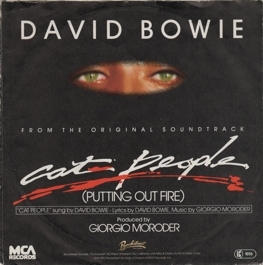 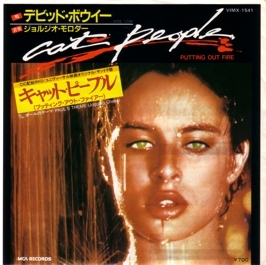 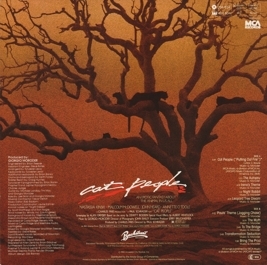 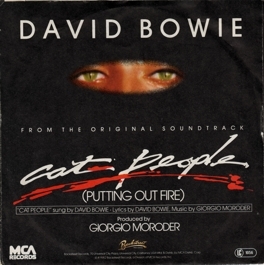 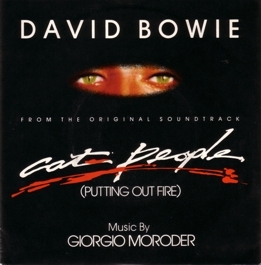 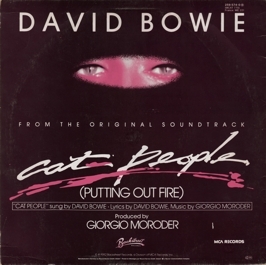 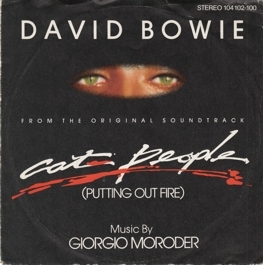 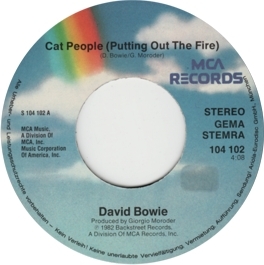 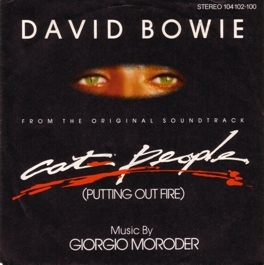 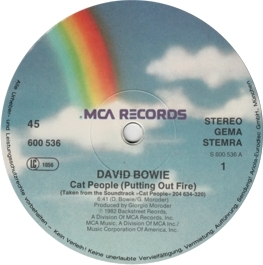 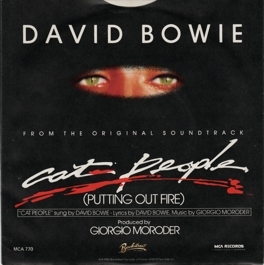 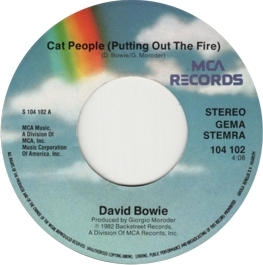 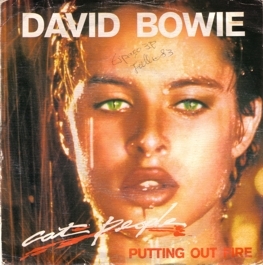 Collector's notes: Note that the German label incorrectly calls the song Cat People (Putting Out the Fire). 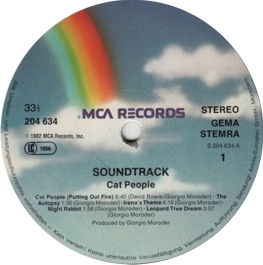 Collector's notes: This alternative issue of the German Cat People 12" was probably made for export and was available until the late 1980s. 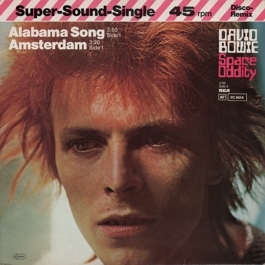 Collector's notes: The only difference between this Dutch issue and the German one is the fineprint at the label margin (which says "Ariola-Benelux B.V. Haarlem" on the Dutch copy). 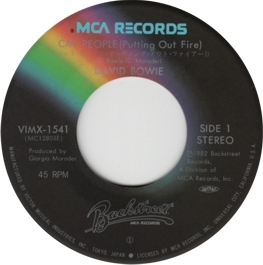 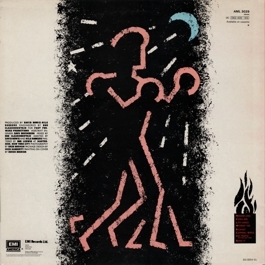 Even the error in the title ("Putting Out the Fire") can be found on the labels of both issues. 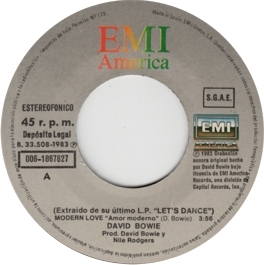 Collector's notes: The Portuguese release plays the album version, and is thus as long as the 12" singles. 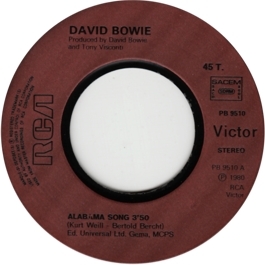 Collector's notes: There is an alternative German pressing with the catalogue number 250 433-1. 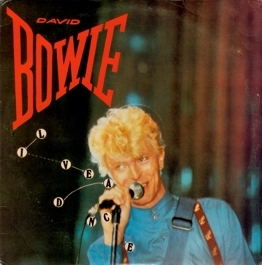 I don't know if both pressings are from 1982, but the one shown here definitely is. 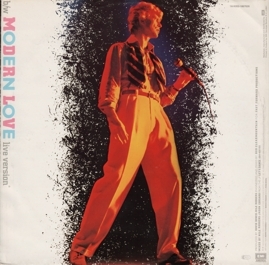 Collector's notes: Jarman claims that this re-issue is from 1981, but comparisons with other Decca catalogue numbers from the time show that Thompson's release date is more plausible. 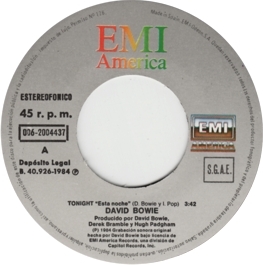 Collector's notes: Very good sound quality. 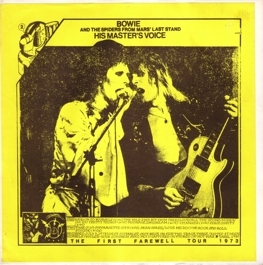 This bootleg, Bowie's 1973 "farewell show", had been available before in slightly different versions. 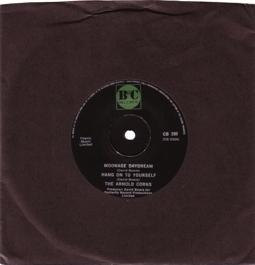 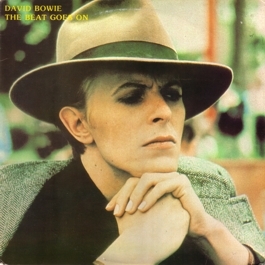 One such version had been part of the The Beat Goes On double album. 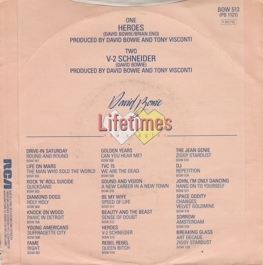 Collector's notes: The label shows the original title of this LP. The sound quality is comparable to the original, but Rebel Rebel and I'm Not Losing Sleep sound as if there were skips - they obviously used a defective copy of Soft in the Middle to make this album. 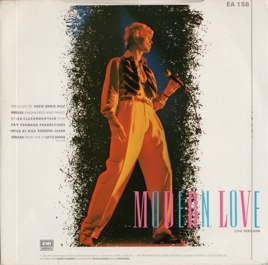 Collector's notes: The most interesting tracks on this album are 1984/Dodo, which was still quite rare at the time, and the acoustic demo version of Love You till Tuesday, which includes an additional verse. 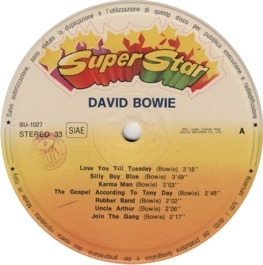 The sound quality of the recordings on this LP varies between "acceptable" and "very good". 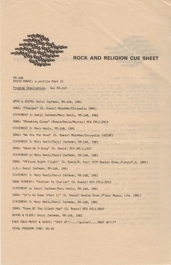 For You're Holding Me Down, see the entry in the "Apocrypha" section under "Contributions etc.". 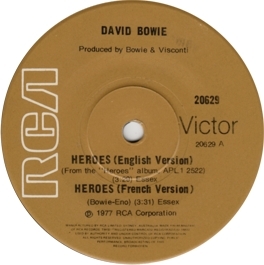 Collector's notes: The only interesting aspect about this box set is the inclusion of the French version of the "Heroes" album. 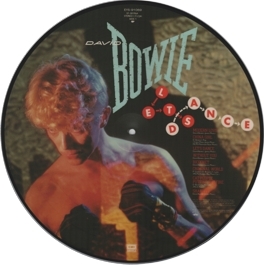 Nonetheless, it was re-pressed in Germany in 1984. 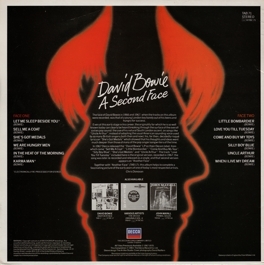 The back of the second insert is plain white. 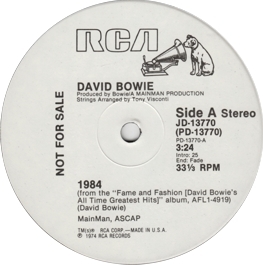 Collector's notes: The label gives only the year 1981, but that needn't mean anything. There is conflicting information on the web as to when the Spanish Historia series was released: some claim it was in 1981, others write it was in 1982. 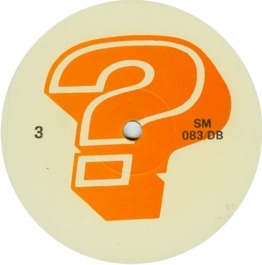 I'll go for Thompson's release date 08/1982 then. Collector's notes: A pleasant set, but the quality of the pressings isn't the best. 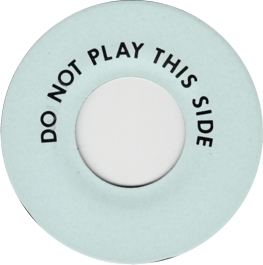 Made to be looked at, rather than to be played. Collector's notes: Pegg writes that this single was released in October 1982, but I doubt that the first copies turned up before November. 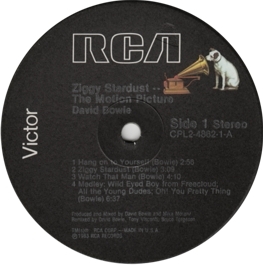 Collector's notes: A kind of "pseudo-picture-disc" with paper labels that have the size of a 7" single, and a die-cut cover with holes that fit the size of the labels. Collector's notes: An unusual promo from the Netherlands. 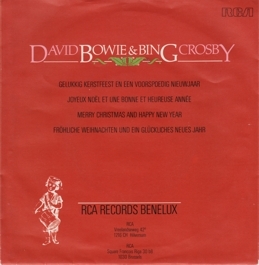 Although the cover front has basically the same design as the other issues, it's a special promo cover with Christmas greetings in Dutch, French, English and German on the back. 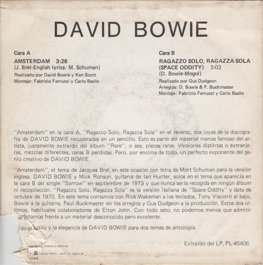 Collector's notes: At the time, this was a pleasant record, especially for the inclusion of Ragazzo Solo, Ragazza Sola, which here saw its first release since 1970. 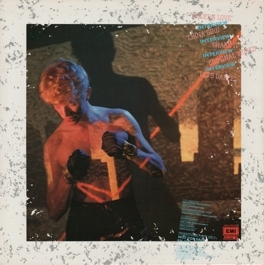 Rare was the first "new" German Bowie album that was released with black labels. 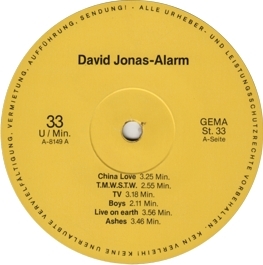 This label design was also used for (non-budget) re-issues until RCA Germany finally settled on the "silver rim" labels in 1983. 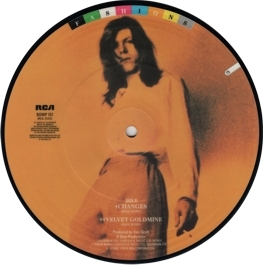 Collector's notes: The A-side is the acoustic demo of the song in very good sound quality, the sound quality of side 2 is acceptable. 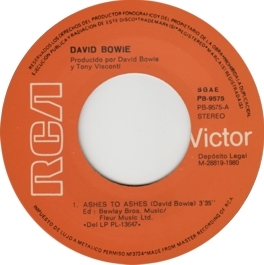 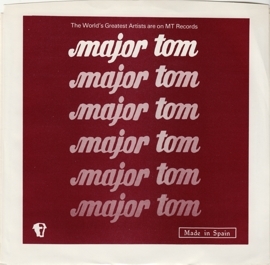 This single is funny in that it couples two familiar bootleg "labels": the label of the record revives Dream records (again mocking a 1960s US Deram promo), and the cover consists of an insert plus a Major Tom company bag with a pseudo-Spanish layout. 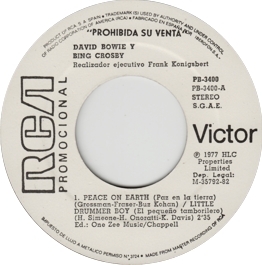 Which makes no sense at all, by the way: Spanish singles never came in a company bag with an insert. 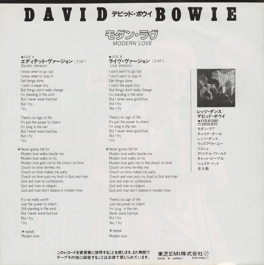 That was reserved to Japanese releases. 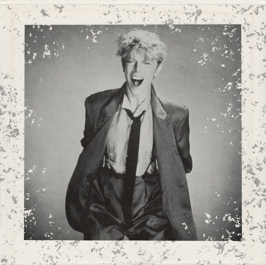 Be that as it may, it's a nice release! 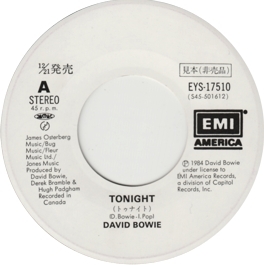 Collector's notes: The sound quality is quite good. 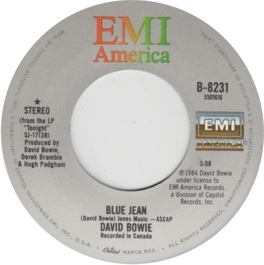 Collector's notes: The sound quality isn't much better than on the earlier issue, but the pressing quality is worse. 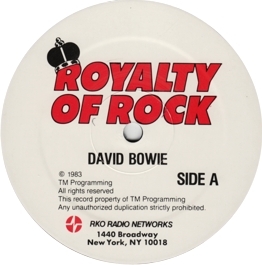 A true collector's item, nothing else! 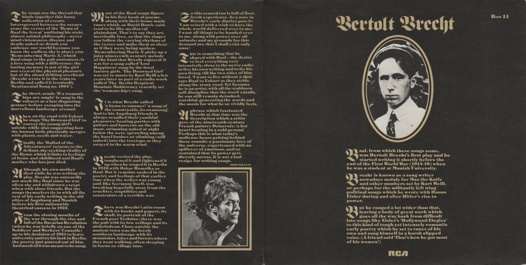 Collector's notes: An issue for the "Bertelsmann Buchclub" (see here for some remarks on club editions). 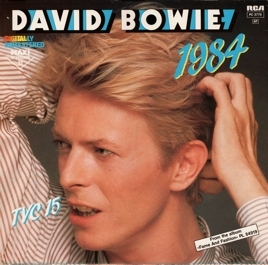 The catalogue number suggests 1983 as the year of release. 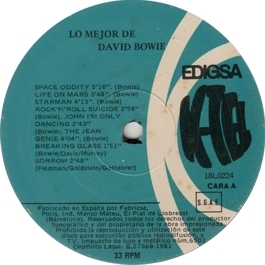 The "Depósito Legal" date on the record is 1983; furthermore, my copy has the hand-written note "18/4/83", which is probably the date of the Spanish release of the album. So 03/1983 seems to be a good guess for the release date of the single. 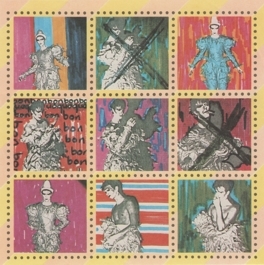 Collector's notes: The sticker on the back says "Manufaturers Property - Not for Sale". 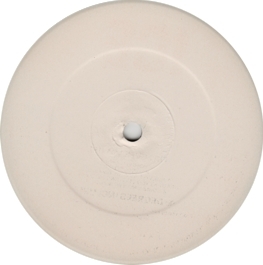 So this copy might be a promo or some kind of test-pressing. 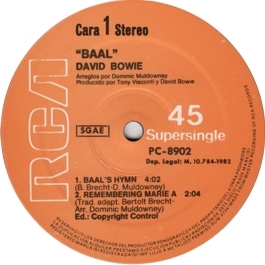 Collector's notes: An interesting cover variation from Spain. 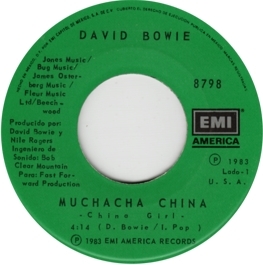 Collector's notes: You had to turn to Mexico to find a major variation of the 7" cover. 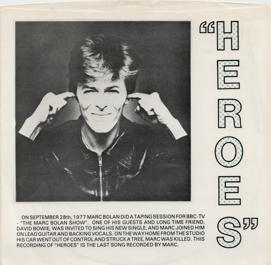 Collector's notes: Another rather silly promo-LP, similar to the 1980 Interview album. 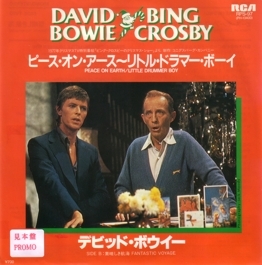 At least there's also some music on it this time. Note that this is a completely different album than the Danish Let's Talk LP. 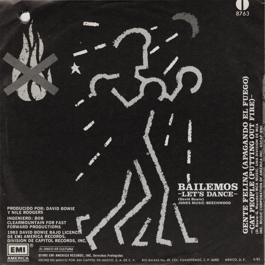 Collector's notes: The only noteworthy cover variation I have seen: the dance steps on the front yield the Spanish title "Bailemos". 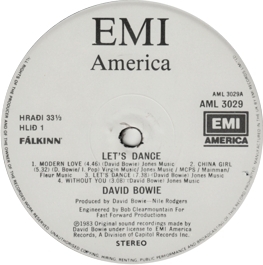 Collector's notes: According to the seller of this record, Iceland imposed a luxury tax of 85% on vinyl imports between 1981 and 1984, so four Icelandic companies decided to have their own records pressed by a pressing company called "Alfa", located in Hafnarfjöður. 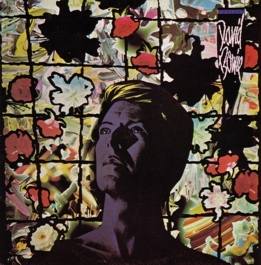 Most covers were printed by "Prisma", also located there. 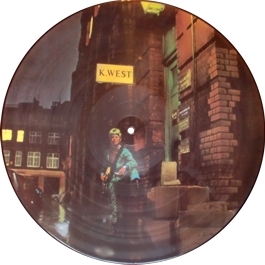 Albums were pressed in a quantity of about 250 to 500 copies. 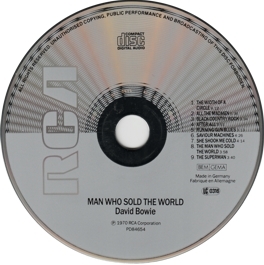 The seller claimed to have contacted two former record company managers, who, however, couldn't provide any information on the exact quantity. 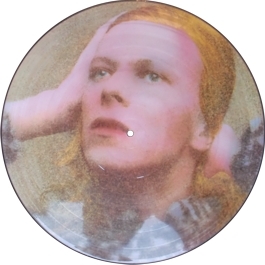 So this is the information from the seller. 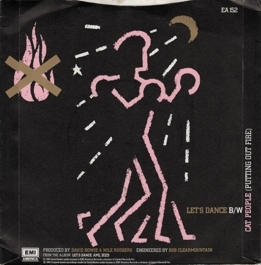 The only problem is that this story can't be true (at least if you take all of it literally): the labels of this Let's Dance album says "Manufactured in the UK" and the cover is simply that of the UK issue. 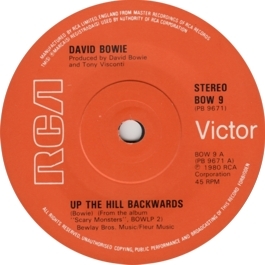 So it seems that these records were actually made in the UK for the Icelandic market. 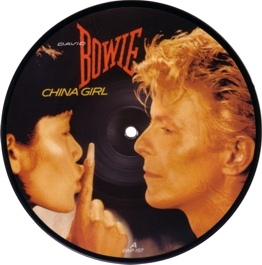 Maybe there was some tax reduction if the albums were not simply foreign copies, but copies clearly marked to be made for the domestic market, but that's only speculation. There are also Icelandic copies of the Tonight album. Collector's notes: Another typical South Korean pirate release. 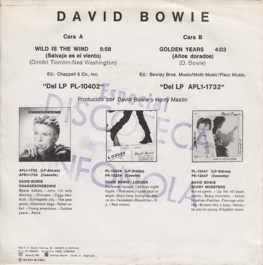 Collector's notes: As often, the Spanish issue adds the Spanish title to the cover and labels. And (again: as so often) there are numerous minor differences in the covers, inner sleeves and labels of the Spanish issues of this LP. 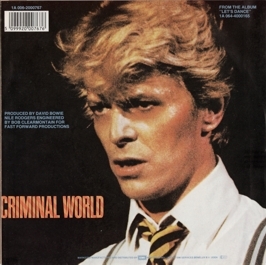 Note that this issue might be a re-pressing. 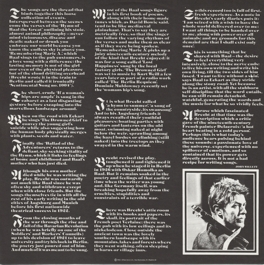 Collector's notes: The interview was still interesting, but of course it's not half as interesting without the music they are talking about. 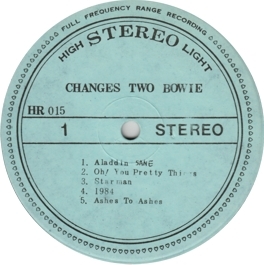 Frifelt writes that this record came with the first 100 copies of the bootleg The Thin White Duke Meets Ziggy, but was later re-pressed. 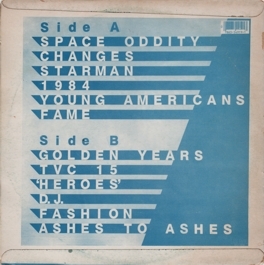 I don't think that this order of events is correct. 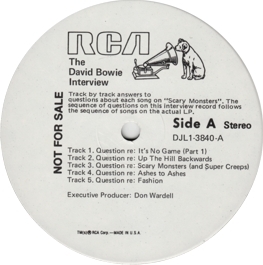 Interview records like this are almost always semi-legal items, but normally - and unlike bootlegs - they are ignored by the record industry. 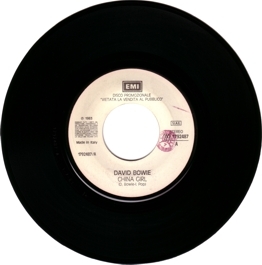 Because of this they are often sold in regular record stores, which is where I bought my copy. 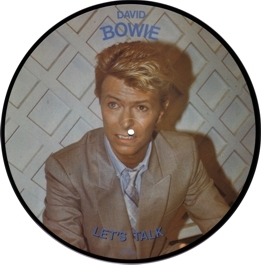 So it seems more plausible to me that the bootleggers bought a hundred copies of Let's Talk and added them to the first 100 copies of their product to create something like a limited first edition. What is true, though, is that for a while this record was quite rare, but was soon re-distributed in large quantities in a die-cut cover. The release date 04/1983 is from Thompson. 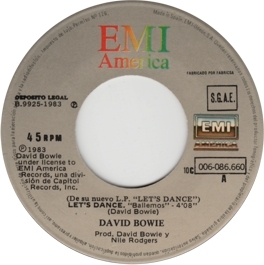 Note that the release has nothing to do with the regular US promo-LP Let's Talk. 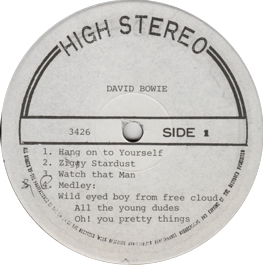 Collector's notes: The signature might be a fake and the minor cover variation (a small white margin on the right-hand side of the cover) may be negligible, but this release is a good opportunity to warn you of certain pressings. 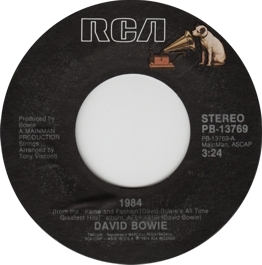 In 1983, RCA Germany started re-issuing Bowie albums - especially early ones - in their "RCA International" series (with these black "silver rim" labels). 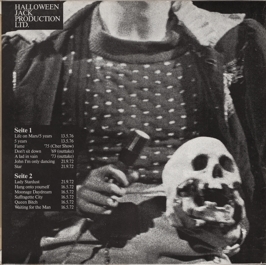 They were usually available at budget prices. 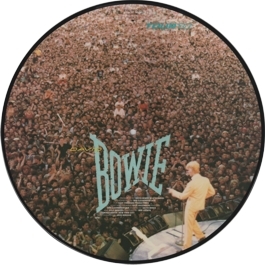 But note that many of them had a sound quality that was far below that of the original. 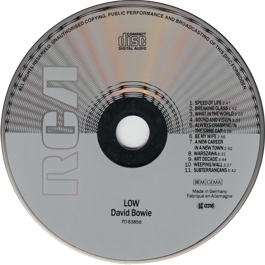 I've heard (and once had) several of them, and I particularly remember an extremely "dull" TMWSTW. 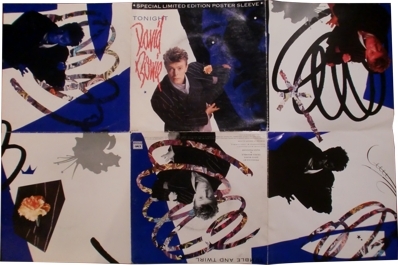 So keep your hands off them, unless you are an absolute completist! 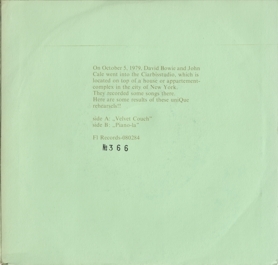 The release date is from the fine print on the cover back ("C 4 83 EUR"). 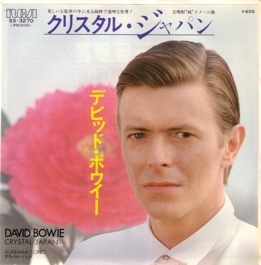 Collector's notes: Exceptionally, this Japanese single had a "real" picture cover, i.e. 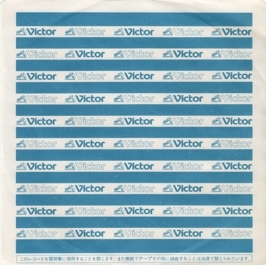 not only a company bag with a picture insert. 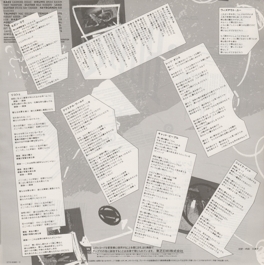 However, it came with a one-sided insert with the Japanes lyrics. 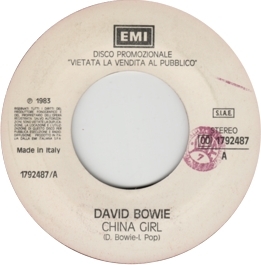 Collector's notes: This Malaysian jukebox promo is similar to the Italian issues with two different artists. 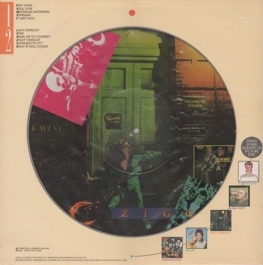 However, it's quite likely that such Malaysian releases were not authorised (note the lack of a record company on the label). 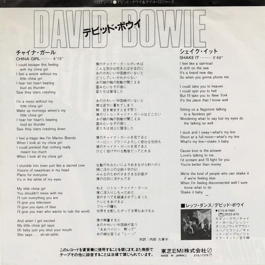 Collector's notes: For this release EMI Japan returned to the familiar Japanese cover layout - a company sleeve with an insert. Collector's notes: Dutch copies, with their slightly different cover design, were also sold in Germany. 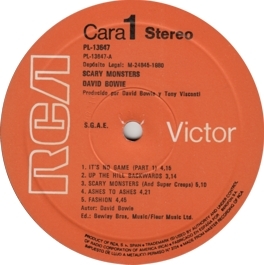 Collector's notes: Unlike its American counterpart, RCA UK never produced a lot of promo-only records. 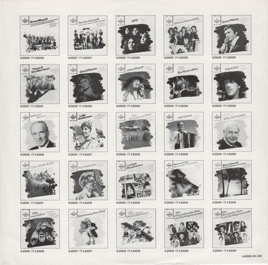 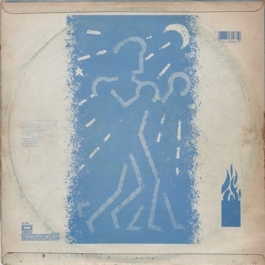 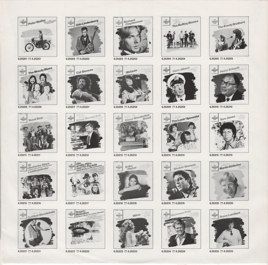 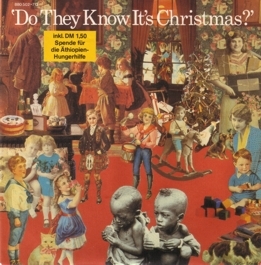 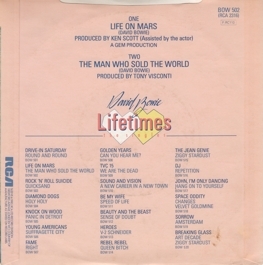 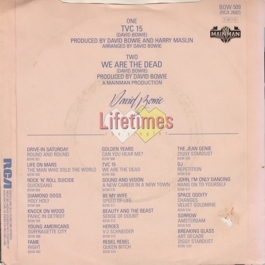 This album was published to promote the upcoming Lifetimes series of single re-issues. 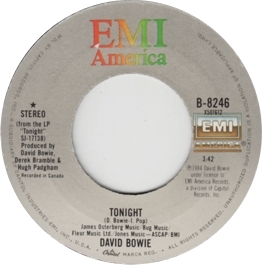 Pegg claims that this one was released in August, but it doesn't appear plausible to me that this album was released two months after the singles it was meant to promote. 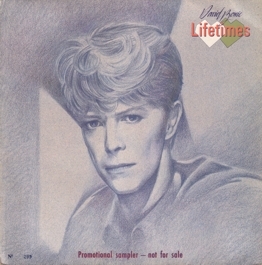 Collector's notes: All singles of the Lifetimes series were also issued as rather elusive Irish pressings. The Irish singles have completely different labels: no Lifetimes logo and a solid centre. They were sold in UK covers. 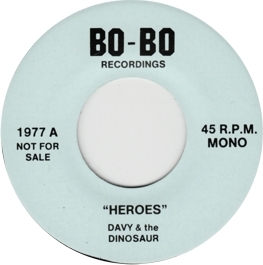 Collector's notes: This solid centre copy plays the correct B-side. 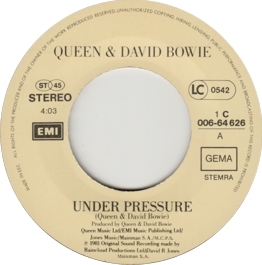 Mis-pressings with a push-out centre and an incorrect B-side seem to be commoner. 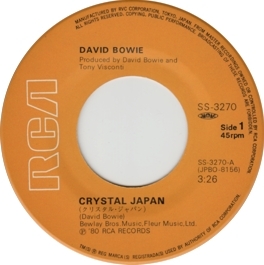 Collector's notes: There are actually copies that play the correct B-side. 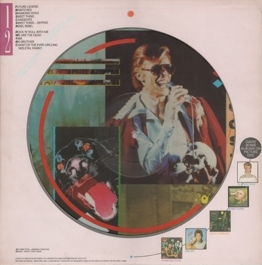 The problem is that, in order to find them, you must either play the record or look at the matrix numbers: copies with the number "A-1U-1-1-" or "A-1U-1-1-11" in the run-out groove of the A-side play the correct track (information partly from Chas Pearson's website). 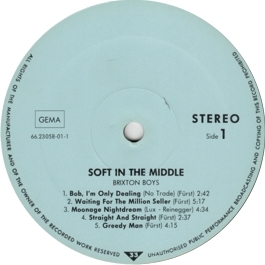 Note that the solid centre/push-out centre distinction is not a sufficient criterion. 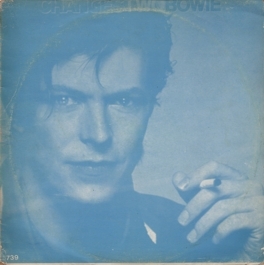 Same cover as in the previous entry. Collector's notes: Since the two mixes of the original version of John, I'm Only Dancing are only minimally different, it is difficult to say, but my impression is that the disc acutally plays the newer mix from the 1979 single. 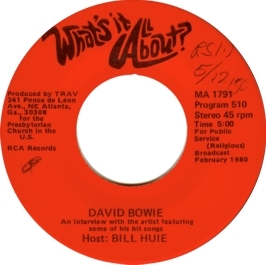 Collector's notes: A typical US radio show, discussing Bowie's career and persona, interspersed with excerpts from interviews. 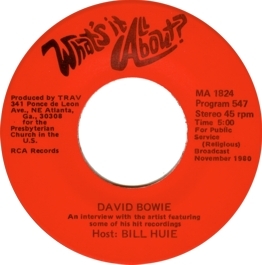 It's a re-issue of a radio show from the previous year. 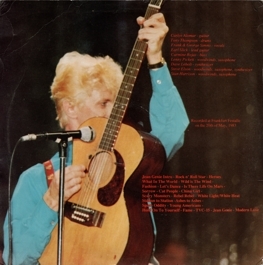 Collector's notes: An audience recording in decent sound quality, released in summer 1983, very shortly after the show (July or possibly even June). 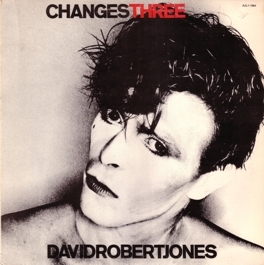 Collector's notes: Obviously, this was meant to be a follow-up to Another Face from 1981. 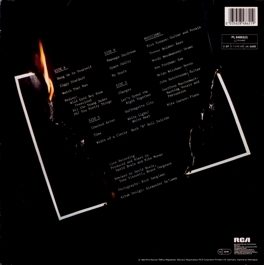 But why are When I Live My Dream and In the Heat of the Morning included on both albums? There is a minimal label variation that has a shorter copyright text at the label margins. 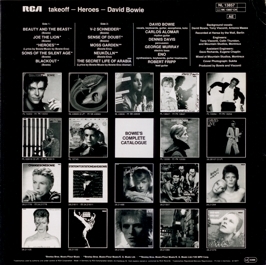 Collector's notes: An RCA compilation that was obviously meant to be something like a tour souvenir: it contains only songs that Bowie played during the Serious Moonlight Tour. Collector's notes: A typical budget re-issue, similar to the German Rock Galaxy set. 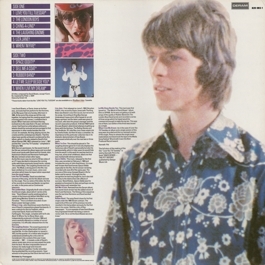 They didn't even bother to provide a fold-out cover, all we got was a meagre insert. 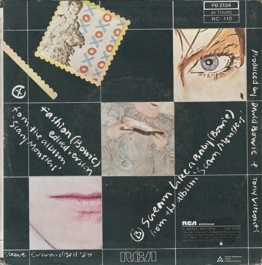 Note that the cover back is actually printed upside down. 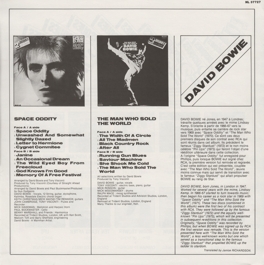 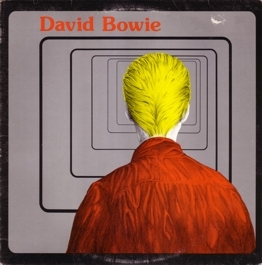 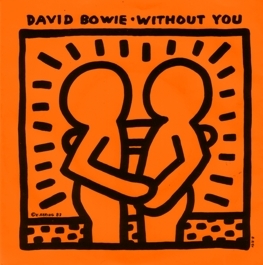 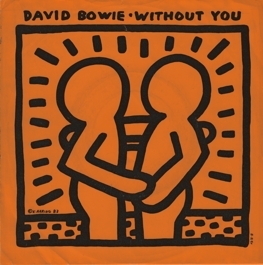 Collector's notes: Another double album compiled of two Bowie classics, comparable to the album from the previous entry or the German Rock Galaxy. 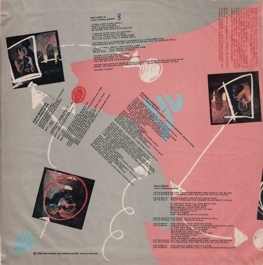 The South Africans didn't spend too much money on the cover design, either: not only does the cover back look exactly like the front, but the inner of the fold-out cover (both halves!) 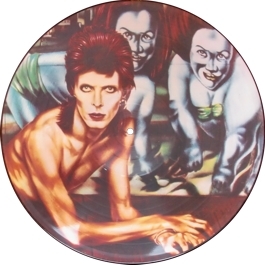 has that design, too. 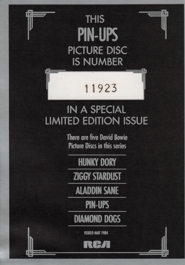 Collector's notes: Call this another superfluous issue... but at least the booklet tacked into the fold-out cover is really beautiful! 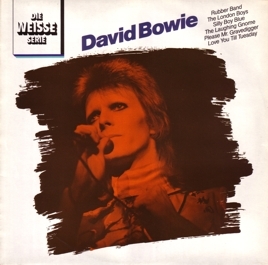 Collector's notes: This album is not really a follow-up to Die weisse Serie because it includes a lot of tracks that had already been on the earlier LP. 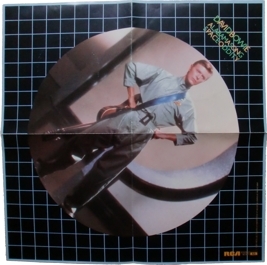 Collector's notes: Only the first copies came with the poster. 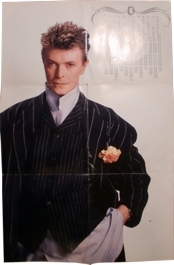 I don't know how limited the issue was, but it seems that the poster is quite rare nowadays: probably most buyers "destroyed" it by using it the way it was meant to be used. 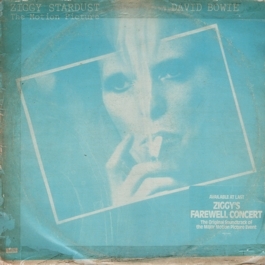 Collector's notes: And finally, here's the official version of Ziggy's "farewell show" from 1973 in great sound quality and almost in its full glory. 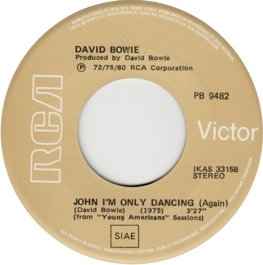 I say "almost" because they didn't include the two tracks featuring Jeff Beck (The Jean Genie/Love Me Do and Round and Round). At least the former of these tracks was available on bootlegs like His Master's Voice. 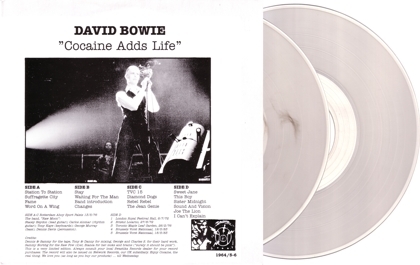 Only 1.000 of the clear vinyl version were made. 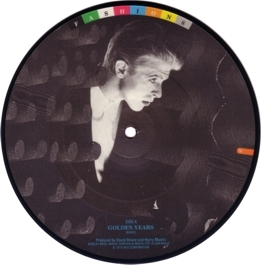 It is sometimes said that they were distributed for promotional reasons only, but they originally came with a sticker on the shrinkwrap that called the album a "collector's item", so these records must have been made for general distribution. 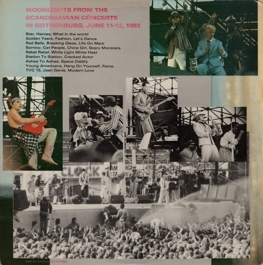 In order to save space I have changed the usual order of pictures and show the back before the inside of the fold-out cover. 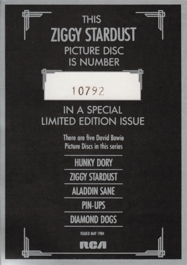 Collector's notes: There are several label variations. 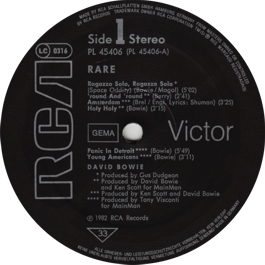 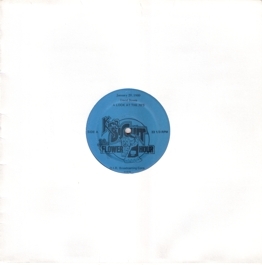 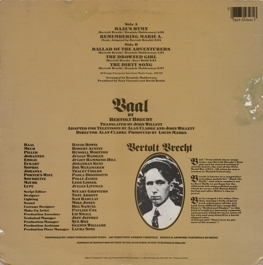 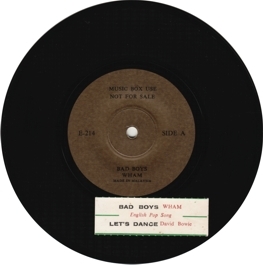 The record shown here (bought briefly after the release) has labels with copyright information under the song titles and "GEMA" and "BIEM" in one box. There are also copies that have the copyright information, but "GEMA" and "BIEM" in two separate boxes, and then there is a variation which is identical to this one with respect to "GEMA" and "BIEM", but lacks the copyright texts. Furthermore, there is a fourth variant with the re-activated "classical" round RCA logo of the 1950s/1960s on the labels. Those must be from 1986 or later, since they refer to BMG on the label, a music group that was formed that year (and re-introduced the old logo). 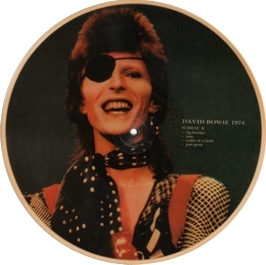 Collector's notes: Another typical South Korean pirate issue. 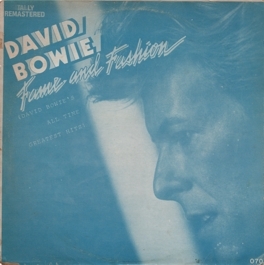 It isn't suprising that it didn't have a gafefold sleeve. 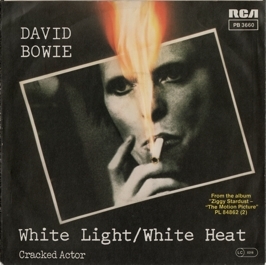 Collector's notes: The cover is unique to the promo issue - there is no reference to the regular B-side Cracked Actor. 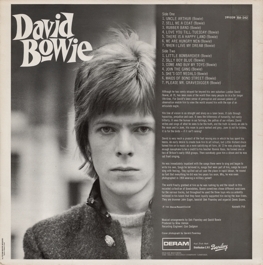 Collector's notes: A decent audience recording in a very professionally made fold-out cover. 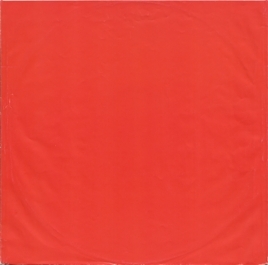 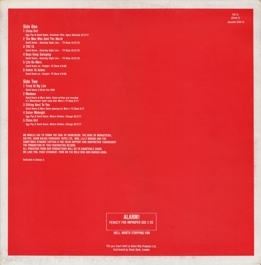 Subsequent pressings were on red vinyl. 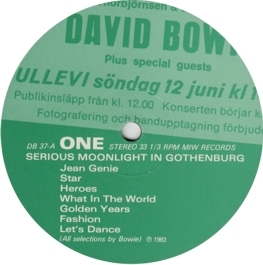 Other notes: live, Nya Ullevi, Gothenburg, Sweden, 12/06/1983; second disc of Serious Moonlight in Gothenburg as a separate album. 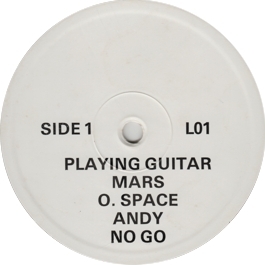 Same label design as in the previous entry. 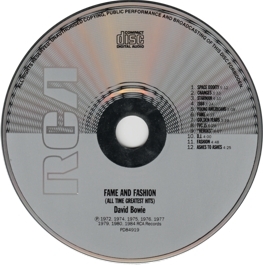 Collector's notes: The "authenticity" of this album is not quite clear (if a bootleg can be "authentic" at all), since this might be a home-made issue. 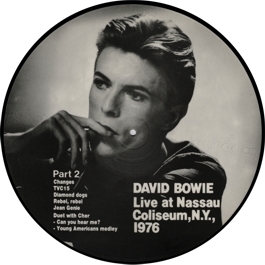 Collector's notes: Another audience recording, but one with a lot of audience noise and a generally poor sound quality. 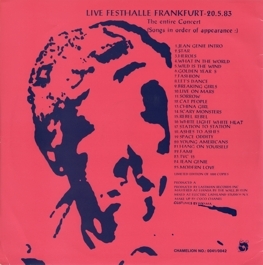 Collector's notes: Part 2 of the Munich show with the same rather poor sound quality. 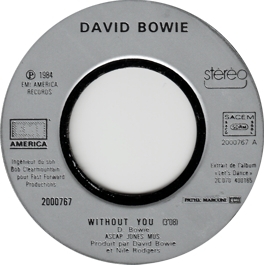 Collector's notes: Another audience recording in acceptable, but by no means brilliant, sound quality. 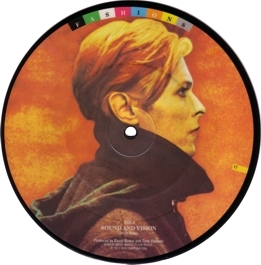 Collector's notes: A beautiful picture disc with an audience recording in acceptable sound quality. 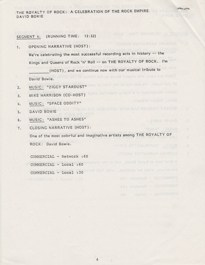 Collector's notes: An awful bootleg. 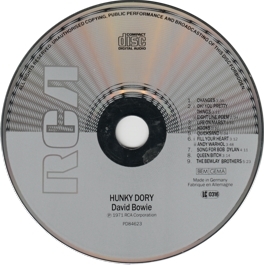 Most of the tracks are taken from some earlier Santa Monica bootleg. 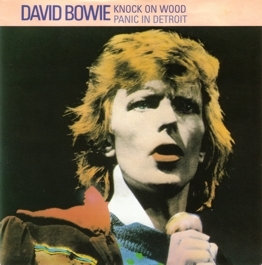 Panic in Detroit is copied from the official 1974 7", and segued into the next track to create the impression that it was from the same show. The sound quality is much duller and generally worse than on other Santa Monica releases, and even that of Panic was much better on the official single. 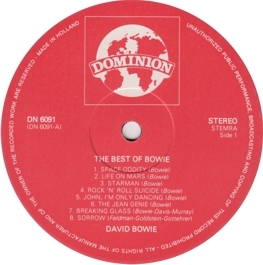 So keep your hands off this bootleg unless you're an absolute completist. 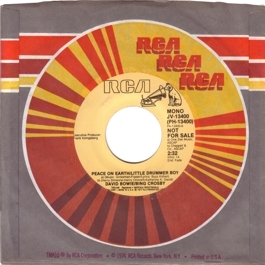 Collector's notes: Same label on both sides. 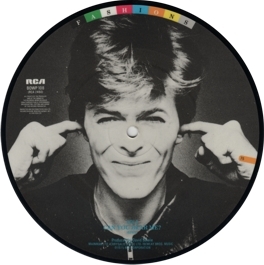 The sound quality isn't very good. Collector's notes: Same excellent sound quality as on the original. On this issue the tracks aren't segued into each other. 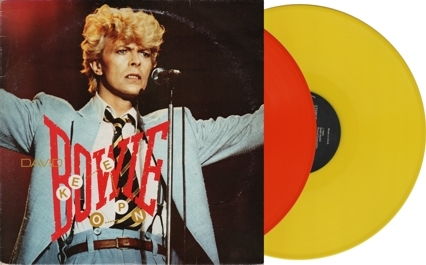 Collector's notes: Strangely, my copy of the black vinyl version has different labels than the coloured issue. 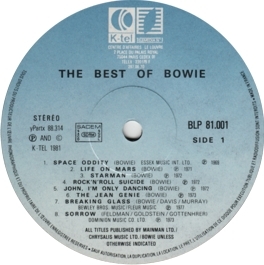 Collector's notes: One of the best Bowie bootlegs in fantastic sound quality! 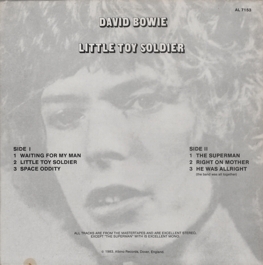 The version of Waiting for the Man and the title track were later issued officially on The Riot Squad's Toy Soldier EP. 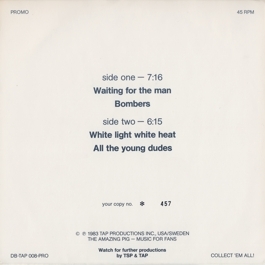 For a long time I had thought that Waiting for the Man was the mysterious December 1966 version mentioned by Pegg, but its presence on the Riot Squad EP shows that it is the later recording. 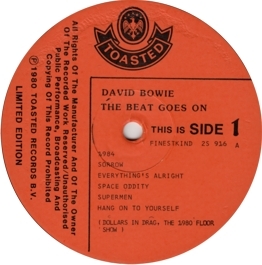 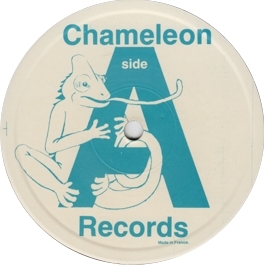 Note that both sides of the record have the B-side label. 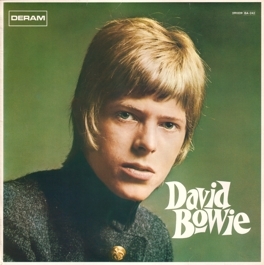 Collector's notes: The sound quality is quite good, especially that of the BBC recordings. 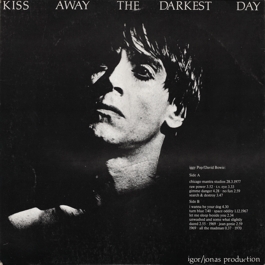 Kiss Away the Darkest Day was the first of a number of bootlegs that combined Bowie tracks with recordings by Iggy Pop, and sometimes (as in this case) recordings in which both were involved. 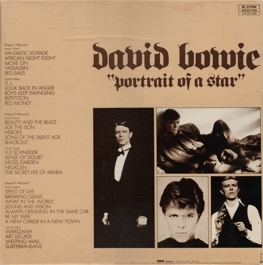 Collector's notes: A nice compilation with good to very good sound quality. Remarkable in particular for the inclusion of the two tracks from the Young Americans sessions in very good quality. 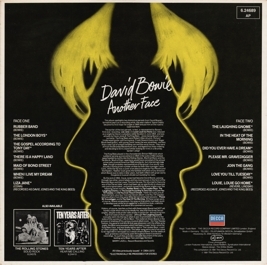 Collector's notes: Another interesting compilation, obviously from the same people who gave us the Kiss Away the Darkest Day, Lost & Forgotten and Alarm albums. 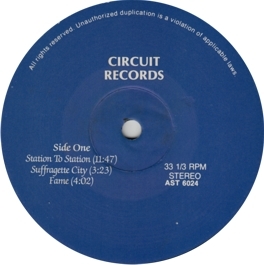 A collection of demos and BBC recordings. 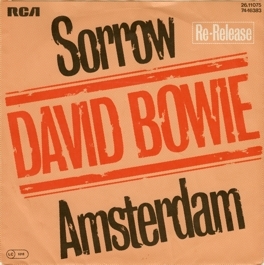 I couldn't determine the exact origin of the version of Amsterdam that is included here. Especially the inclusion of Rupert the Riley and How Lucky You Are made this album interesting at the time. 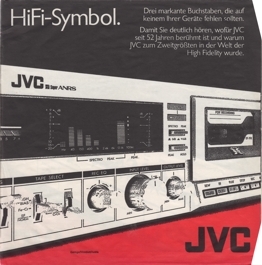 The sound quality ranges from "just acceptable" to "quite good". 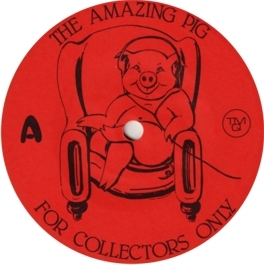 Collector's notes: And another weird compilation with a sound ranging from "just acceptable" to "okay". 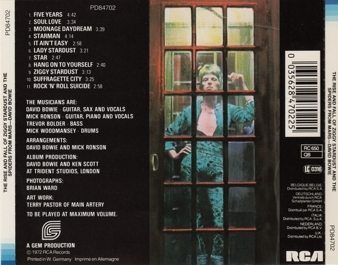 But why did they include the official versions (except for Don't Sit Down, which was quite rare at the time)? 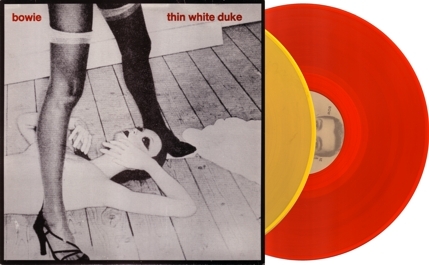 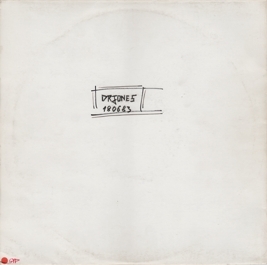 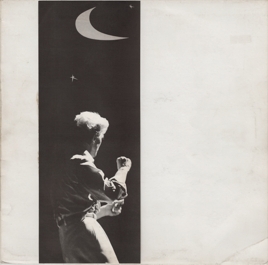 Collector's notes: A re-issue of The Thin White Duke in the infamous "legs cover". 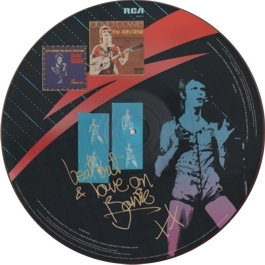 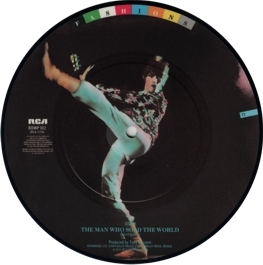 Collector's notes: A nice picture disc version of the album in the previous entry. 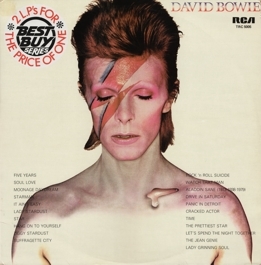 However, the sound quality is slightly inferior. 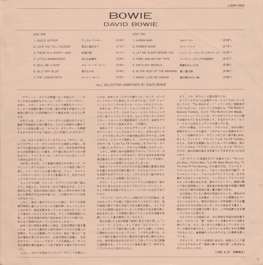 According to Bassman's page, 15 copies had a handmade cover. Collector's notes: Although most of the material on this album was taken from official sources, it was a sensation at the time! 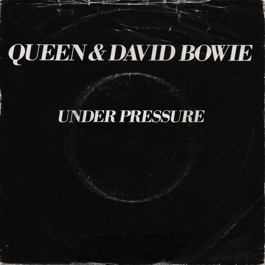 Most of the songs hadn't been officially available for a decade or longer, and the unreleased tracks had an unprecedented sound quality, too. 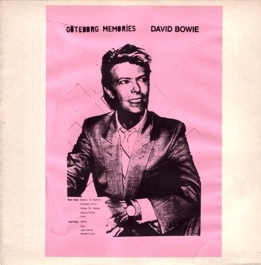 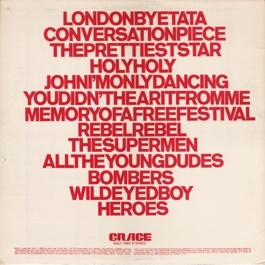 Surprisingly, the only tracks with an unsatisfactory sound were two of the official ones: the two parts of the single version of Memory of a free Festival had been taken from a single that ran terribly off centre. 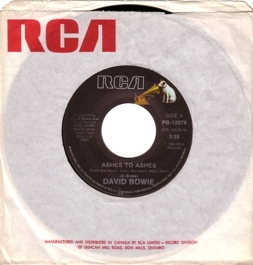 Be that as it may: with its choice of tracks, its mostly fantastic sound, its beautiful cover, and its funny labels that mocked both the RCA logo and label design, this was one of the best Bowie bootlegs ever! 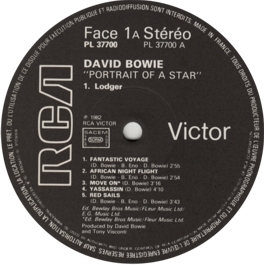 Collector's notes: The Montreal show in fantastic sound quality. 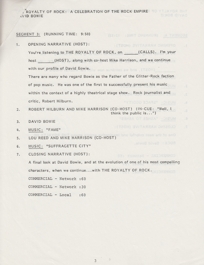 It was recorded for radio broadcast. Note that unlike the Vancouver show, which is available on video and DVD, this show also features some more "eccentric" tracks like Red Sails and I Can't Explain. 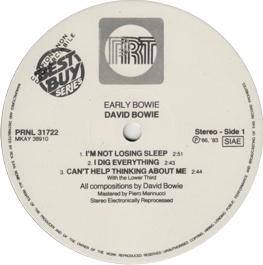 In earlier versions of this entry I assumed that not all tracks on this album were recorded on the 13th, but that some may be from the previous night. 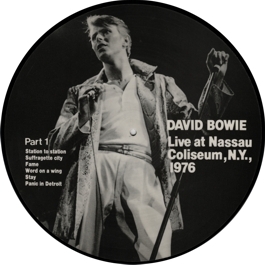 However, in the meantime I have found out that Bowie actually played a very long show on that night (27 songs! 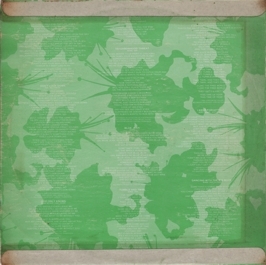 ), so that there is no need for the above assumption. 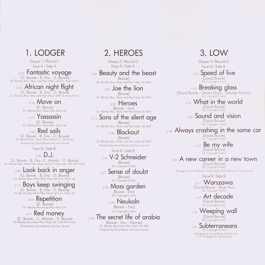 The three missing tracks can be found on the 1985 Best of the Biscuit set. 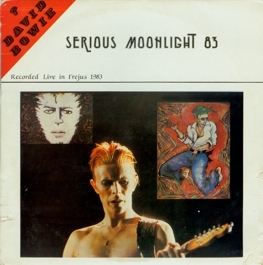 Most of the tracks are also on the Serious Moonlight [Live '83] album from the 2018 Loving the Alien box set. 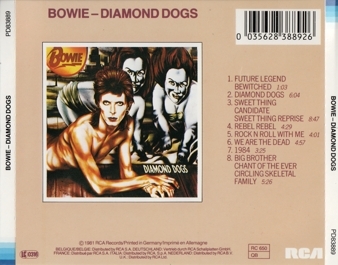 However, since that album is incomplete, the old promo-only albums are still indispensible. 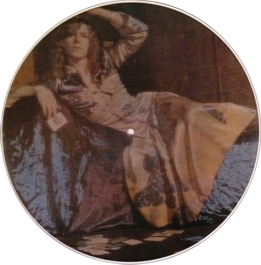 Collector's notes: The picture disc version of the LP can't have been released at the same time as the original album, since the back refers to the Serious Moonlight Tour. 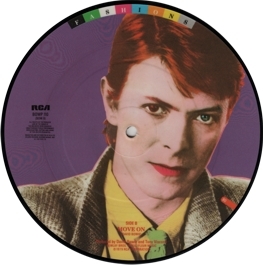 I have filed it under November, because this is when the Japanese picture disc was released. 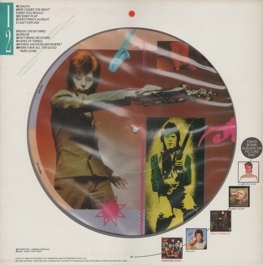 Collector's notes: Unlike the UK issue, the Japanese picture disc had a die-cut cover (and insert) at least. 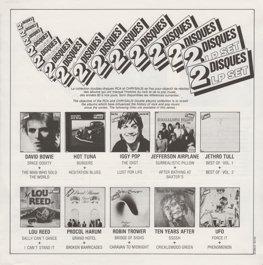 The discs of the two issues are almost identical. Collector's notes: Very good sound quality for an audience recording! 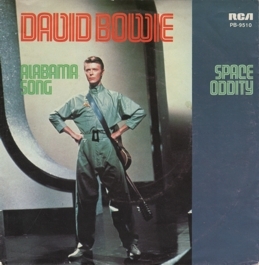 It's a bit difficult to decide under which title this album should be filed. 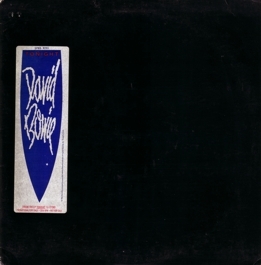 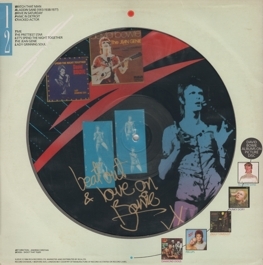 It is an "advance copy" for the Event of David Bowie bootleg, but the only title on the cover is the hand-written DRJONES 180683 on the cover back. 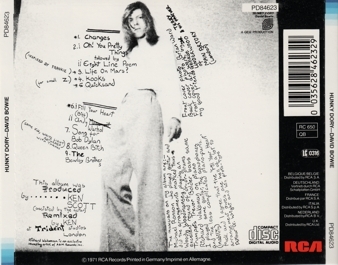 Note that my back insert is different from the one shown on Bassman's site. 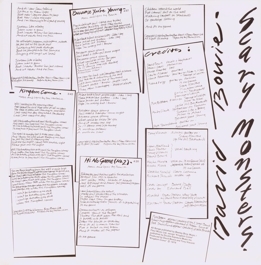 Collector's notes: A very simple bootleg - the (incomplete) tracklist and the title are stamped onto the cover front, the back is blank. 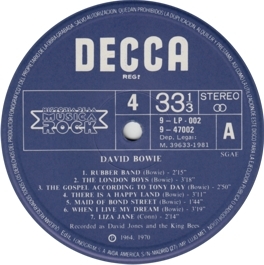 The B-side label is stamped with the same stamp that is used for the cover. 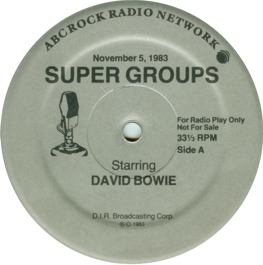 It's an average audience recording, not particularly good. No wonder that this bootleg is usually quite cheap. 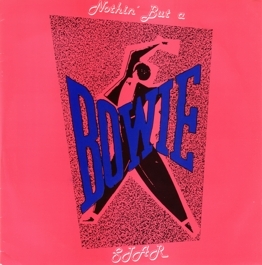 Collector's notes: This is the US issue of the Nothin' but a Star bootleg. 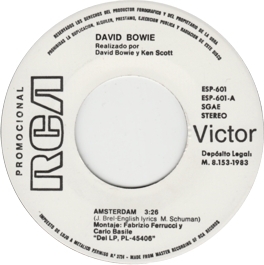 Since it appears to have been copied straight from the European edition, the sound quality is slightly inferior. 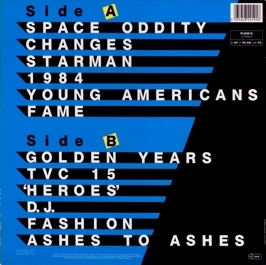 The track listing on the cover is different, but still incorrect. 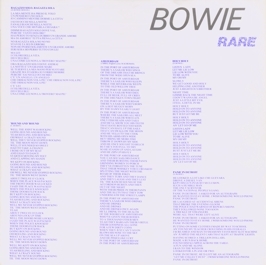 Collector's notes: The sound quality is so-so: Bowie's vocals are quite clear, but the general sound is very thin and there's constant hiss in the background. 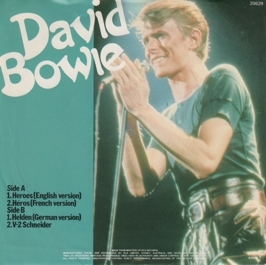 Collector's notes: What is interesting about the French release is that the front and back cover pictures are inverted. 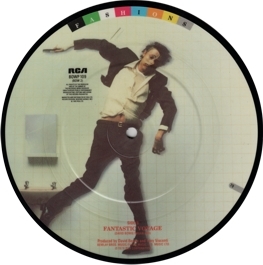 Collector's notes: The first of five beautiful picture discs that RCA released in 1984. 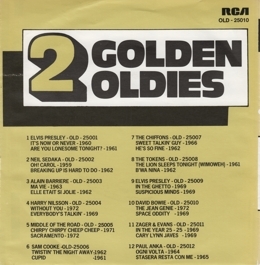 Each issue came with a numbered certificate. 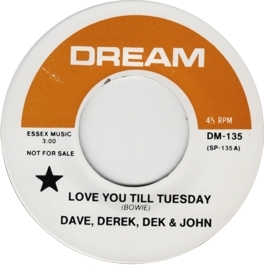 Collector's notes: The soundtrack to the re-released Love You till Tuesday movie from 1969 contains a lot of material that was previously unavailable, but also some stuff that is not related to the film at all. 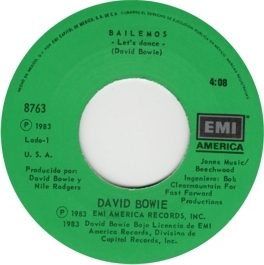 Collector's notes: There is also a variation with the running speed on the labels (which are otherwise identical). 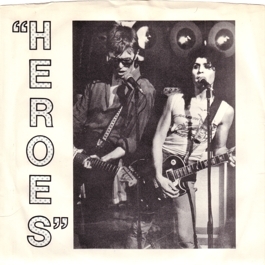 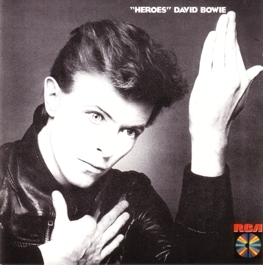 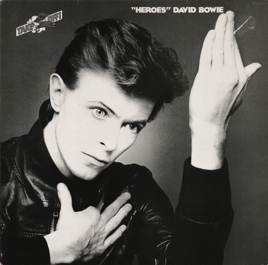 Collector's notes: Still, the only interesting thing was the French version of the "Heroes" album. 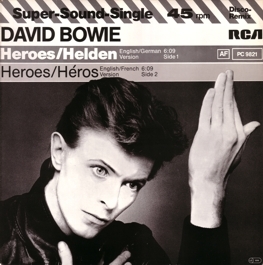 Originally I wrote that this was the only German release of "Heroes" with the French version, but there was also a separate German issue of that album (RCA NL 83857, also from 1984). 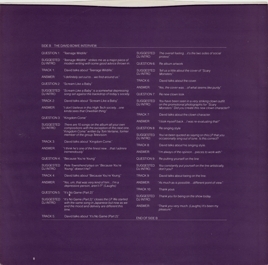 The back of insert 2 is plain white. There is an alternative German issue of this box set, which has a different French price code on the back, no info sheet (just the photo insert), and "GEMA" and "BIEM" in reversed order on the labels. 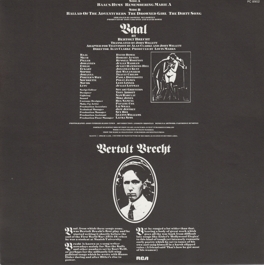 The fact that "BIEM" is on top here might indicate that this issue was primarily aimed at international distribution (although it was bought in a German record shop). 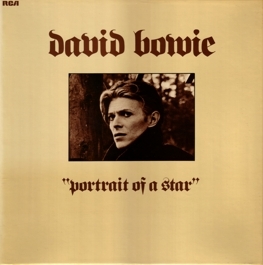 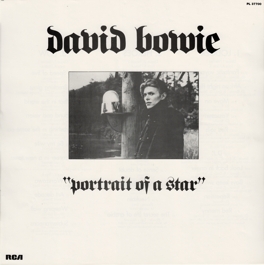 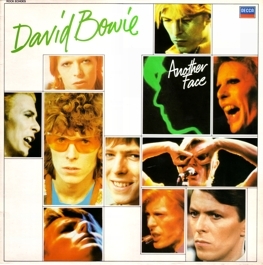 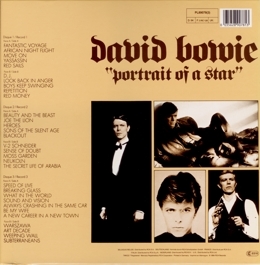 Collector's notes: If we assume that there was any logic in the way RCA numbered their records at the time, then this German release must have been issued after the German Portrait of a Star, which has a slightly lower catalogue number, and is definitely a 1984 release (as the fineprint on the cover shows). So now we had a German re-issue of a Dutch re-issue of an already superfluous Dutch LP. 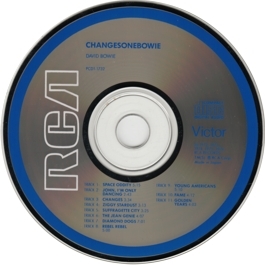 Collector's notes: As regards Bowie's European RCA CDs, a number of general notes are in order here. 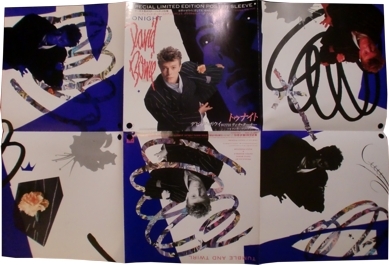 First, I have listed these as German releases, because that's were the booklets and inlays and most discs were made (except in four cases, in which the discs were imported from Japan). However, this does not mean that these were Germany-only releases: they were distributed all over Europe. 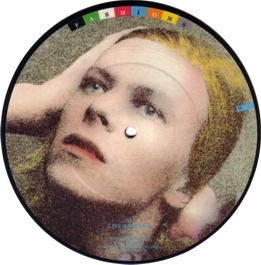 Second, there has been a lot of confusion about the release dates. General discographies (like Strong) tend to link the release of the CD issues to the re-release of the vinyl issues. 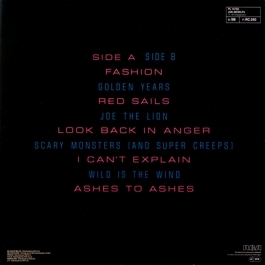 The release dates might, in fact, co-incide in some cases, but if this is true, it's only accidentally. 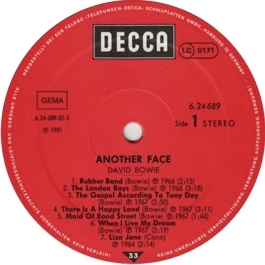 Fortunately, Rob Davison, former co-ordinator of RCA Europe's CD programme, has helped to set the record straight. According to Rob, all the European RCA CDs (with the exception of Stage) were released in mid to late 1984. 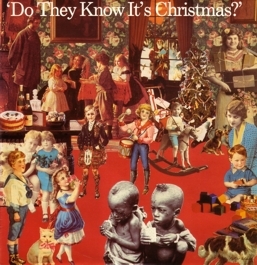 This is why I have listed them all under September 1984 (I could equally well have chosen August or October, of course). 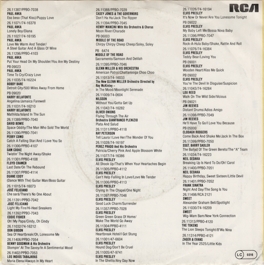 The exact order of releases isn't known, so I have listed them in the order in which the vinyl albums were originally released by RCA. 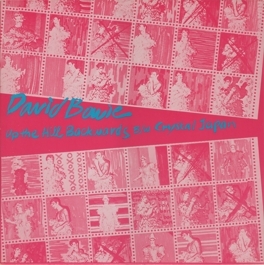 Collector's notes: There are also copies with red stripes on the spine. 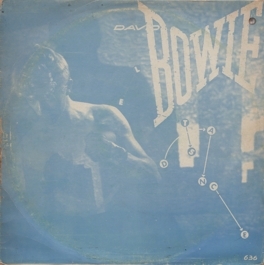 These might be early pressings, since the copies with blue stripes are commoner. 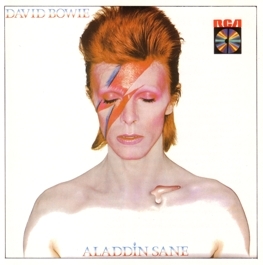 Tracks: Aladdin Sane (1913-1938-197?) 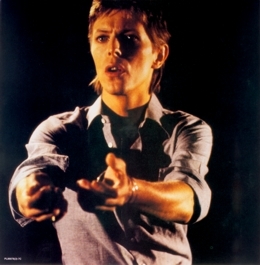 / Oh! 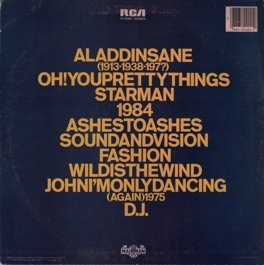 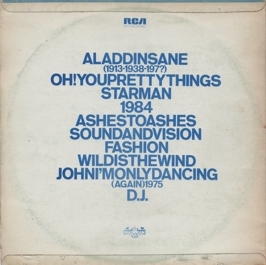 You Pretty Things / Starman / 1984 / Ashes to Ashes / Sound and Vision / Fashion / Wild Is the Wind / John, I'm Only Dancing (Again) (1975) / D.J. 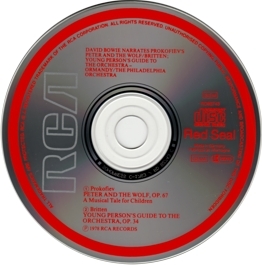 Collector's notes: Note that this CD is a bit unusual in that it neither states the country of manufacture, nor the copyright society on the disc. 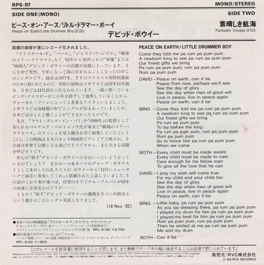 Collector's notes: EMI Japan varied their general design of single covers at the time. 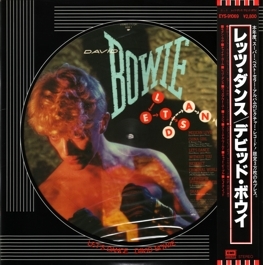 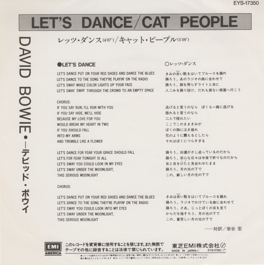 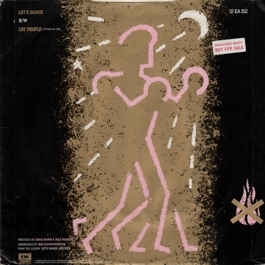 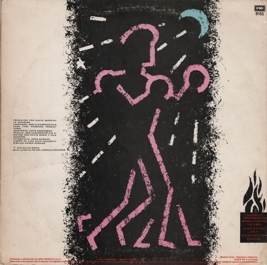 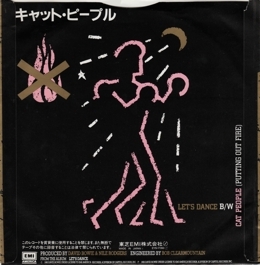 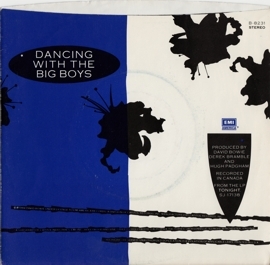 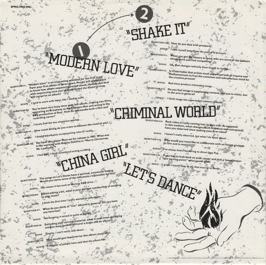 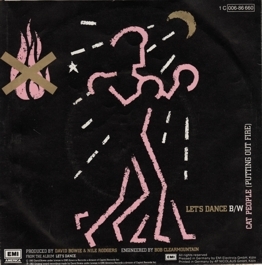 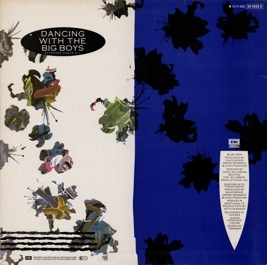 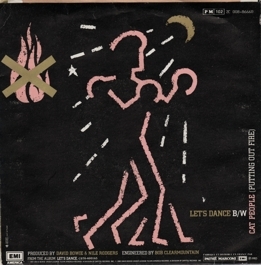 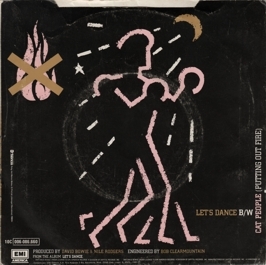 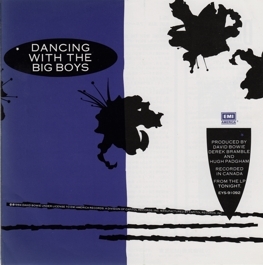 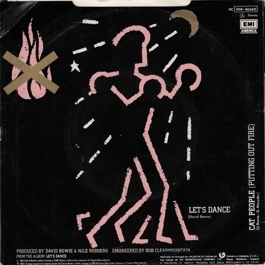 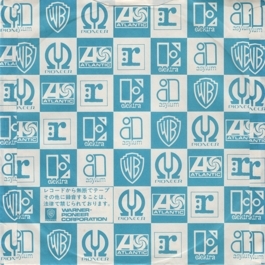 The Japanese issue of Let's Dance had already had a closed cover as had been common in most other countries for decades (rather than an insert with a company bag). Tonight had the old company bag, but also a wraparound insert providing a front and back cover. 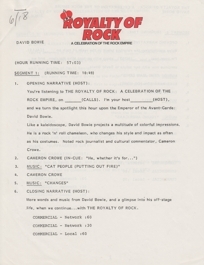 Collector's notes: This issue is a bit difficult to classify. The cover says it's made in Holland (which is why I have classified it as a Dutch release), but the text on the labels is mostly in German and the German copyright association "GEMA" is highlighted. So this release, which was primarily sold in Germany, could equally well be classified as a German issue. In fact, there is no other dedicated German release of this album. Collector's notes: Unlike the Mexican release, which has the Spanish title only on the label, the Argentine issue calls the album Esta Noche on both label and cover. 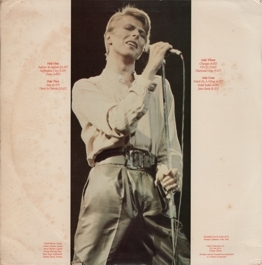 The white stains on the inner sleeves are tears, probably due to some water damage or something like that. 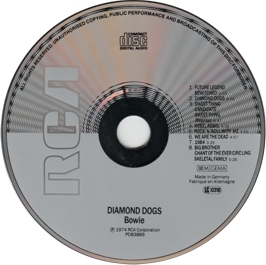 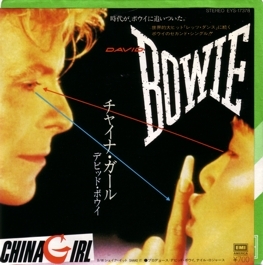 Collector's notes: Like the European CD issues, the US releases of Bowie's RCA CDs often came with discs made in Japan, but these had a different design. 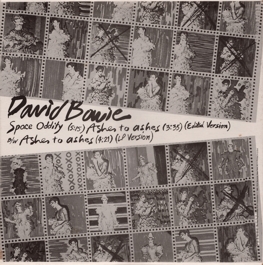 Collector's notes: The third and fourth picture show the unfolded outer and inner of the cover, respectively. 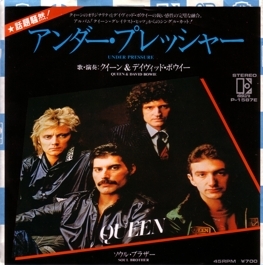 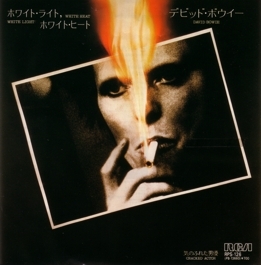 Almost the same poster cover was used for the Japanese issue. 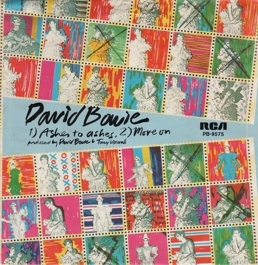 Collector's notes: Note the brighter colours of the Portuguese cover. 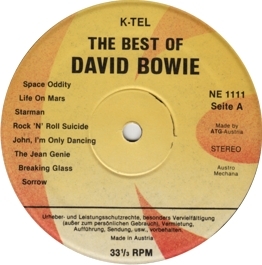 Collector's notes: Another bootleg compilation, this time in good to very good sound quality. 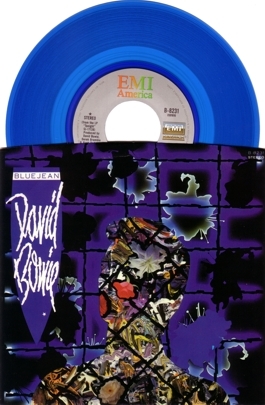 Copies with a blue cover are also quite common. 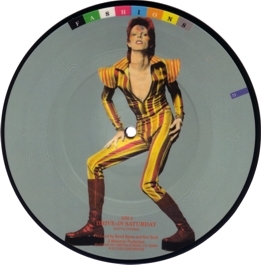 Whether or not the Iggy tracks were necessary is a matter of taste, but especially the inclusion of the tracks from the Saturday Night Live show (which were not live, but pre-recorded) is nice: you can clearly hear Klaus Nomi in the background. 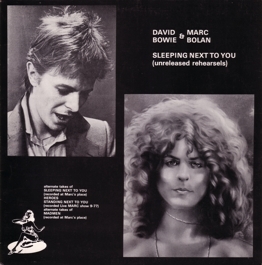 The Bowie/Bolan collaborations were explored in more detail on another bootleg, but are in slightly better sound quality here. 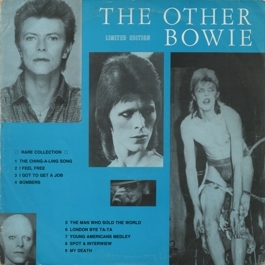 Collector's notes: This is the blue cover version, apart from that (and the stickers on the cover front and back) it is identical to the issue in the red cover. 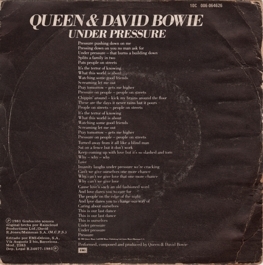 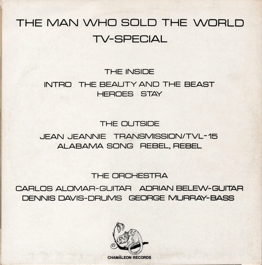 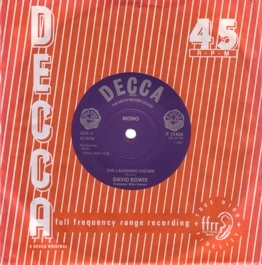 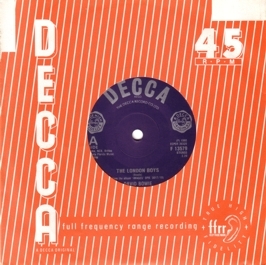 According to Bassman's page, the presence of the front cover sticker indicates an early pressing. 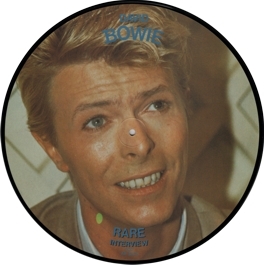 Note, though, that the information on this sticker is wrong: the record does feature Iggy Pop and Marc Bolan, but Brian Eno is nowhere to be heard on it. 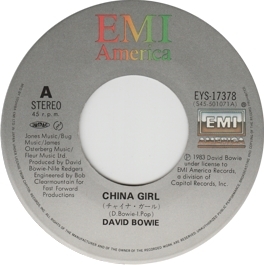 Collector's notes: This is one of the worst bootlegs in my collection! 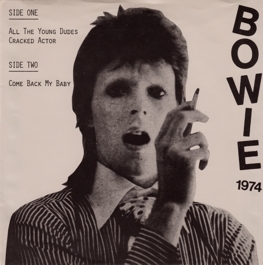 Most of the songs are taken from the semi-legendary Cracked Actor documentary (which is nice, but not half as exciting as "Bowie-lore" has it). Most of the Cracked Actor tracks are snippets, rather than songs (only Space Oddity and the second take of Time are really complete), and the sound quality is terrible. 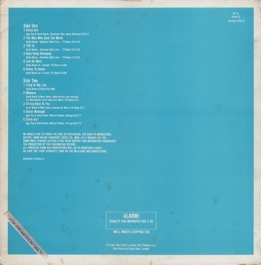 They even included the snippets from the "farewell show" that had officially been released in perfect quality and full length the previous year! 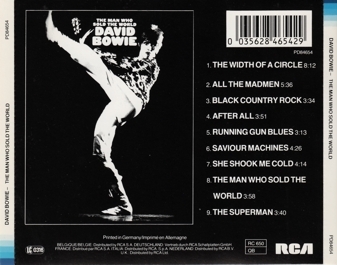 The two BBC tracks sound a bit better, but were absolutely superfluous at the time. 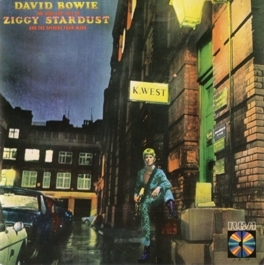 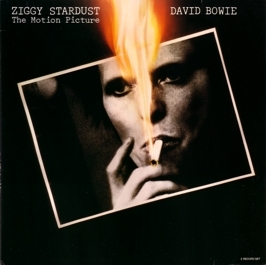 The only thing I couldn't identify is the second "version" of Ziggy Stardust, but who cares? It's a snippet of about 35 seconds. 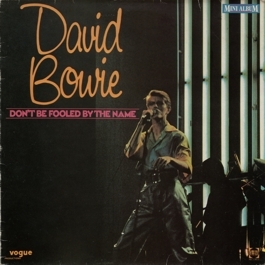 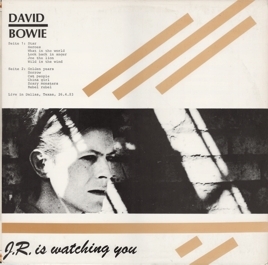 Don't Be Afraid (which has a horrible sound quality, anyway) has been exposed as a non-Bowie track. 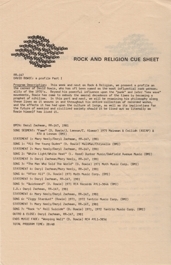 See here for details. 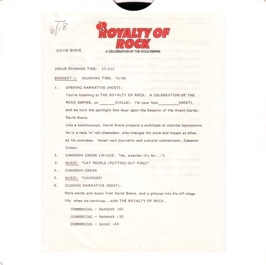 Collector's notes: A rather rare bootleg; it's the complete show. 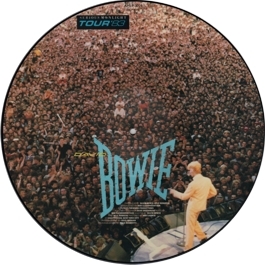 Frifelt claims that this is one of the best bootlegs from the tour, but by and large, it's just an average audience recording. 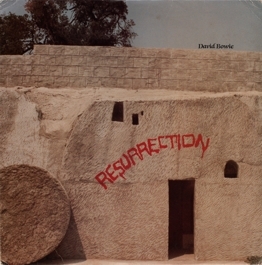 Collector's notes: The final vinyl re-issue of the legendary Resurrection on 84th Street bootleg. The sound quality is comparable to that of the original, but apart from that it's not a very exciting release, especially because it lacks the Bowie/Cher bonus tracks that were included on the various issues of the The Thin White Duke bootleg. 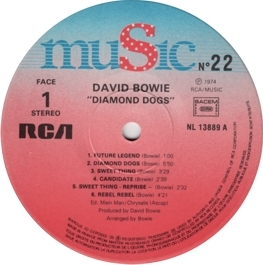 Collector's notes: Whether you considered this album to be a bore or a nice addition to your collection depended on what you had in your collection. 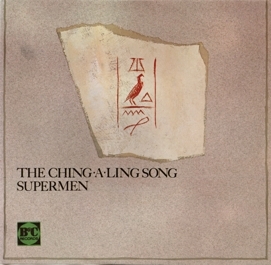 The full-length version of Ching-a-Ling was still quite rare, and so were the 1964 interview and the Young Americans medley with Cher. The sound quality is good to great for the most part. 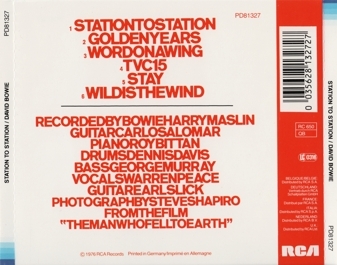 Only the two tracks from the Kingston Polytechnic sound awful. 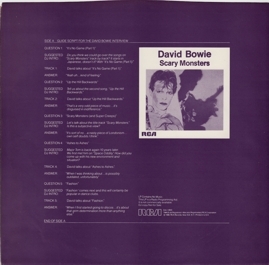 According to the cover back, the coloured vinyl issue is limited, but unlike the black vinyl version, my copy of the purple pressing doesn't bear an individual number. 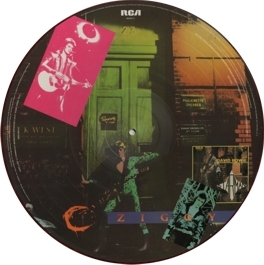 Note that the covers of the two issues are also slightly different: whereas the purple vinyl version has "Limited Edition Colored Vinyl" on the back, the black vinyl issue only has "Limited Edition". 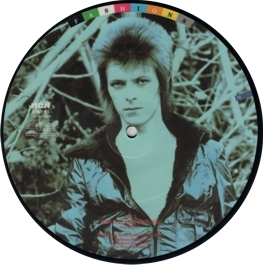 Collector's notes: This is the standard edition in black vinyl. Different labels with individual number on the A-side. 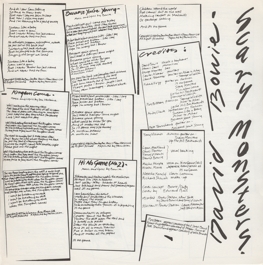 Collector's notes: A 2008 re-issue of an album that had first been released in 1984. 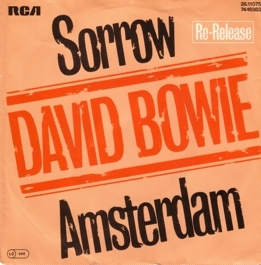 The sound quality of the Rotterdam show is okay, but far inferior to that of the New York show on the Resurrection on 84th Street bootleg. 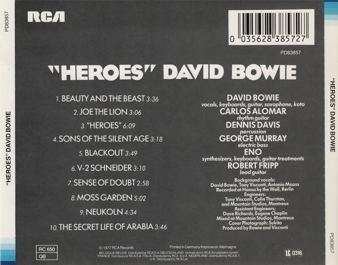 The sound of the rather eccentric mix of bonus tracks varies. 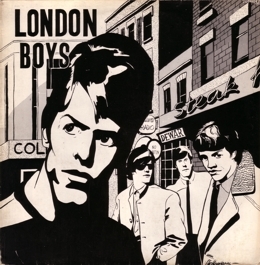 That of the most interesting song, the Beatles cover version This Boy, is rather bad, but seems to be due to the quality of the original tape. 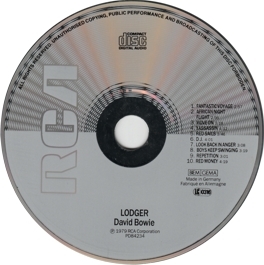 Collector's notes: The sound quality is quite poor.